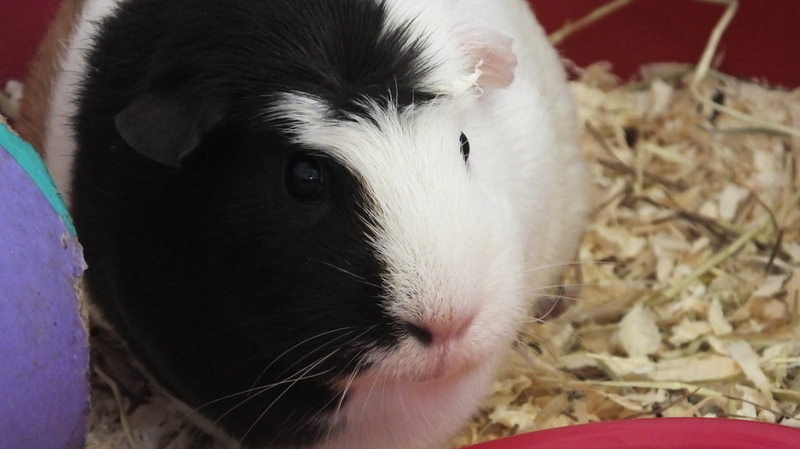 Skittering Pig is a home from home small animal boarding and home visit service located just off Junction 15 of the M1 in Grange Park, Northampton. 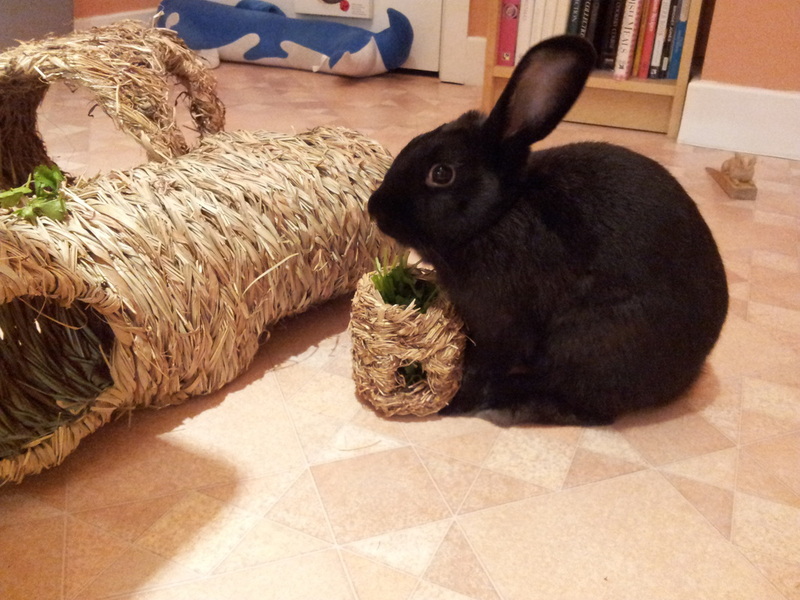 ​A little gentle reminder to owners boarding their bunnies. 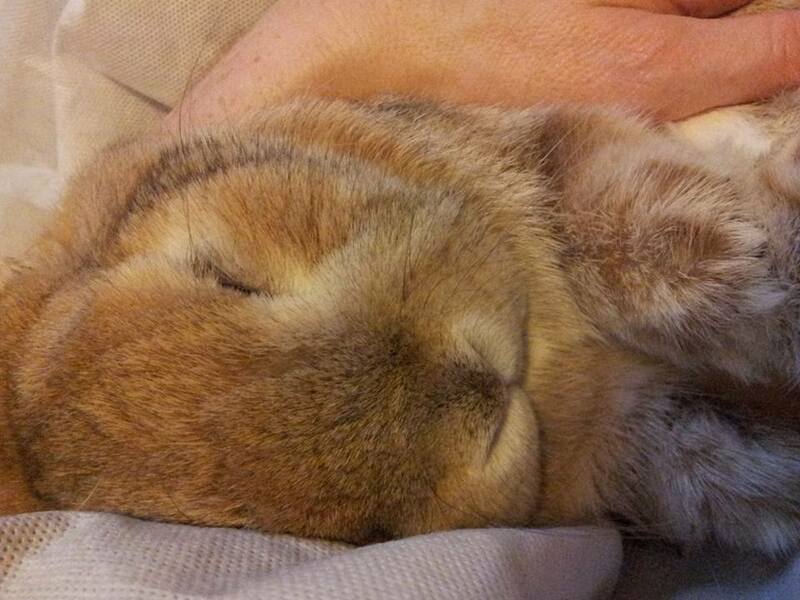 All bunnies need to be vaccinated against RHVD1, Myxi & RHVD2, we will NOT accept non vaccinated bunnies. All male rabbits over 16 weeks need to be neutered we don't take entire males and ideally all females need to be neutered too. To all my wonderful rabbit parents. 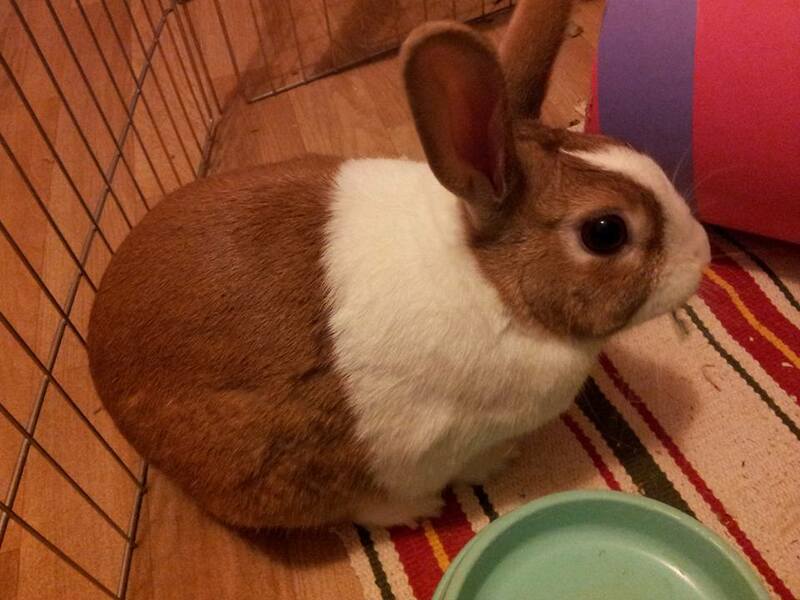 I am urging anyone who has a female bunny to get her spayed. I have seen over the last few weeks female buns who are stressed due to the fact its Spring and they think they should be raising a family. They have been over grooming their partners, themselves, making nests not to mention changes in temperament and spraying which can land in other pens and up the walls! Its not fair on them, creates issues between partners as well as distress. Yes its coming that time of year! The cute little Easter bunnies everywhere, but Please I say this every year. STOP & THINK before buying a real one. 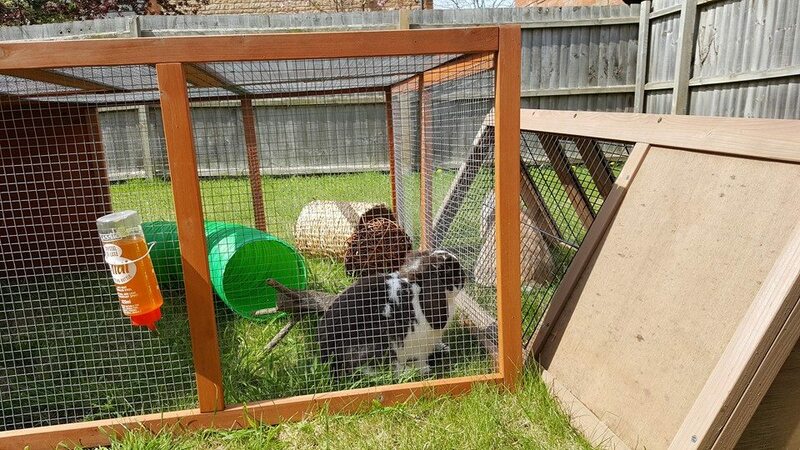 If you can not offer a rabbit an accommodation of at least 8ft with run area (the bigger the better), food, vet bills (both sexes need neutering and vaccination plus illness) and your time everyday in all weathers or time interacting if house rabbit for a minimum period of 10 YEARS!!! DO NOT BUY!! A rabbit is a living, breathing being that has emotions, is very intelligent and can feel pain they are NOT TOYS to be left when the novelty wears off! 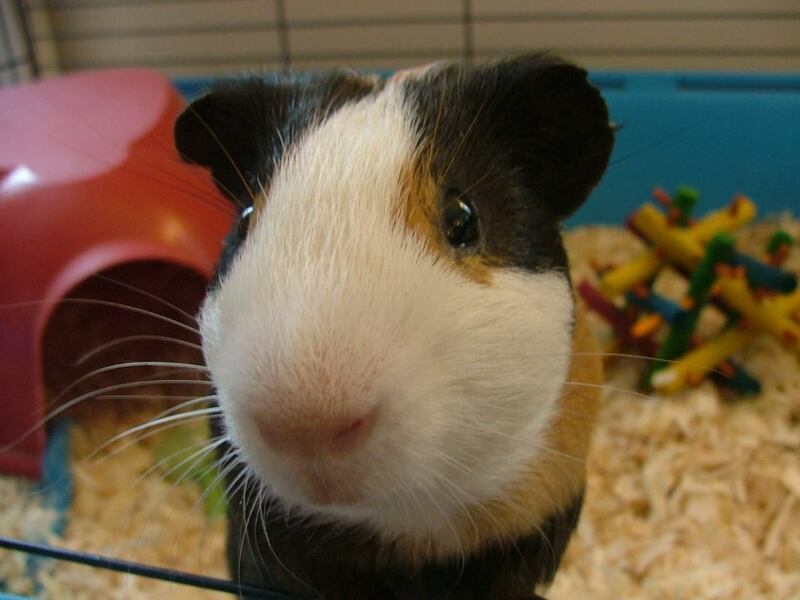 Think before you buy, the same applies to guinea pigs too! 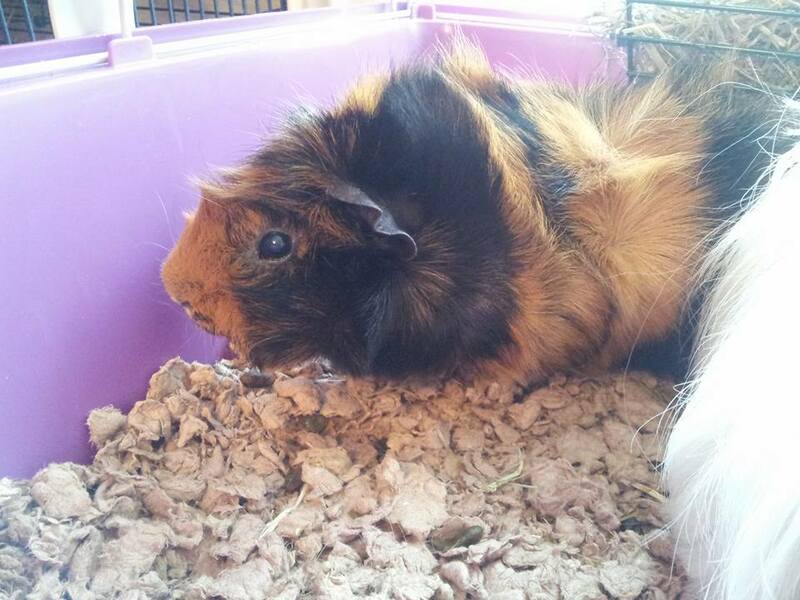 This week we had some sad Rainbow Bridge news for two piggies Biscuit & Rocky. Our thoughts got to their piggy parents and family. 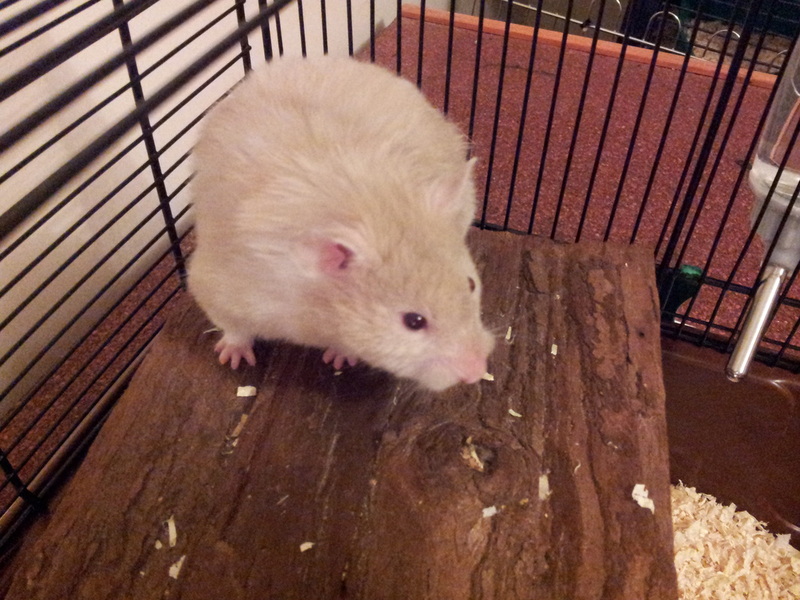 After the passing a couple of weeks ago of Louis, we are sad to say that old man Squeak has gone to play with him. Our thoughts as always are with their families. Yay! some sunshine! the piggies and buns have been enjoying the spring sunshine, its lovely to see them out hopping around and the piggies 'popcorning'. We are taking bookings for half term, Easter ,August and even Christmas! as a small boarder I have limited space so book as soon as you have your dates. We also offer home visits too, again try to book as early as possible. We have been having a few issues with the direct forms from here, please if you have tried to contact us recently through this method, could you get in touch by directly contacting us ie email/phone/text. Its never too early to think about booking those Summer holidays, dont forget your small furries! get in touch to book your fur babies in or we can come to you! Has been won by Leona Marshall, mum to Batman, Pepper, Ronnie & Gus. Congratulations! 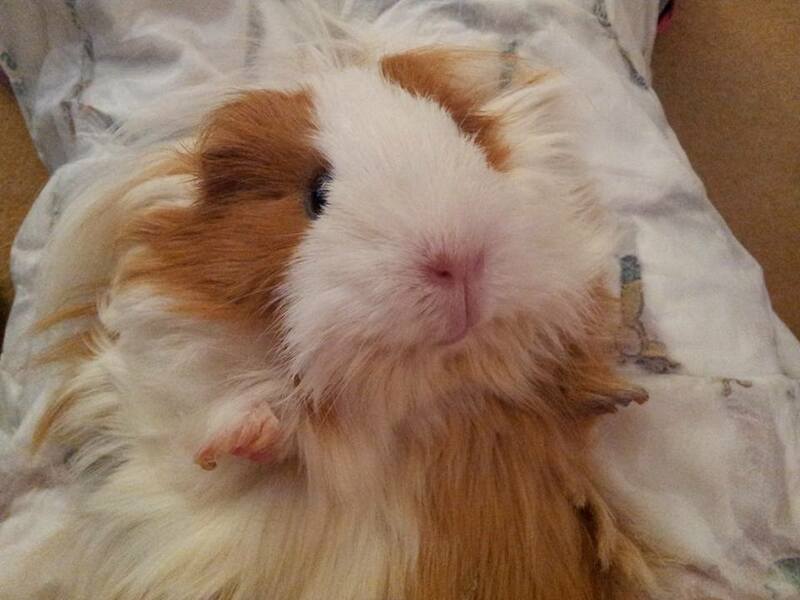 and I am sure your piggies are going to love the treats. 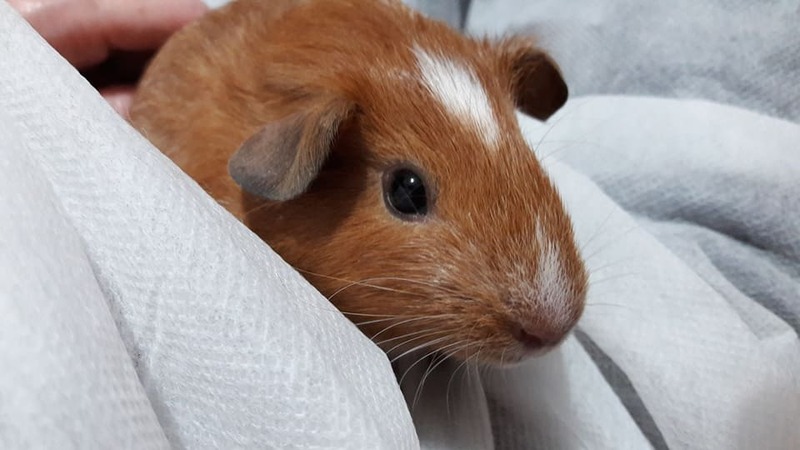 We also at present have raise in the region of £150 for The Excellent Adventure Sanctuary (for guinea pigs with extra needs) big Thank you to all who took part. As from the 1st January there is going to be a slight price increase to reflect the various accommodations we offer. Please note if you have already booked there is no increase. We have set up a Just Giving page. 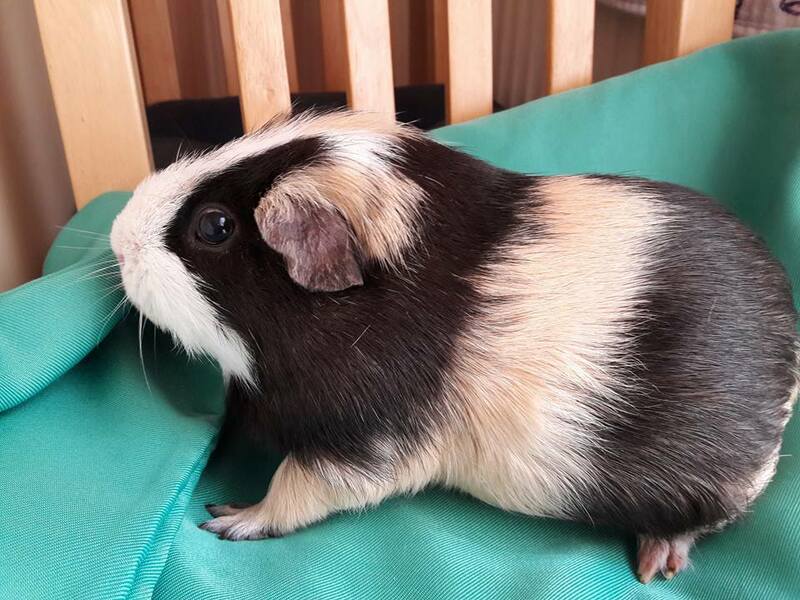 https://www.justgiving.com/crowdfunding/julia-spence please donate to help piggies with special needs, vet bills, food etc also you will be entered into our Christmas raffle. I am going to raffle a hamper for pigs or buns, to enter I am going to add a donate button, you can donate direct of their Facebook page, PayPal or bank transfer and all monies will go to TEAS. You can of course call by and get a physical raffle ticket. All tickets and names will go into a box and be picked on Christmas eve. I am asking for at least 50p per ticket but please donate what you can to help special needs piggies. Halloween & Bonfire night boarding, due to these being stressful evenings, there will be no drop offs or pick ups. 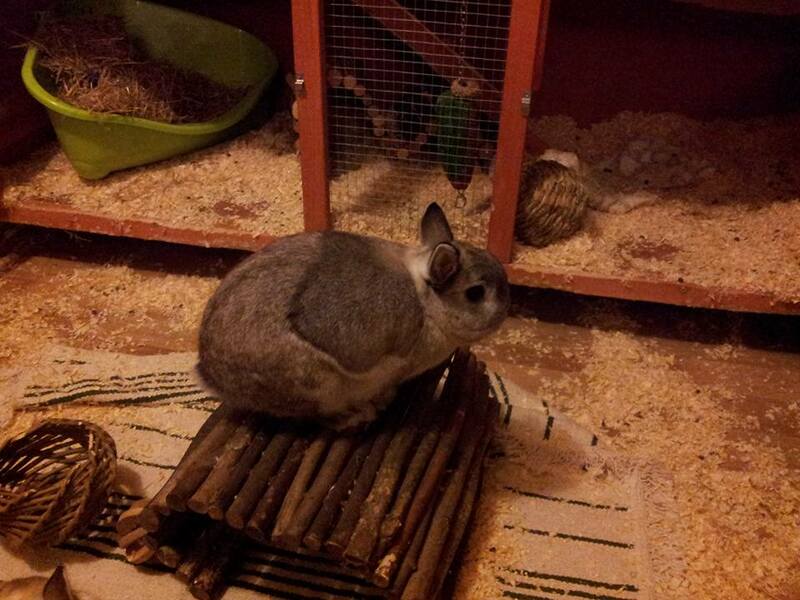 Places going fast I have 1 rabbit pen vacancy and only a few piggy places left! 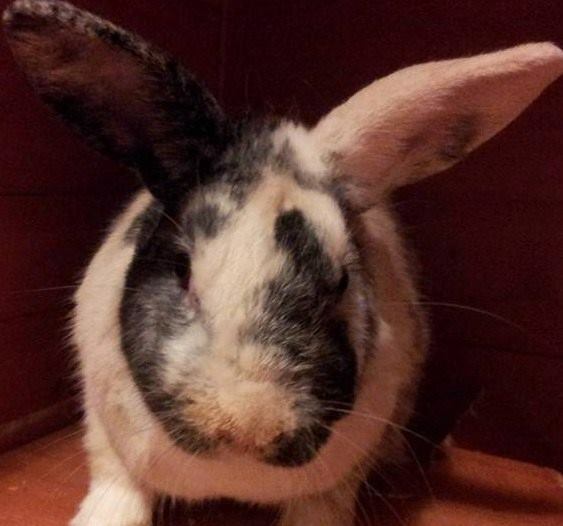 Due to a possible RHVD2 related death in the area, I am making it a requirement that ALL boarding rabbits must be vaccinated against this terrible disease. I will give until 19th October for this to be carried out. There will be no exceptions this disease is highly contagious and deadly. I therefore can not and will not put any ones rabbit in jeopardy. I very much hope that you will all help to work towards getting rid of this disease and keep our rabbits safe. 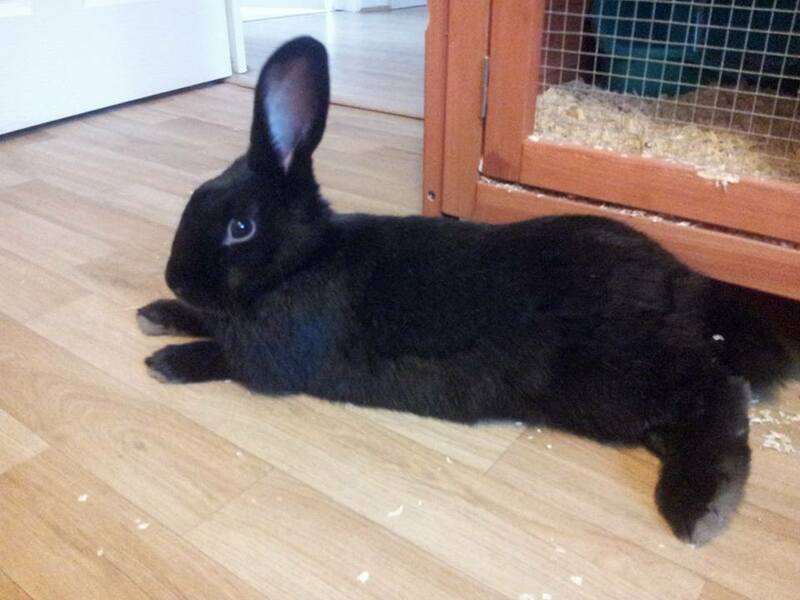 I also require all male rabbits over 16 weeks to have been neutered. 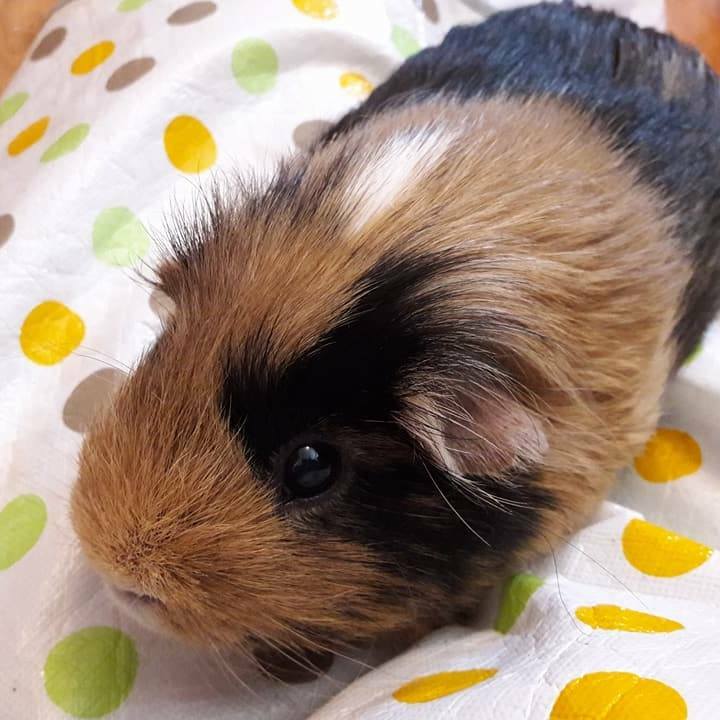 We are normally wishing a speedy recovery to piggies and buns, but today we are wishing a speedy recovery to a piggy mummy, she is a lovely lady and we wish her well. 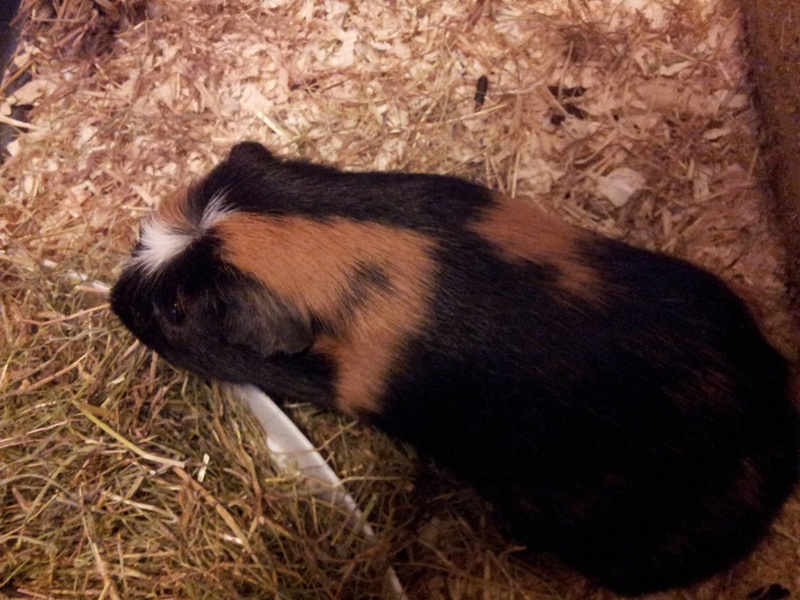 Julia looked after our piggies by visiting them at our home whilst we were on holiday. 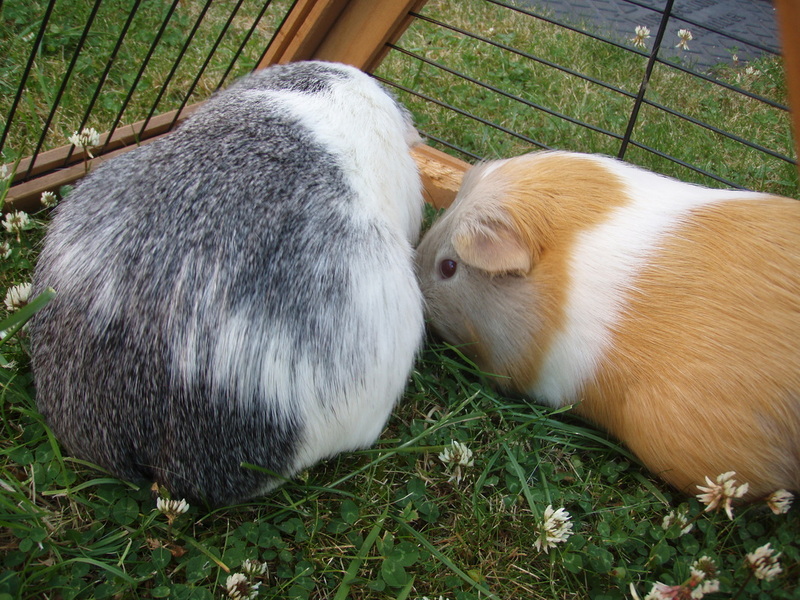 We were away for a week and during that time our piggies experienced both hot weather and a storm. Julia went above and beyond to make sure they were comfortable. Well all boarders did just fine over the hot spell, the use of fans, water bottles and open windows made every one cool and relaxed. While it may be lovely for us for our furry friends it's not so great! As we head to another hot weekend please keep buns & pigs cool by being inside or providing them with lots of shade and cold water bottles. Make sure air can circulate or provide them with a fan. 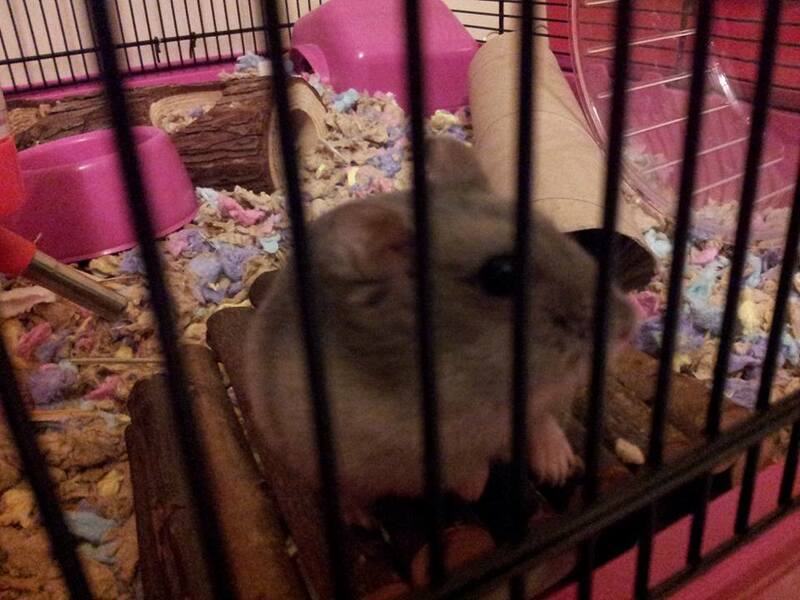 Julia looked after our daughter's two hamsters for almost two weeks whilst we were away. She kindly emailed us when we were away to let us know how they were (which my daughter especially appreciated). 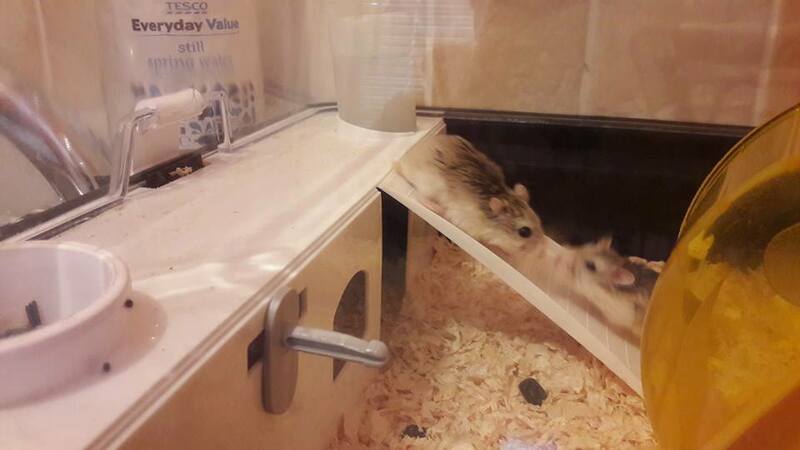 Our two hamsters returned home refreshed from their own little holiday! Thank you Julia. We definitely recommend the Skittering Pig! We now have Grain Free nuggets for both rabbits and piggys. If you would prefer your fur babies to be given this just let us know. 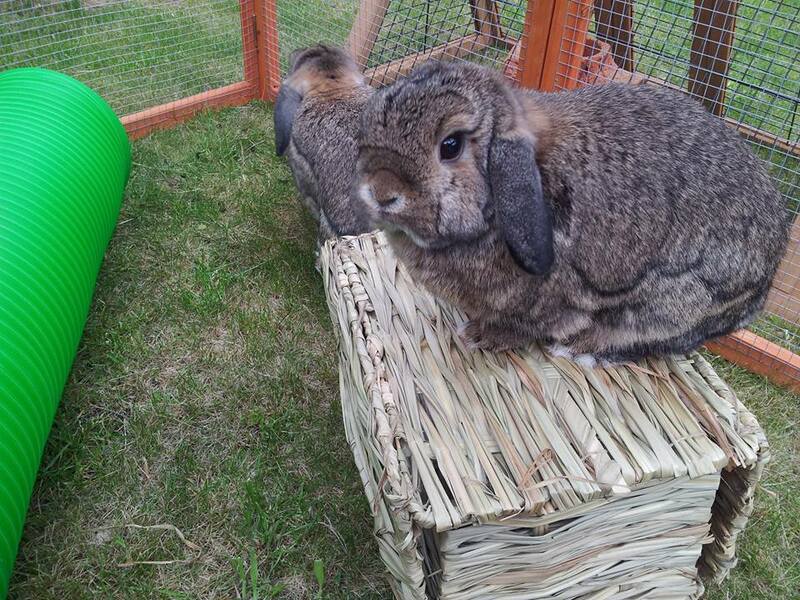 ​We are getting very busy over the Summer and currently have no spaces for rabbits from July through to September! 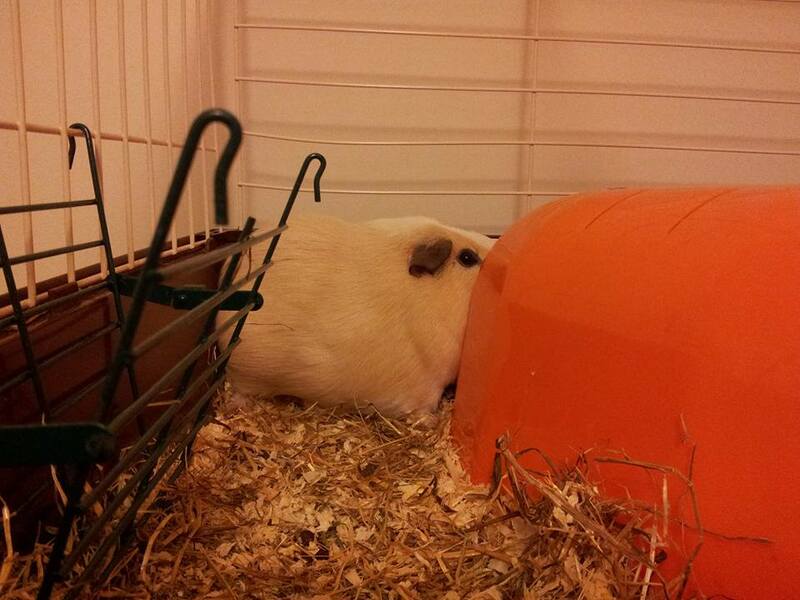 We do currently have piggy spaces. 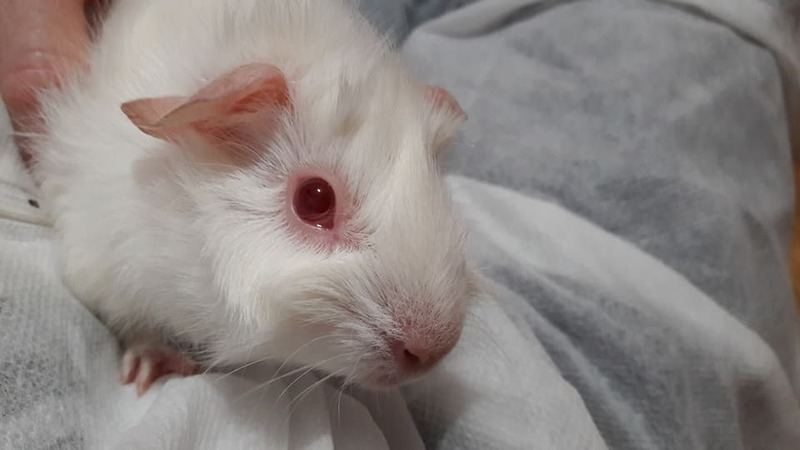 Elderly piggy Bubbles was found in his furever sleep, sleep tight little man. Here at Skittering Pig we have been updating our Terms & Conditions to co inside with new data protection laws and also the boarding of rabbits. 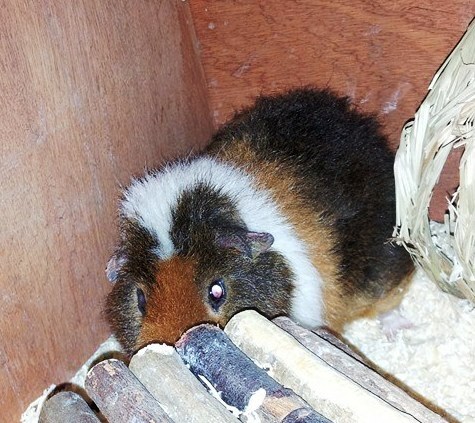 Skittering Pig requires that all rabbits need to be vaccinated for Myxomatosis and RHVD1. 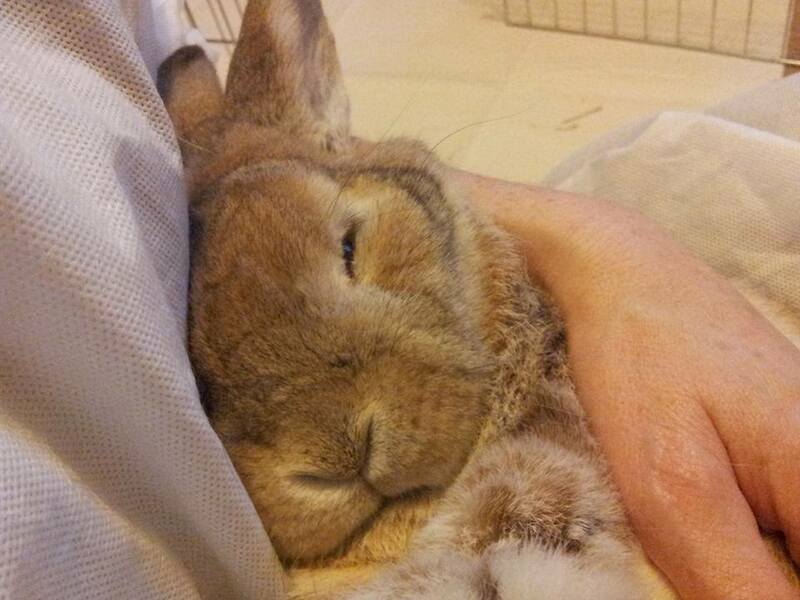 Ideally we ask that your rabbit be vaccinated against RHVD2. We also ask that you bring with you a current vaccination certificate. 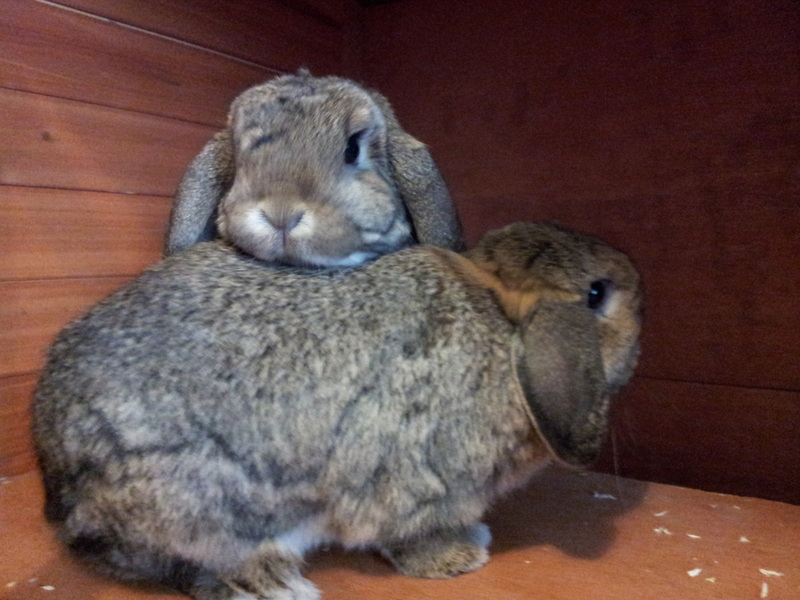 We reserve the right to refuse non vaccinated rabbits and also where evidence of vaccinations cannot be produced. 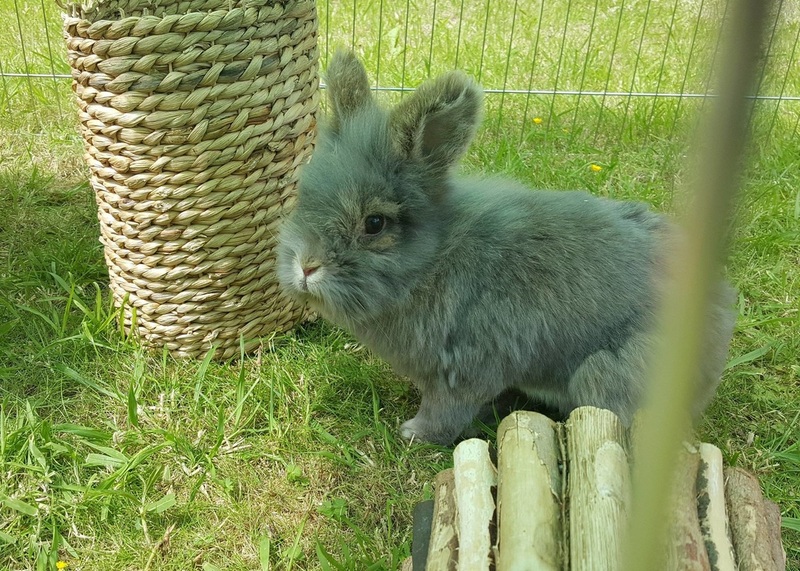 Skittering Pig require that ALL rabbits from 16 weeks are neutered (except where you are taking advantage of our neutering service), however we will accept rabbits where a veterinary surgeon has assessed that the rabbit is not mature enough to be neutered. 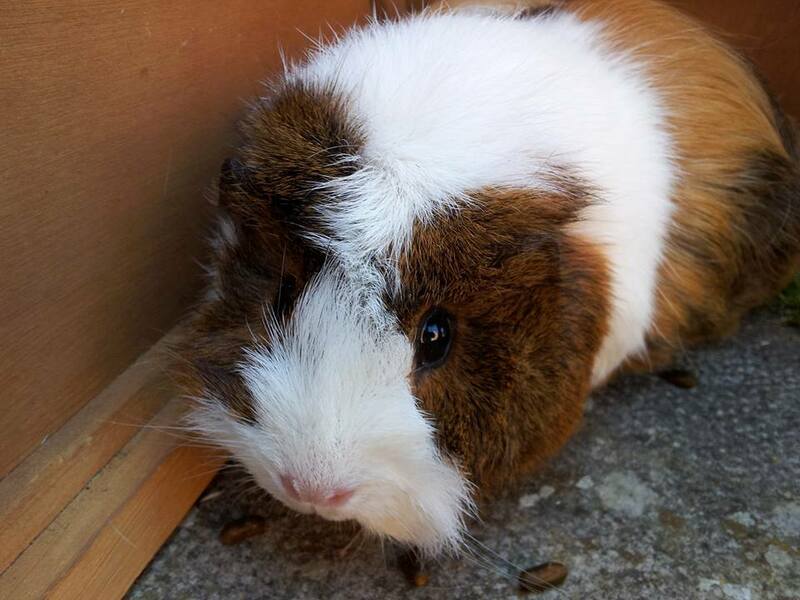 Sad Rainbow Bridge news piggies William and Mr Selfridge have passed over, Please make sure piggies are kept cool with air circulating their hutches and pens. Just a reminder that we are filling up fast for summer boarding and visits. Let us know your dates so we can book you in. We will be closed from October 6th till 14th 2018. 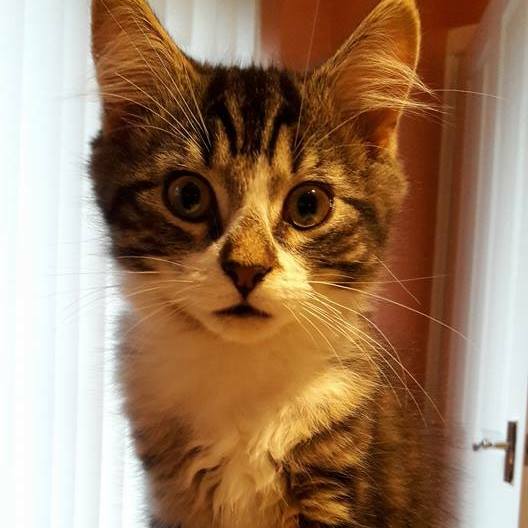 If you need your furbabies looking after during this time I recommend Karen from http://www.hopskipandbunk.co.uk all will be back to normal from October 15th. I know we say it every year but please dont buy a live rabbit at Easter. They may look cute and cuddly but in truth they are a 10 year commitment, they have feelings, needs just like a person. Please always make sure any pet you have is the right one for your family and lifestyle. We encourage adoption over buying in a shop. 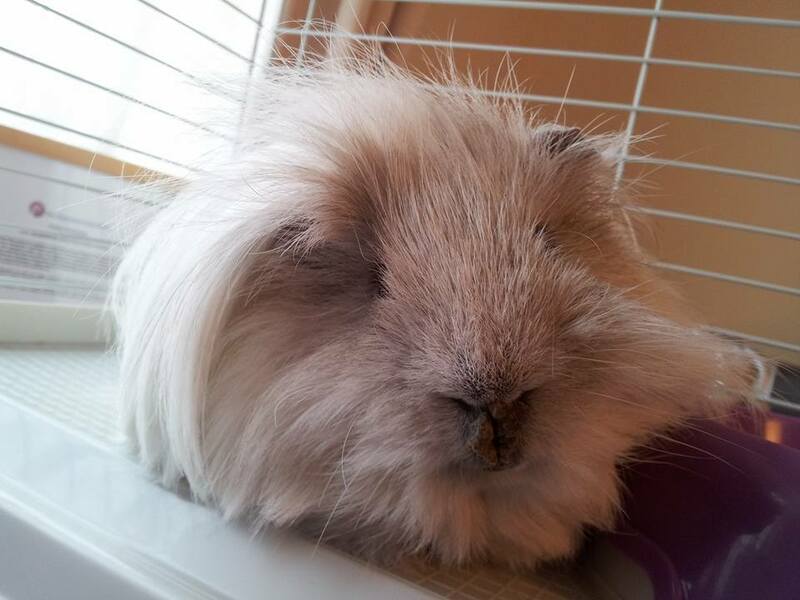 Beautiful bunny William and cute piggy Coconut have joined our Rainbow Bridge list. Our thoughts are with their families. 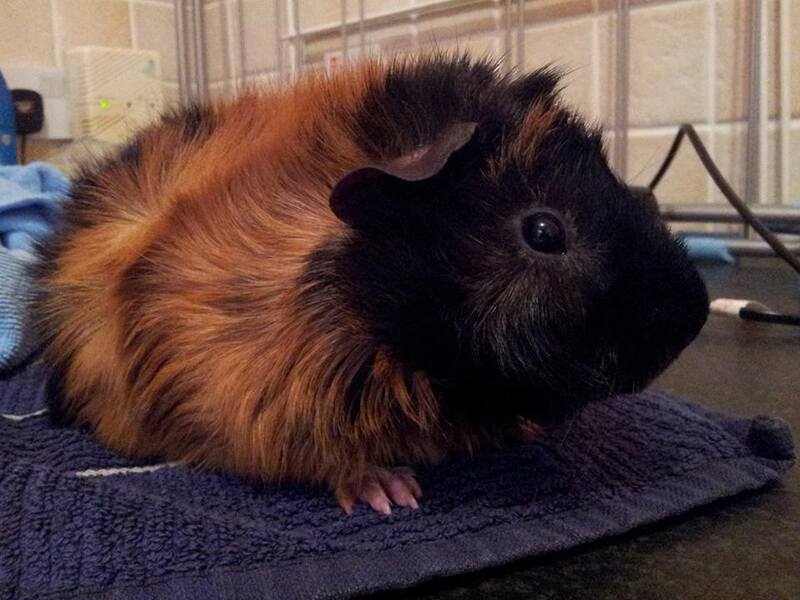 The Skittering Pig adoptees are doing really well, Belle & Chip have settled in and had their pamper. 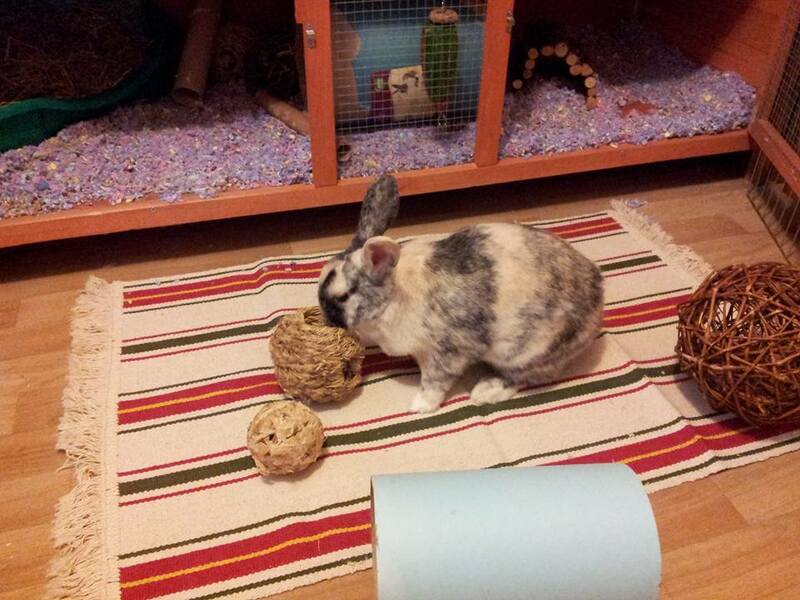 They have a lovely big pen to call home and an enormous playpen filled with wonderful toys. 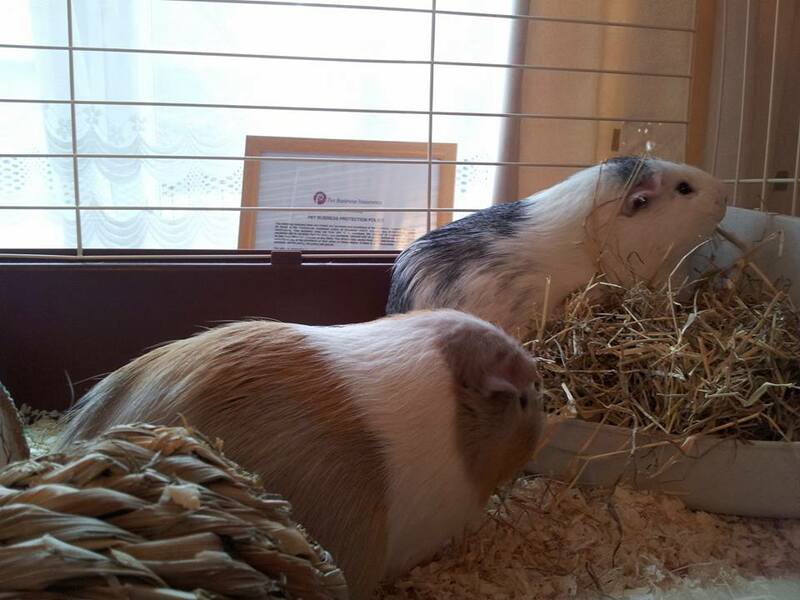 Cheeky piggies Belle & Chip settling in for supper. Don't forget to book early for Easter & Summer holidays places filling up fast. Also applies to Christmas & New Year! Thinking about Summer holidays remember to book your furries in early. Over the last year I have been compiling a chart of guests names. Well the results are in! 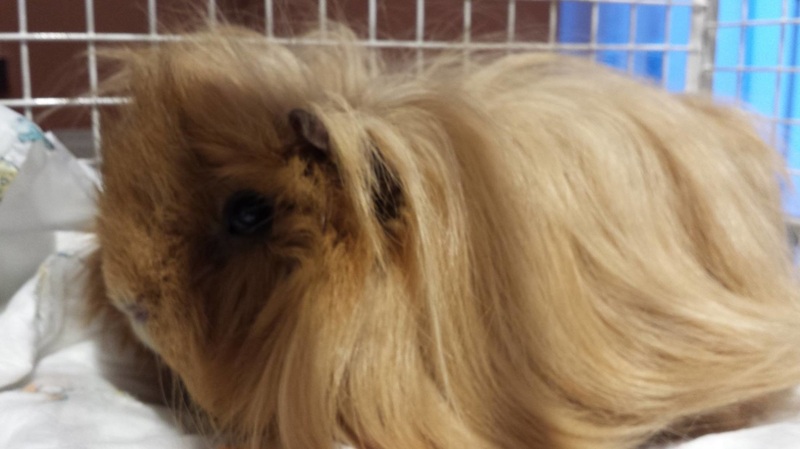 The most popular name for guinea pigs is Fudge! with Bubble & Squeak coming 2nd & 3rd. For Rabbits it is Daisy & Alfie so here is a small selection of guests with these lovely names. Just dropped my piggies off for a couple of weeks here whilst I recover from surgery and Julia is so amazingly kind and accommodating. 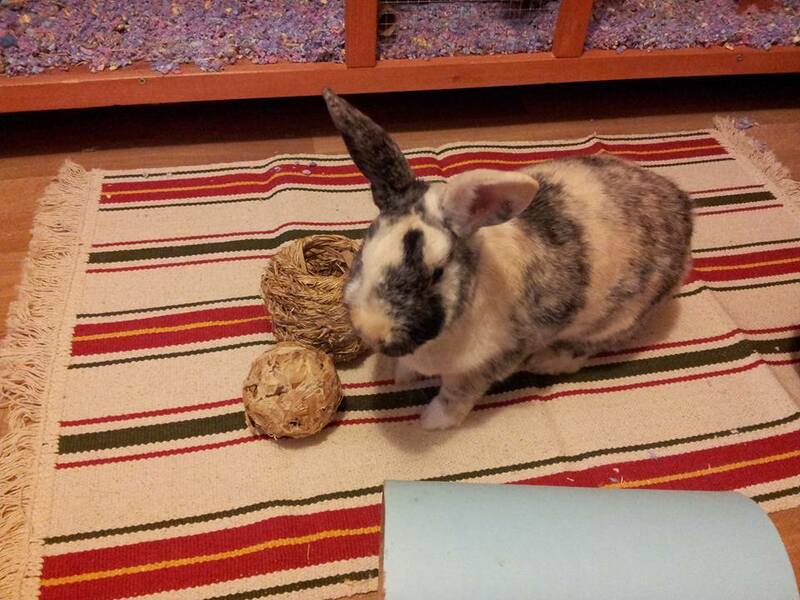 She's giving updates on them and even clipped their nails - she has a lovely home and clearly adores animals. You won't find a better boarder anywhere in Northants! Its coming that time of year again! Yes the annual Advent competition watch this space to win 7 nights free boarding. Other prizes throughout the weeks too! We are going to be closed from 2nd December until the 8th December. This is so we can finish the last stage of our improvements to the board rooms, the painting bit! As always the health and safety of the animals is first and foremost so we dont want precious babies inhaling any paint fumes. We are open all over Christmas and New Year. Sorry about lack of updates, been super busy with boarders and home visits now its the holiday season. I have had to revise our opening times due to a family commitment. Please note due to the increase in RHVD2 all drop offs and pick ups will be conducted away from boarding areas, this is part of increased infection control. We are sorry about this and we know you like to settle your babies in. However we can not run the risk of this horrible disease being brought into animal areas. It is therefore a must that times for drop off and pick up are agreed. We also will be stepping up increase in infection control to our home visit clients as well. If you can and have time before boarding with us we do urge to have this extra vaccine done. Urging all bunny owners please get them done against this terrible disease. Rabbit Viral Hemorrhagic Disease 2, There have been a couple of confirmed cases of this now within the pet rabbit population here in Northampton. I am urging all my bunny clients; whether your buns are outside or indoor (you can bring the virus inside on shoes or clothing) to get this vaccination done. At present I only inst that rabbits are vaccinated against RVHD 1 and Myxi, however I am taking advice from my vet and if there are more cases I may have to add the RVHD 2 to the list. Sorry we have been a bit quite lately. We have had some time after the passing of our Birdie. You can always keep right up to date by heading to our Facebook page. The new software seems to be going down well, thank you for all your feedback on this. 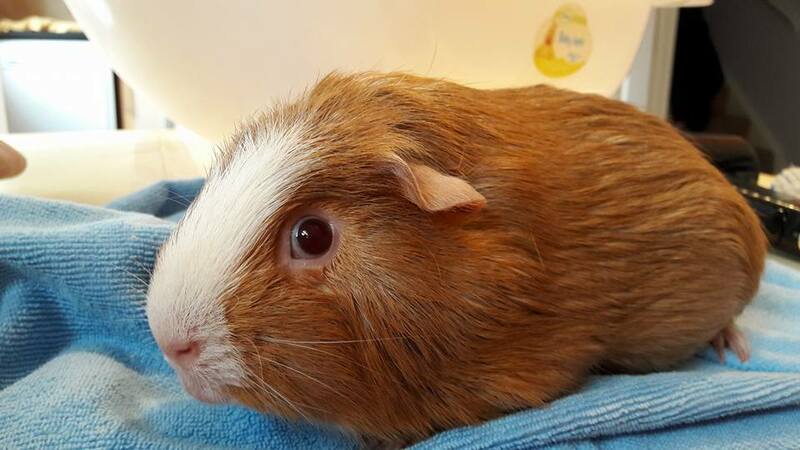 Our very own piggy Birdie has passed over, he had been poorly with an infection he had been on antibiotics but it was all too much for him. IMPORTANT DATES! There will be no drop offs or pick ups on the following dates. August 28th (Bank holiday), October 31st (Halloween) & November 5th. (Firework night). Halloween & Firework night is for the welfare of our guests who can be very stressed during these times. Also if you are booking for Christmas our last drop off is December 23rd, first pick up is December 27th. If you wish bookings and home visits for August and Christmas please get in touch as soon as you know your dates. 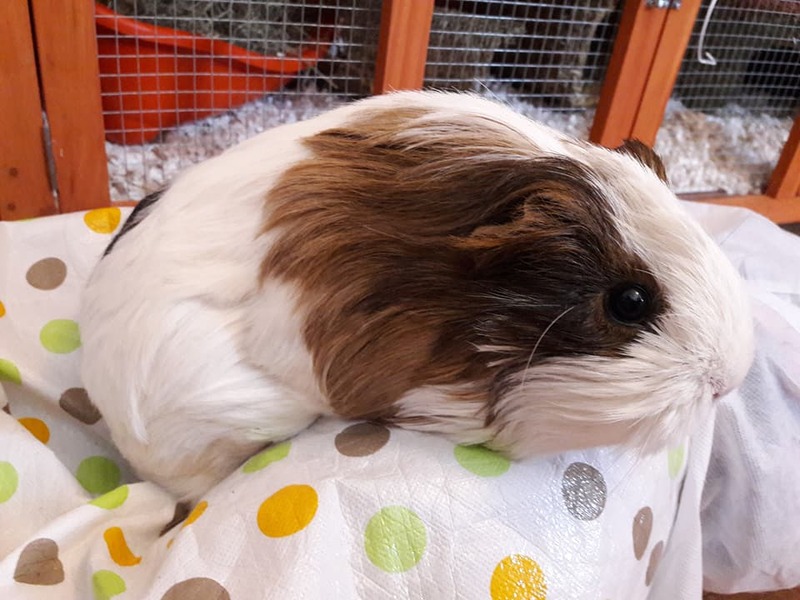 We had a lovely piggy called Cookie come to us to try to band her with our piggy Birdie, after a couple of weeks it has become apparent that Cookie and Birdie were not getting on, however another piggy came for some tlc and I managed to bond Cookie with her. All has gone well and the girls will be going home together. Both sets of our new accommodation is now fully open. 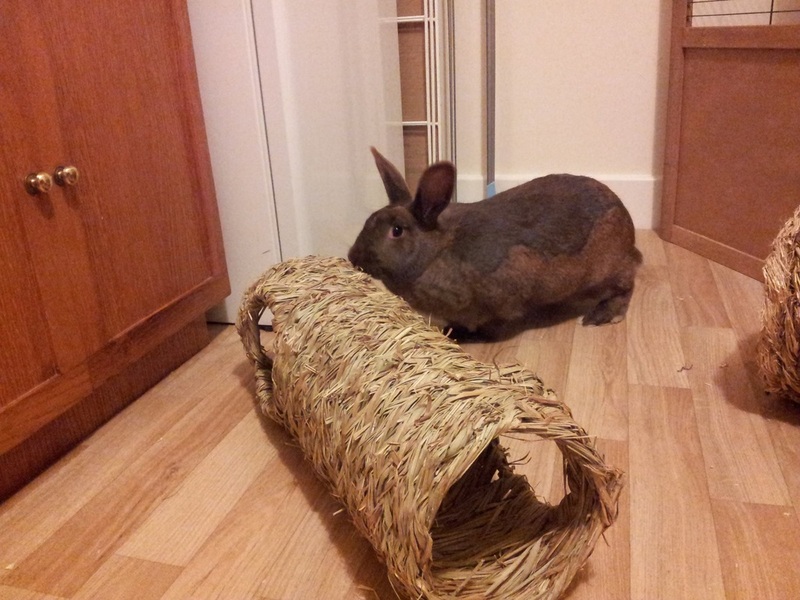 We have 5ft x 3ft x 2ft runs with a hide box, hay bed, litter box tunnels and toys! for our bunny guests. 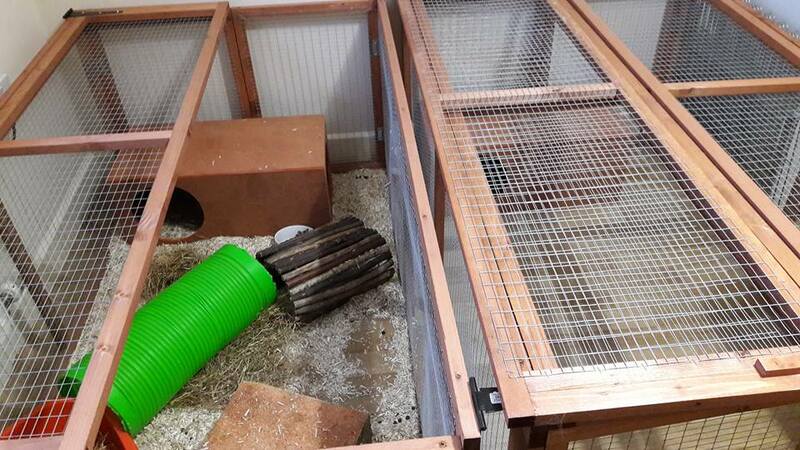 For piggy guests we have large double hutches with a false floor giving them lots of space again with hide houses, hay trays and toys. ​Hooray! our new accommodation is finally in place! 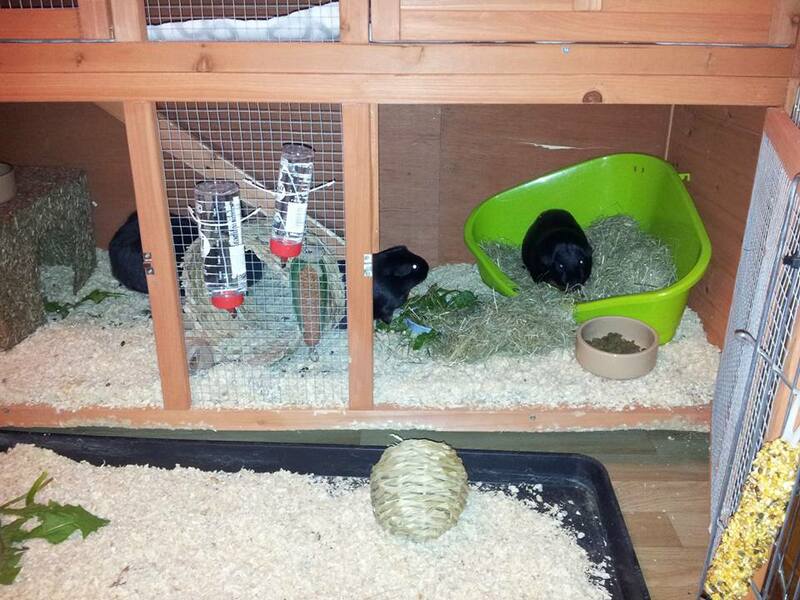 We now have a dedicated guinea pig room and rabbit room. 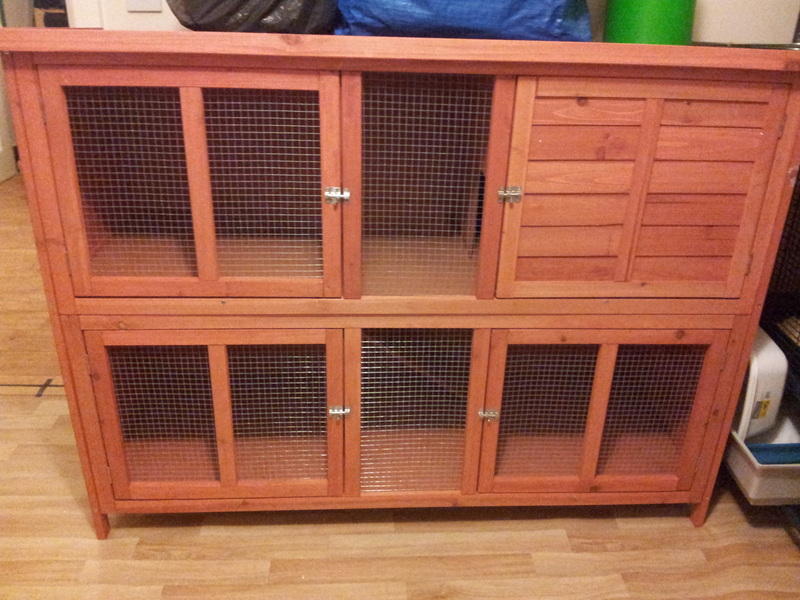 Piggies have one half of a double hutch plus play pen and bunnies now have large pens instead of hutches so they are free to play all day. 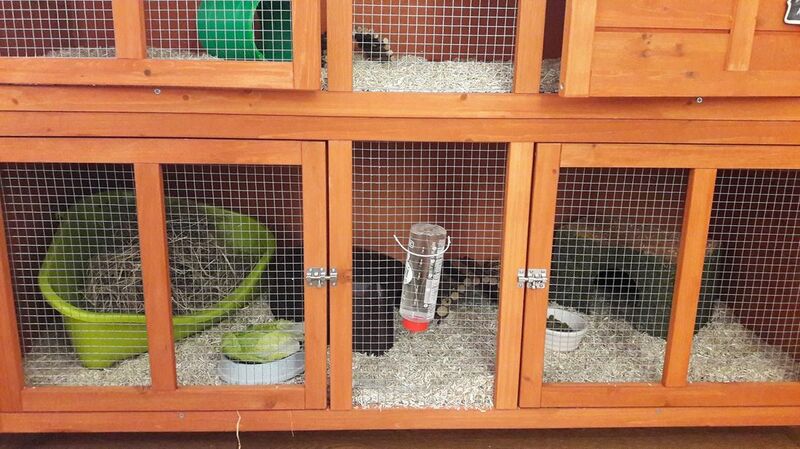 The pens have a private box area, hay tray and toys. 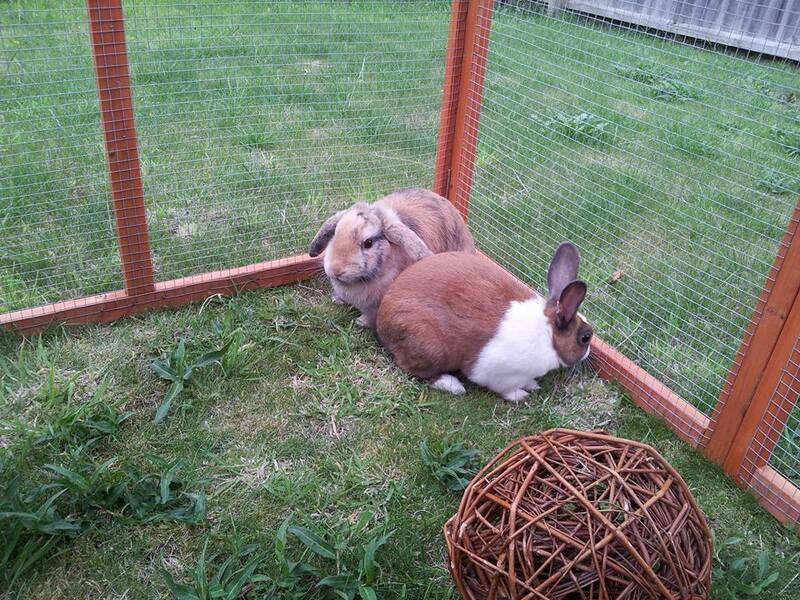 Welcome this week to William, Toffee and Opal; who are all bunnies. The Skittering Pig kittens are now 6 months old. 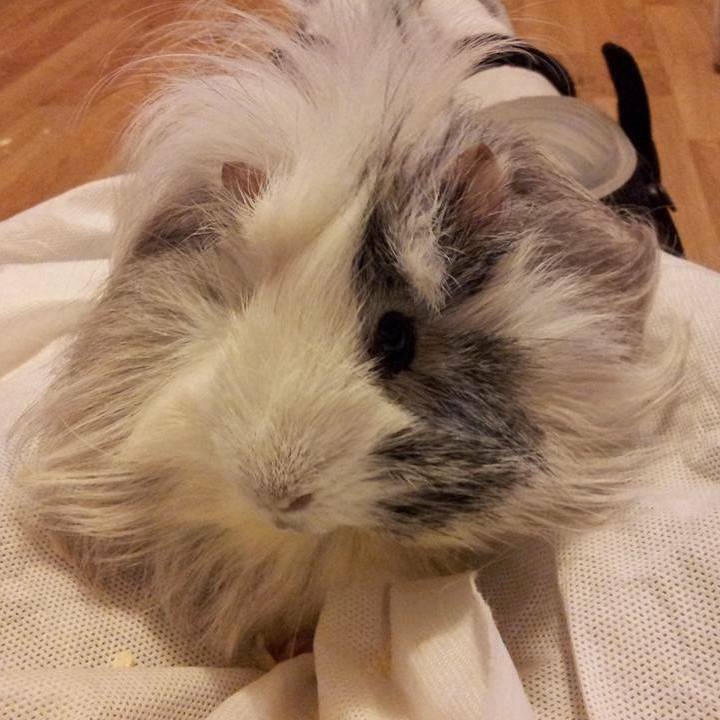 Had some lovely guests this week cute piggies, Thorin, Pixel & Navi plus bunnies Benny & Bella. 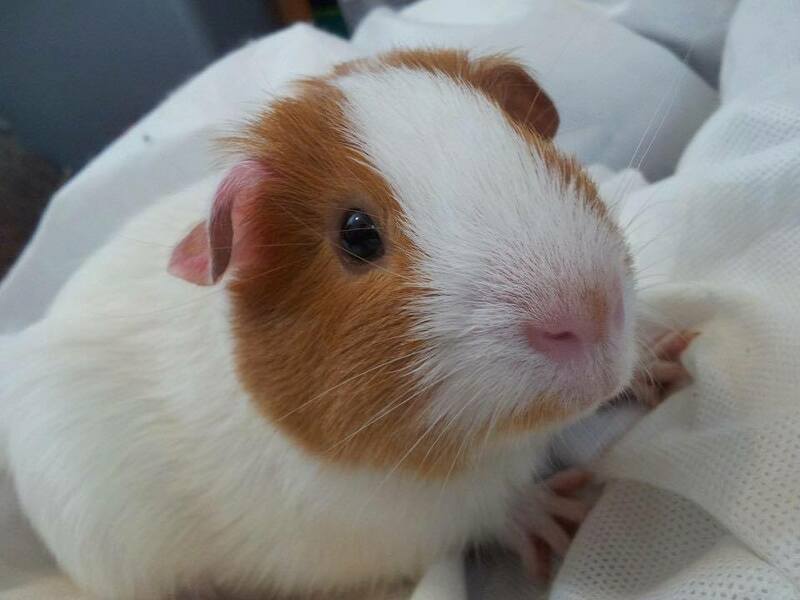 More Rainbow Bridge news, this time a sweet little piggy called Creamy, our thoughts are with his family. 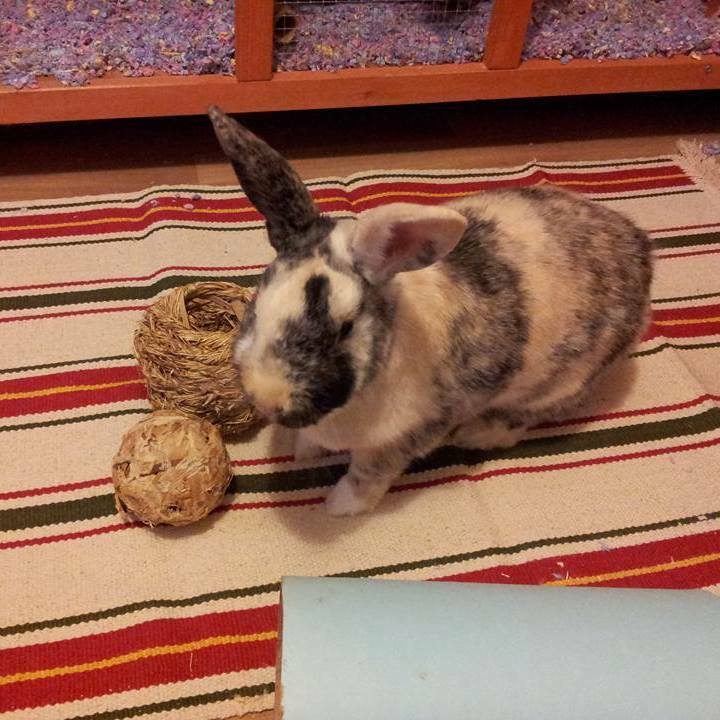 Just had some sad 'Rainbow Bridge' news, Bailey the blind bunny has passed over, he will be deeply missed and our thoughts go to his mum & dad. After a mad week a chance for a huge clean up! And a change around. 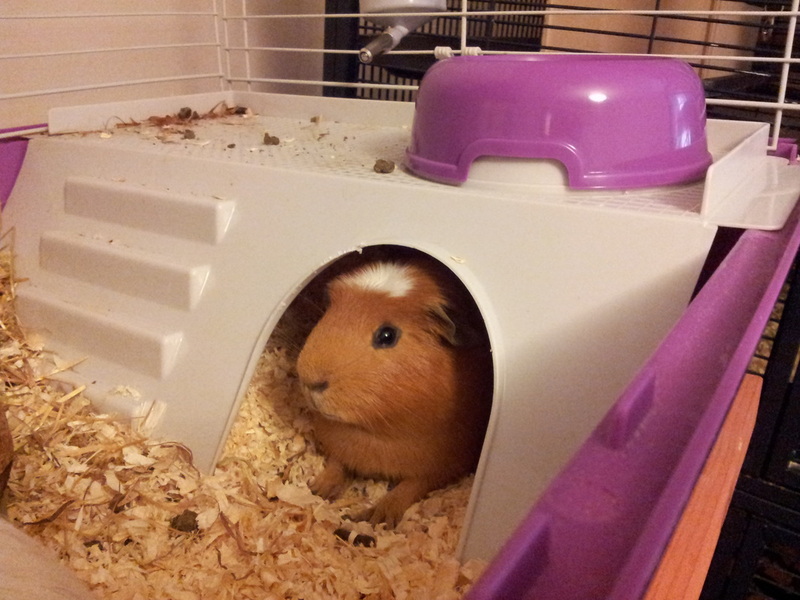 We are pleased to offer our new guinea pig room! 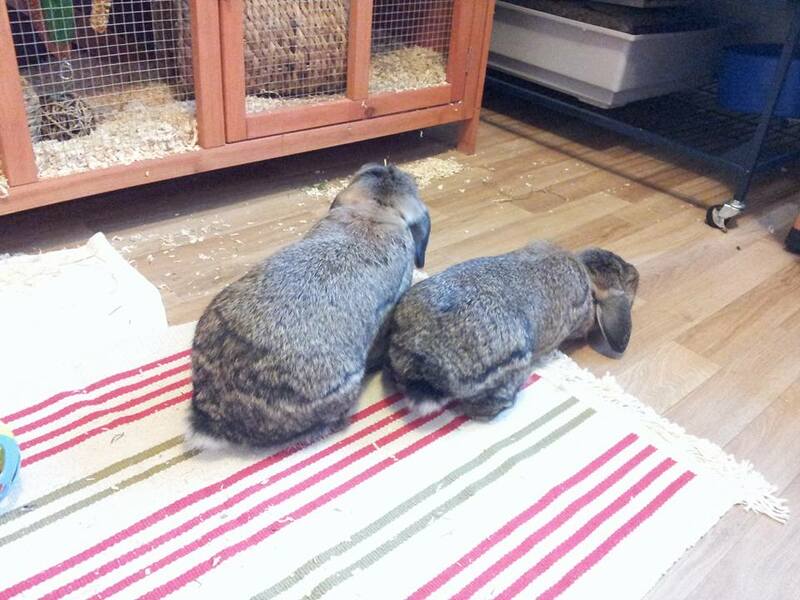 This room is quite and away from bunnies, the accommodation is large and spacious so they have plenty of room to stretch their paws. 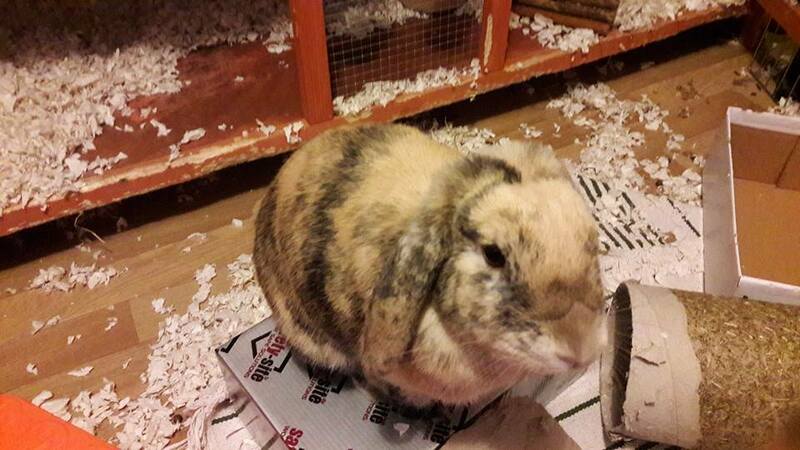 We hope in the coming months to do the same with the bunny room! Don't forget we fill up fast so please book early for Easter, Summer and Christmas. Lots of guests in this week, here are just a couple of pics matching bunny, Mimi and Maisie the piggy. 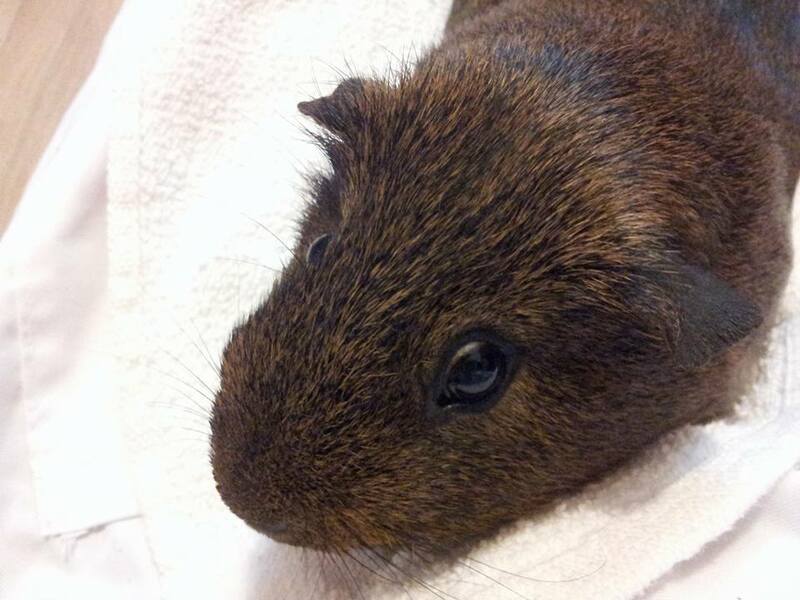 ​More 'Rainbow Bridge news! 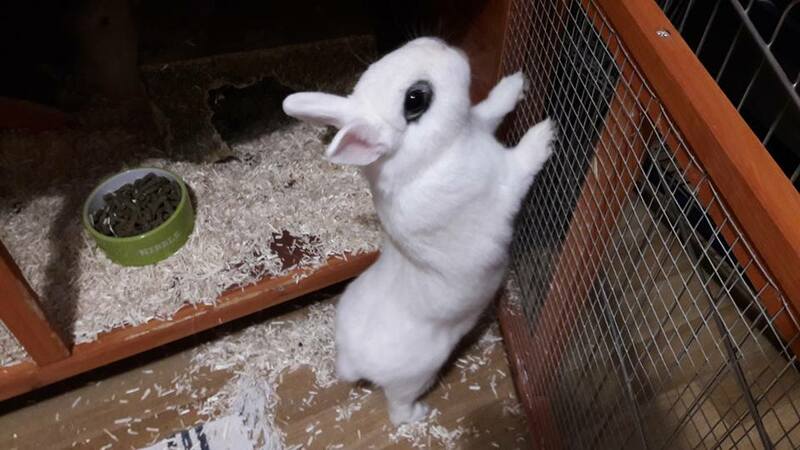 A beautiful bunny named Barney, she was 10 years old and leaves behind her friend Lola. On the good news side our remodelling is coming on great we are expanding slightly to give our guests more room to stretch their paws. 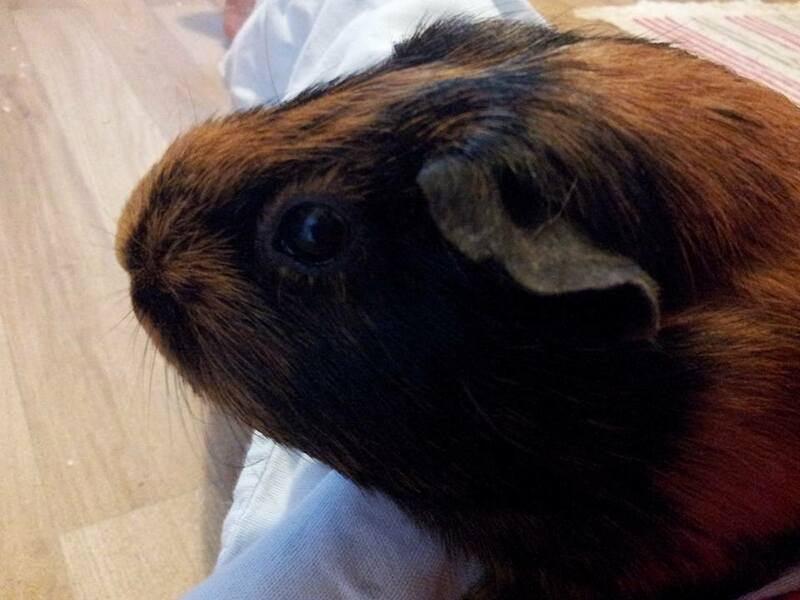 Some sad 'Rainbow Bridge' news first off, regarding a young piggy called George. 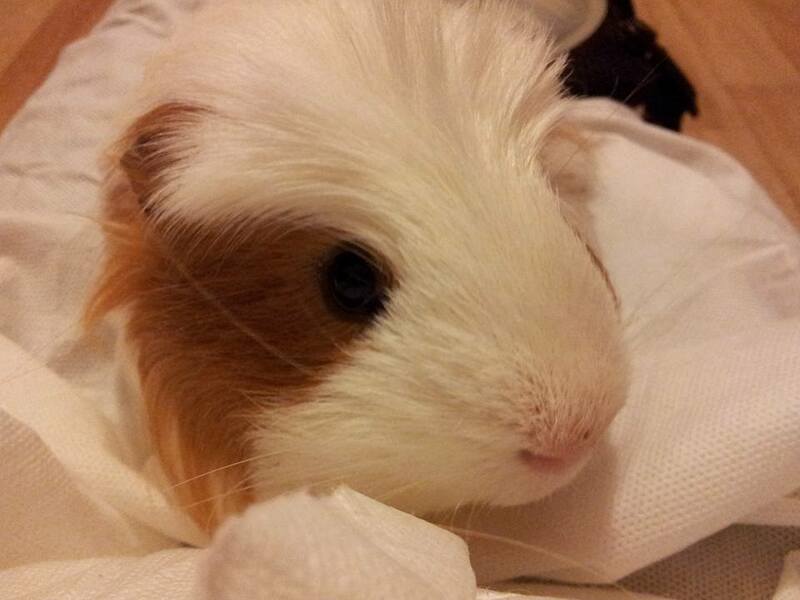 I looked after him in the summer with some home visits, such a cutie to look after. Hugs go to his buddy Biscuit and his young owners. 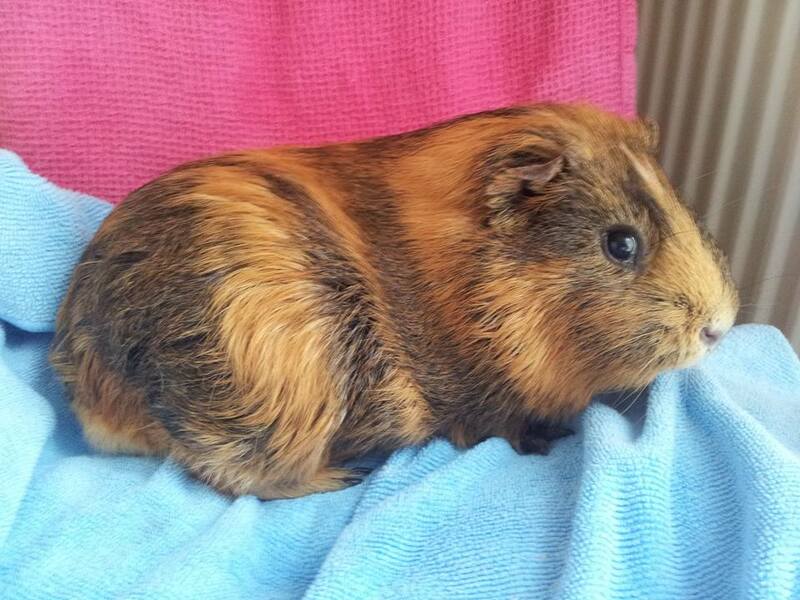 Also our thoughts go to Fudge's young owners too this week, we know Pippin will get extra cuddles. A huge thank you for charging us with your precious furbabies in 2016. 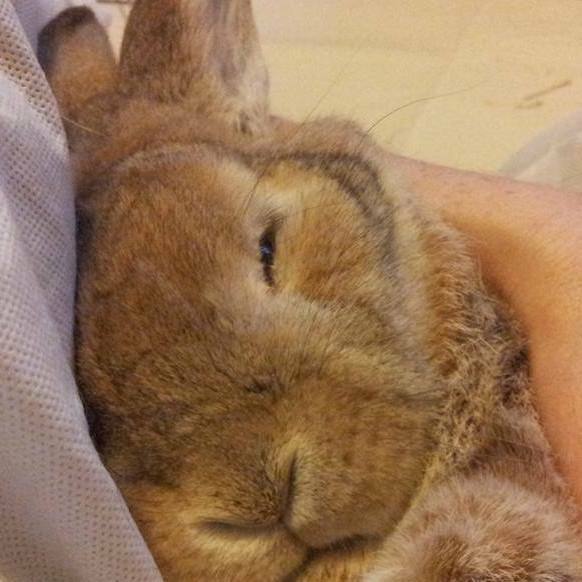 We look forward to more cuddles in the coming year. Big Thank You for all who joined in our Advent competition, we hope all winners were happy with their prizes. Daisy & Bo Miller won our Grand Draw. Also huge Thanks for all our cards and gifts we have some wonderful generous clients and friends. 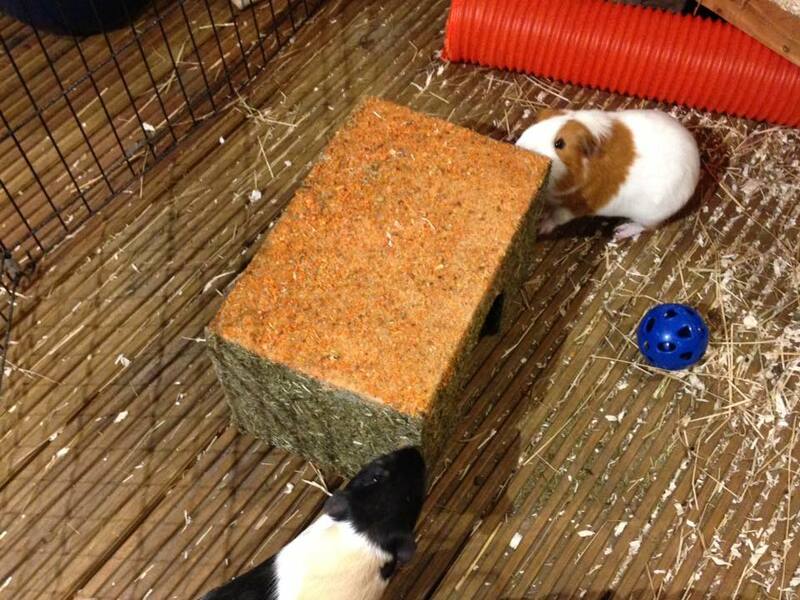 Winners Oreo & Biscuit enjoying their carrot house. Day 12 was Action shots! managed just to get one of these speedy guys. To join the competition head over to the Facebook page and SHARE & LIKE for a chance to win goodies and be entered into the Grand Draw. Day 10 is Saturday cuteness. Day 8 is bath time fun! Great prizes to be won. Bags of nuggets, carrot home and pamper days. Head to our Facebook page to LIKE & SHARE. 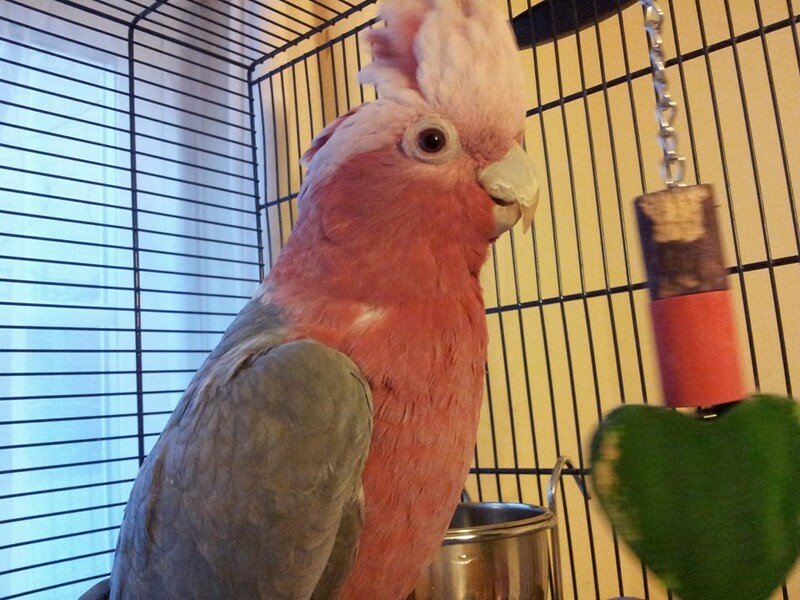 Day 5 features some of our home visits clients like this beautiful chap. Head to our Facebook page to enter. Day 3 is up, chance to win some Festive Treats! Just LIKE & SHARE our Facebook page to enter. First advent pictures and a chance to win a full pamper day is up on the Facebook page, head on over using our links to enter. Only 2 days to go before the start of our Advent Competition! Remember all you have to do to be entered into our Grand Draw on Christmas Eve is to LIKE at least one of the pictures that will be displayed each day. On Mondays, Wednesday & Fridays we are giving away a daily prize, again all you have to do it LIKE the pictures, winners will be picked at close of business on those days. CHRISTMAS! 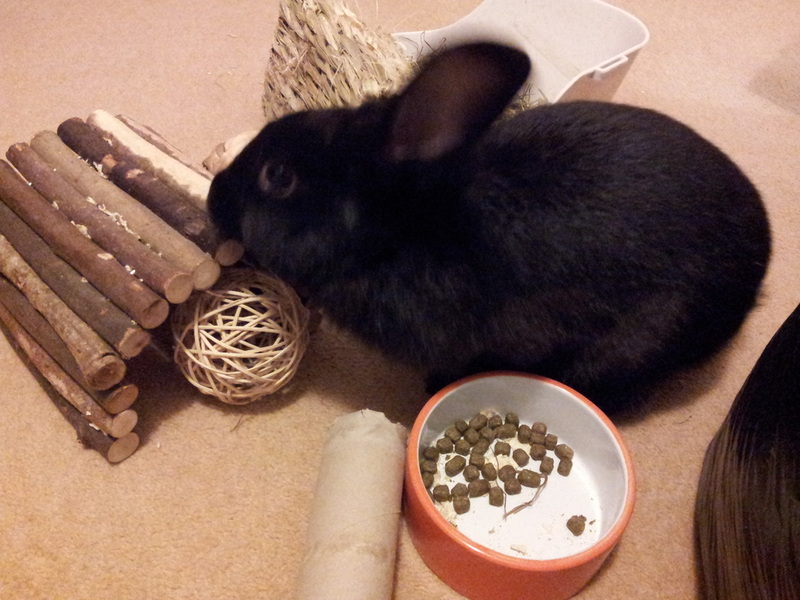 We are full Christmas and New Year to rabbits, however there are some spaces for piggies. Instead of the usual picture advent we are going to run a daily competition (Mon-Fri). Details to follow. 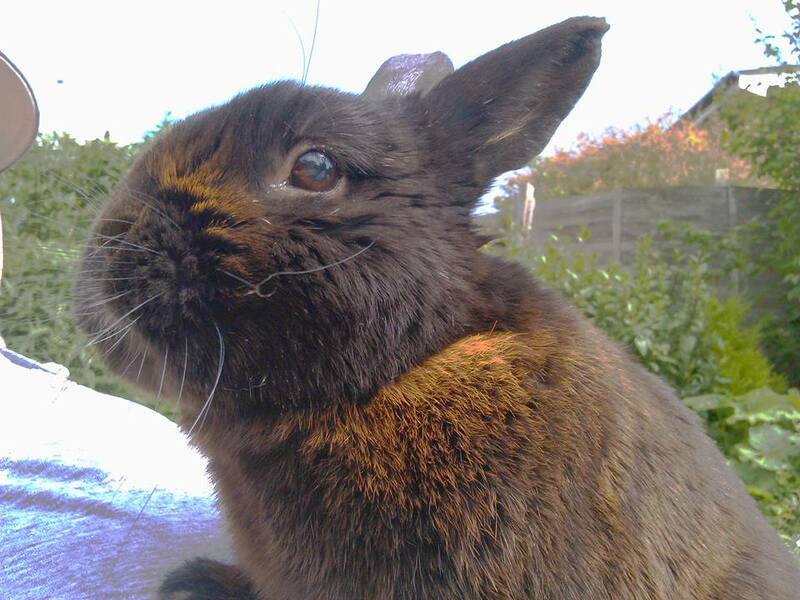 Rainbow Bridge news, sorry to hear that little Fudge has passed over, he will be very much missed by his owners and friend Black Jack. 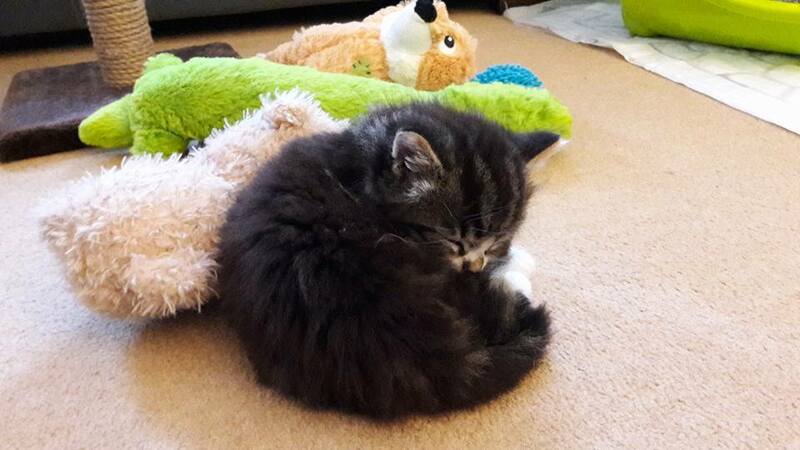 Kitten update, the boys are now 7 weeks and into everything! 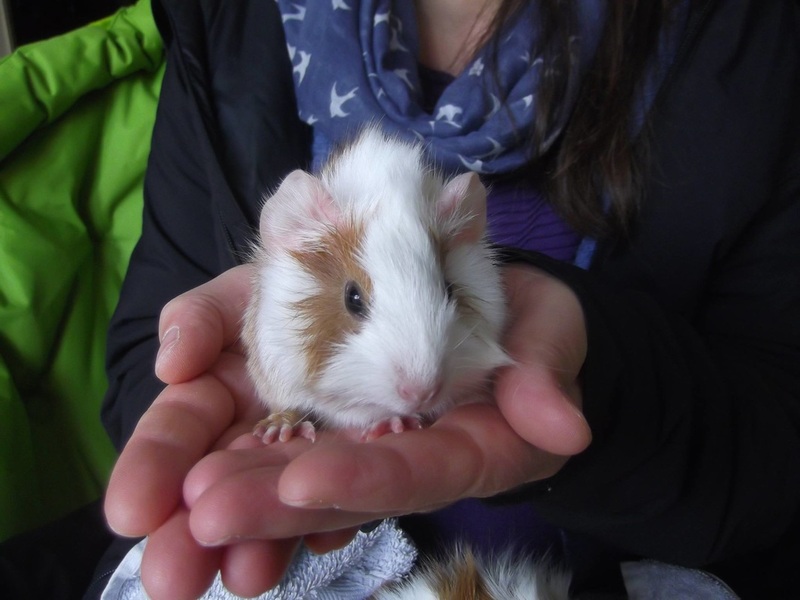 The baby piggies have now gone home but had a very happy and thankful owner. Here they are a few days after arriving home. 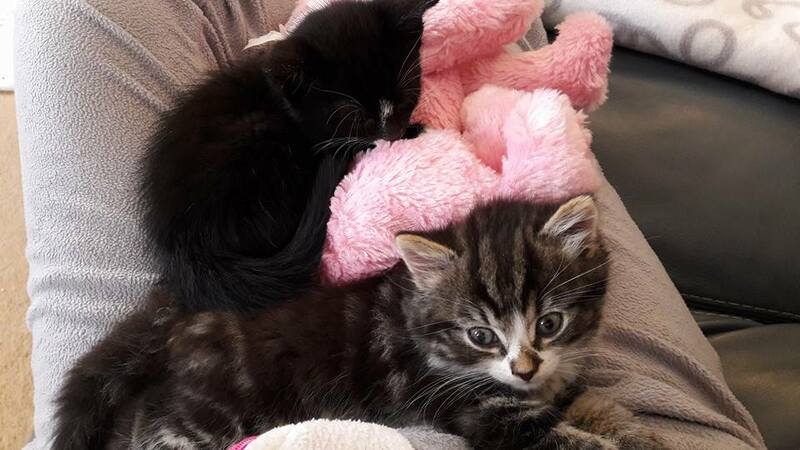 After a devastating week losing our 16 year old cat, we now have kittens! Bob-cat and Disney. Also the piggy babies are now 8 days old and super cute. Weekly cuteness, one of our guests gave birth to these super cuties. 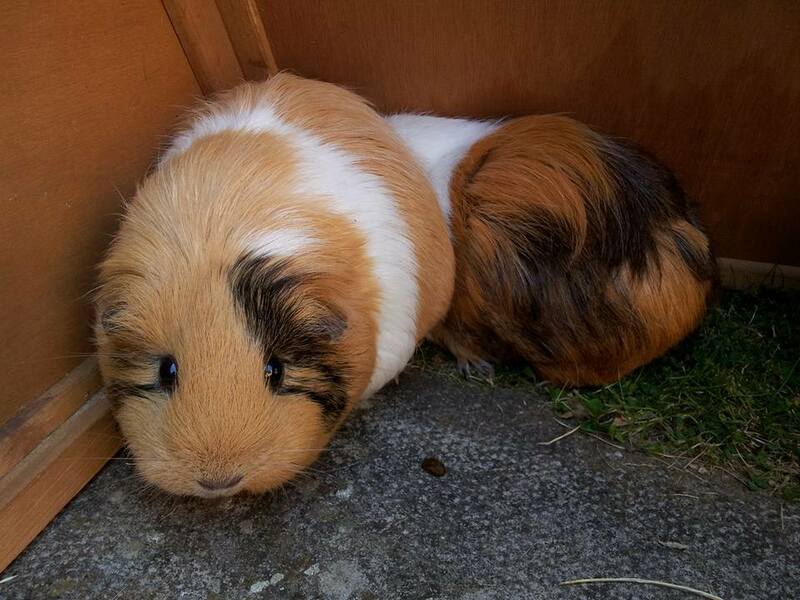 Temporary names are Treacle, Nutmeg & Cinnamon. We have had the very fluffy Janice & Neville to stay, pamper days for Dallas & Storm and a few days break for elderly gent Joey. After a well deserved vacation we are now back in full swing and ready for guests. We still have some vacancies for October half term and few places left for Christmas. 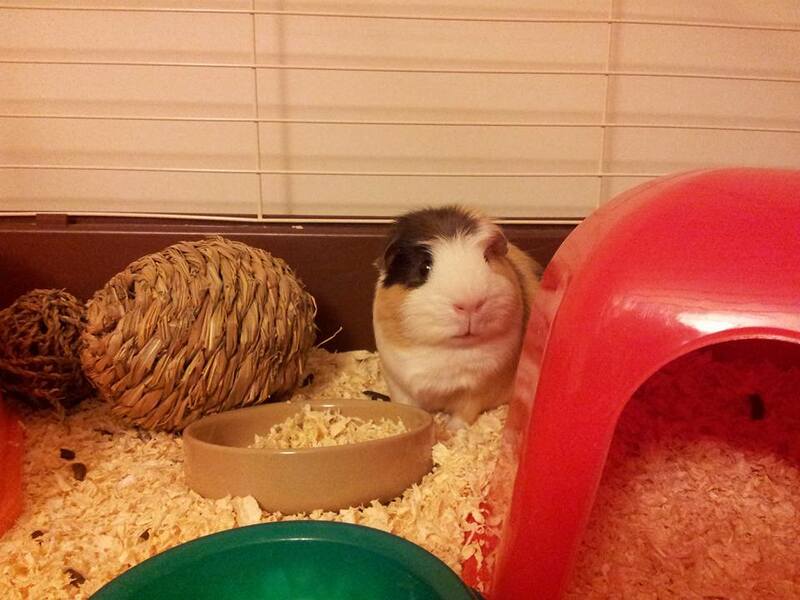 Ever get the feeling you are being watched very intently? Fudge & Bubbles on breakfast patrol! 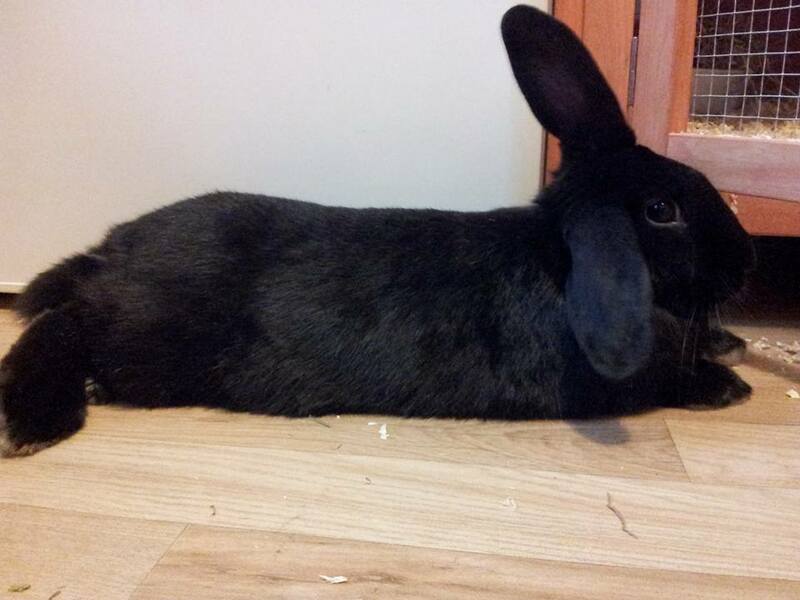 Here at Skittering Pig we are honoured to have our first celebrity bunny, Pippa she is one of the faces of Vets For Pets. 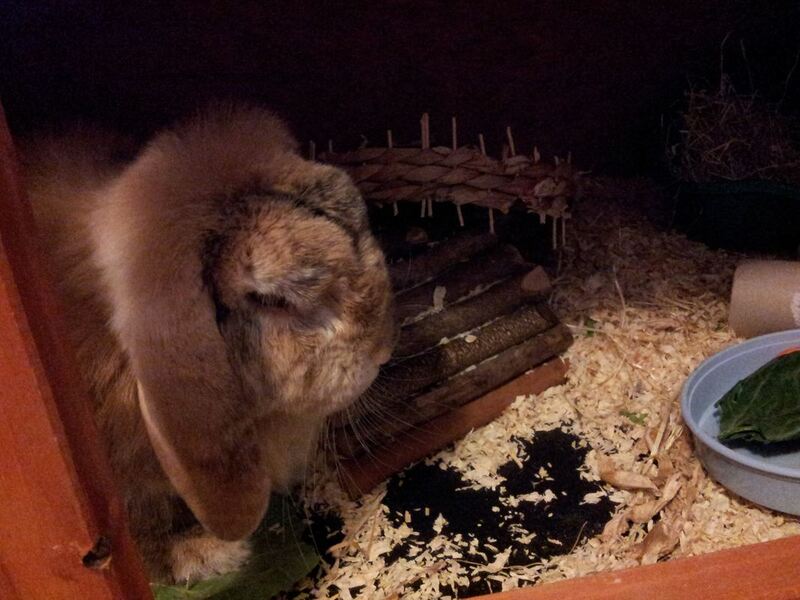 However she is taking it all in her hop and is eating well and has settled in here for her holidays. Pictures to follow. We have had lots of guests over the last few weeks, check out our Facebook page for lots of pictures and videos. Darcy update, she is back home and doing really well, it was a dental issue that was making her not eat which has now been sorted. Thank you again Astonlee veterinary hospital in Newport Pagnell. Lots of guests coming and going, here is a super cute picture of Barney. Big clean today as guest go home and new ones arrive, more home visits too, always a delight to busy. Thank you to clients for their patience this week too as I could not take messages on Thursday, much appreciated. 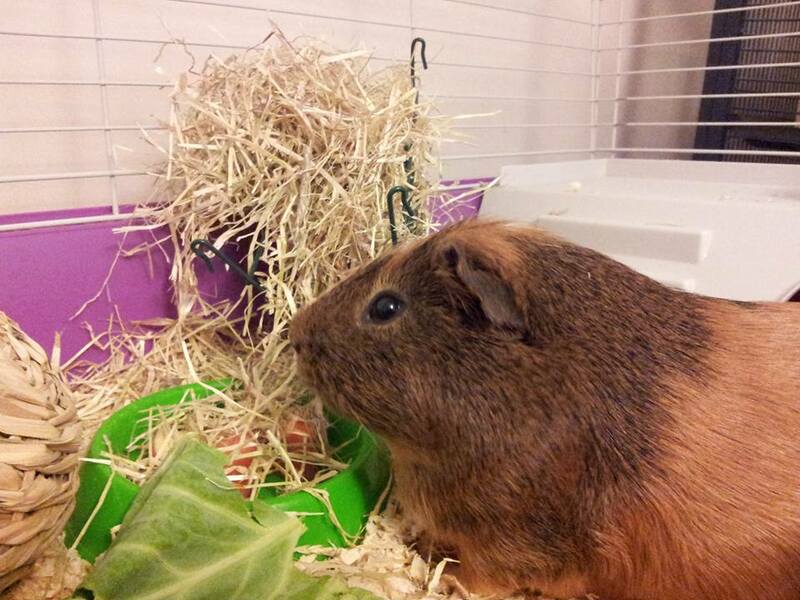 Home visits this week; 6 piggys who love their greens, Pip who loves broccoli and the beautiful Bella. Managed at last to get some of the bunnies too! 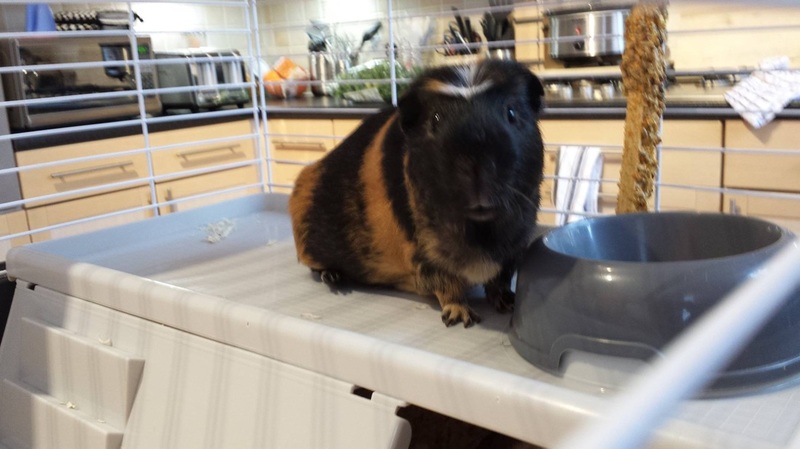 This is Lily she was pushing the bowl towards me in the morning much to say " Breakfast please"
New boys Spot and Freddy after their brush up, they have been having a great time in the garden run. I absolutely cannot recommend Julia and her family enough. 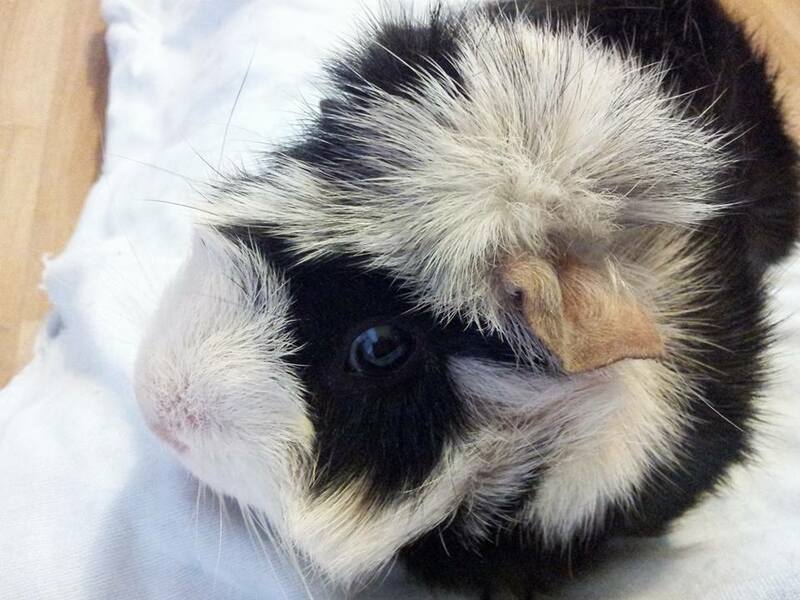 Skittering Pigs is an amazing set up and meets all your small pets needs and more. Julia and her family have been so incredibly kind and helpful to us of late with our three little pigs , she has gone above and beyond the call of duty and thank you just doesn't seem enough. She loves her guests probably as much as the owners do and fusses over them probably more. The boys, Max, Jasper and Mr Selfridge are looking forward to their next visit at the end of the month. We now accept card payments! there is a 50p transaction fee for all card payments. Other payment methods of course are cash, cheque and BACS. 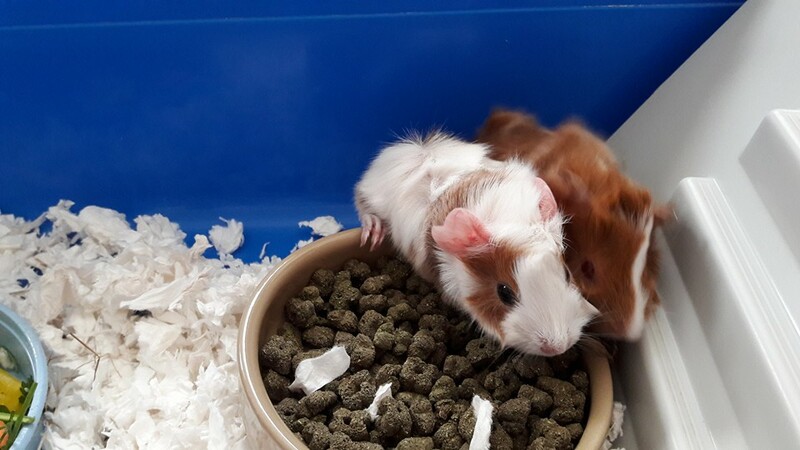 ​Bundles of cuteness in these 12 week old piggies. How many can you squeeze into a hay pan? 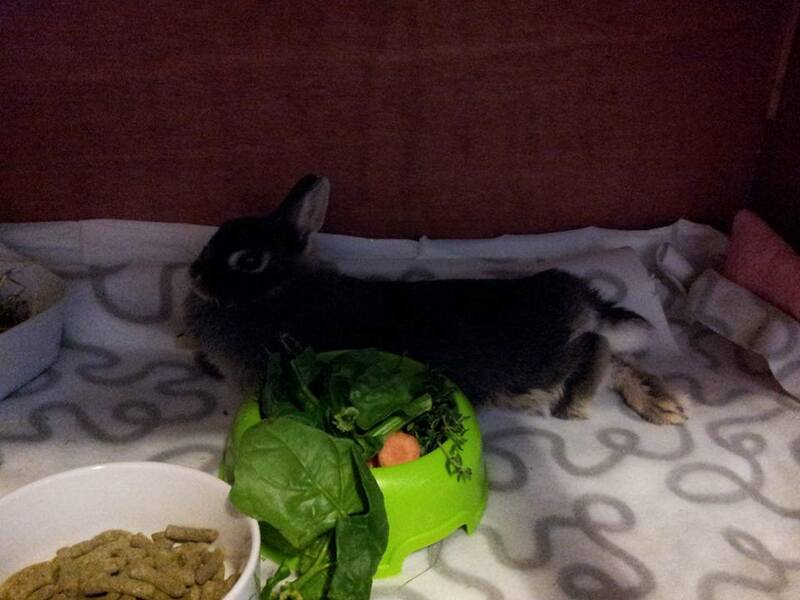 Also our first tame wild rabbit, he was found hurt at a few weeks so was taken home and cared for. ​Also had some sun! so bunnies were put to play. 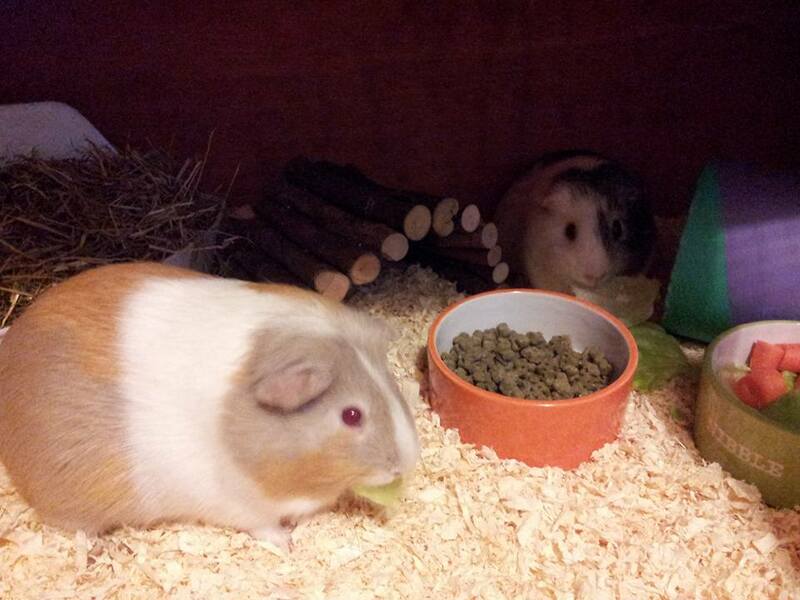 ​Lots of guest this week, here are the super cute 12 week old piggies. Jasper, Mr Selfridge and Max. 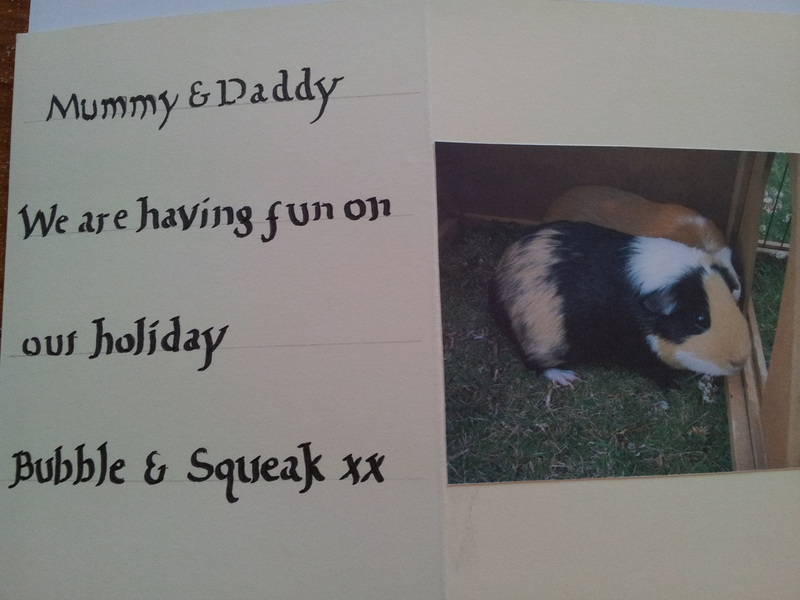 We also have Louis the piggie and Darcey the Rabbit. 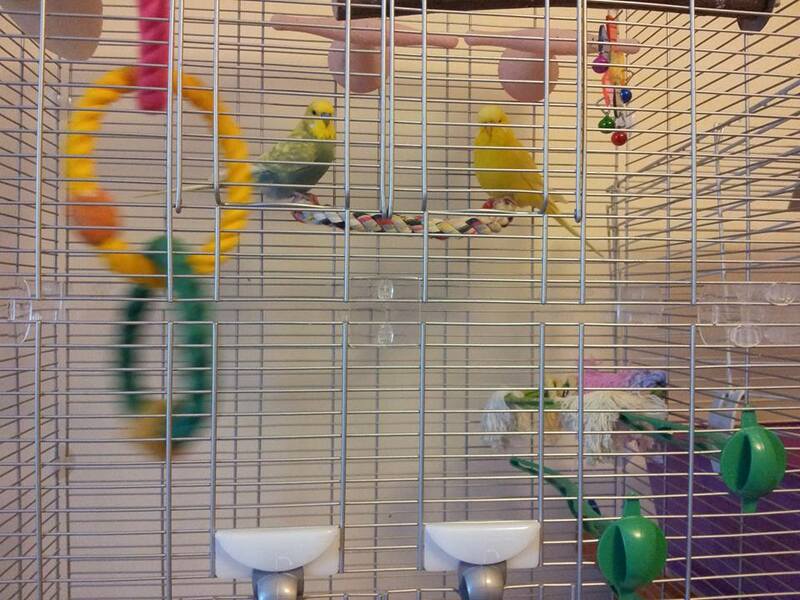 Two great reviews, this one from Sky & Ringo owner, 2 budgies we had last week. 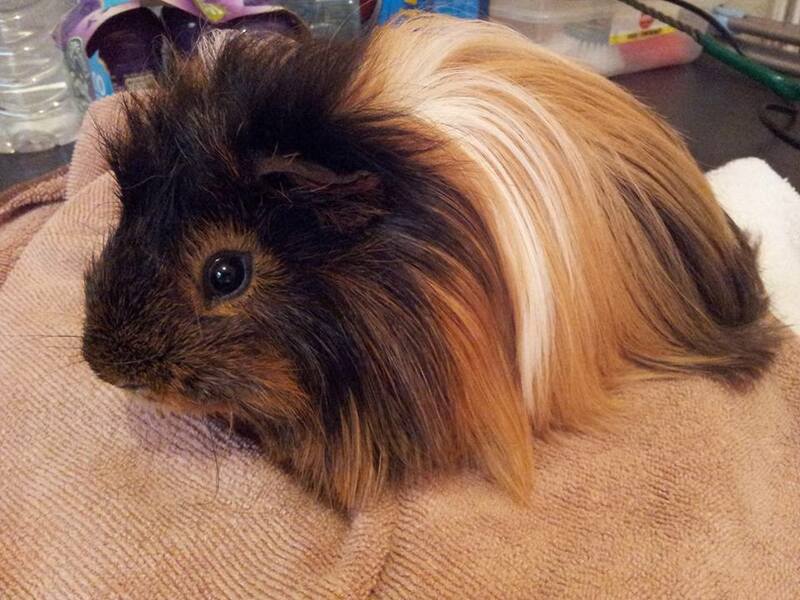 The beautiful Candy is back with us for Easter as is Black Jack & Fudge. 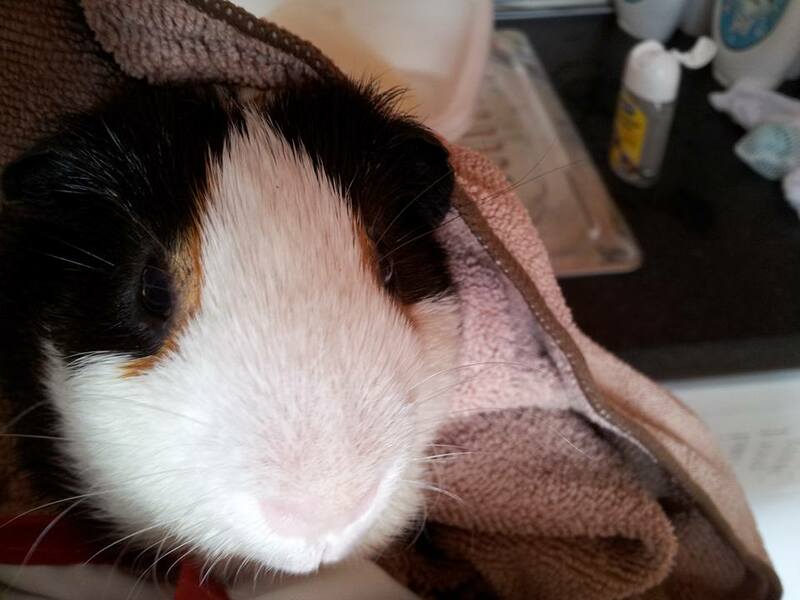 More 'Rainbow Bridge' news piggies Patchy & Wizz our thoughts are with their owners. 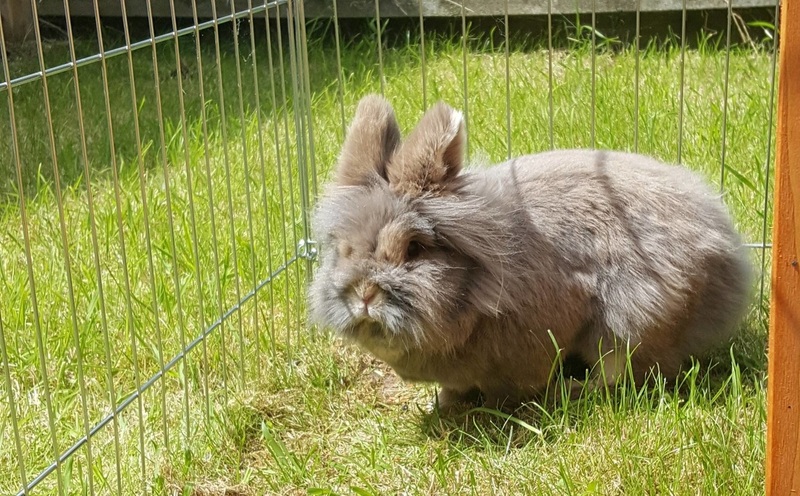 Learnt of a passing to 'Rainbow Bridge' Pepper the little grey rabbit sadly did not recover from his virus, our thoughts to his lovely owners and big hugs to his bunny buddy Chilli. Brr! might be cold and snowing here today, but our gang are toastie warm indoors. 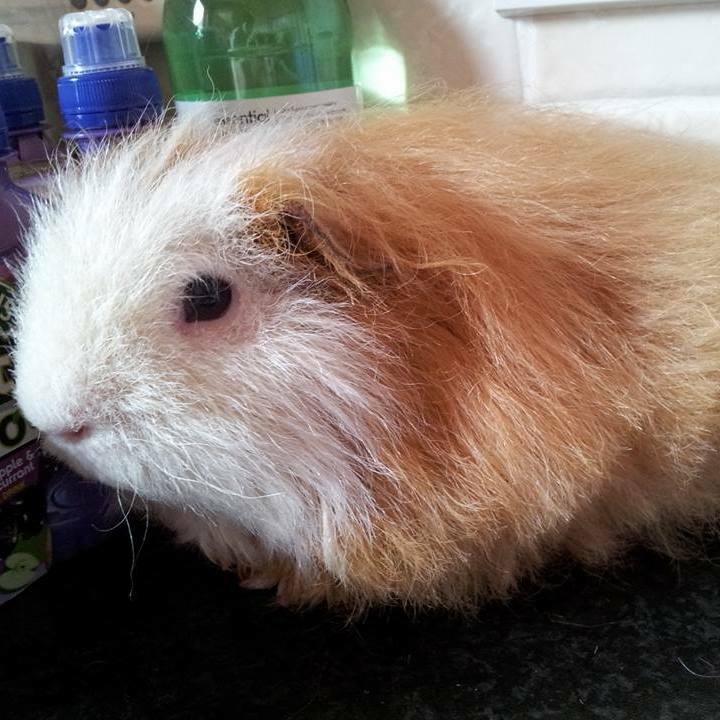 Charlie & Snowy joined us for a pamper day a lovely picture of Rufus after his pamper day. 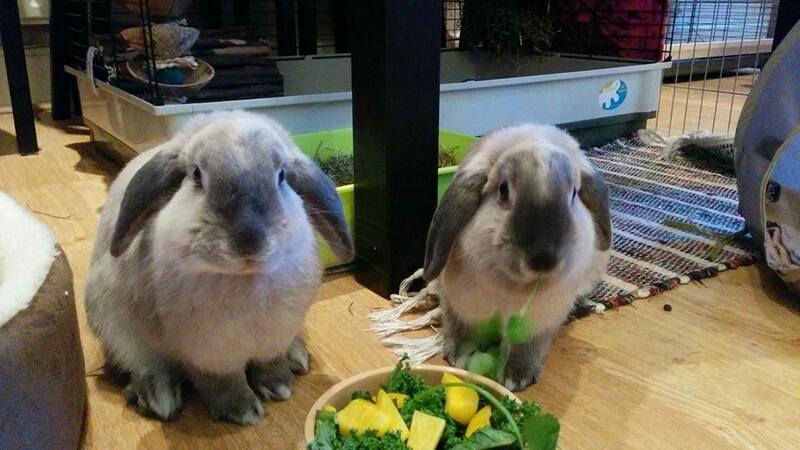 Buttons & Barley recovering well after their spay operation yesterday. February half term week, had some lovely bunnies and gorgeous piggies visit over the weekend. Tom & Jerry, Ludo & Hoggle. Bookings now being taken for half term, Easter, Summer holidays, even Christmas 2016! Let us spoil your furry while you relax. Please be careful out on the roads if you are visiting us this week, we have had some snow which may turn to ice later. With all this chilly weather make sure outdoor bunnies and piggys have extra bedding, alternative bring them into a shed or utility room. Quiff of the week! Fudge! We are now taking bookings for the February half term, Easter holidays. Do book early with us if you are going away July/August as we get booked up very quickly. ​Wishing all our clients and guests a very happy New Year! 22nd Dec. Mix and match! ​19th Dec. More piggy madness! ​11th Dec. Our more unusual guests! ​8th Dec. 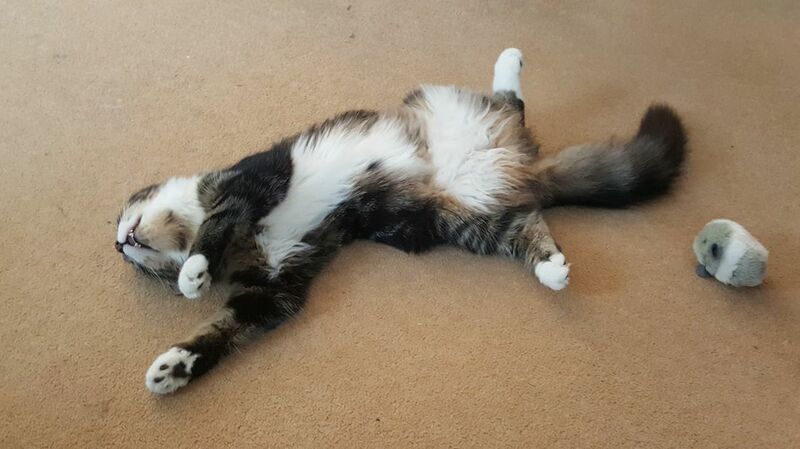 The very laid back Fizz. 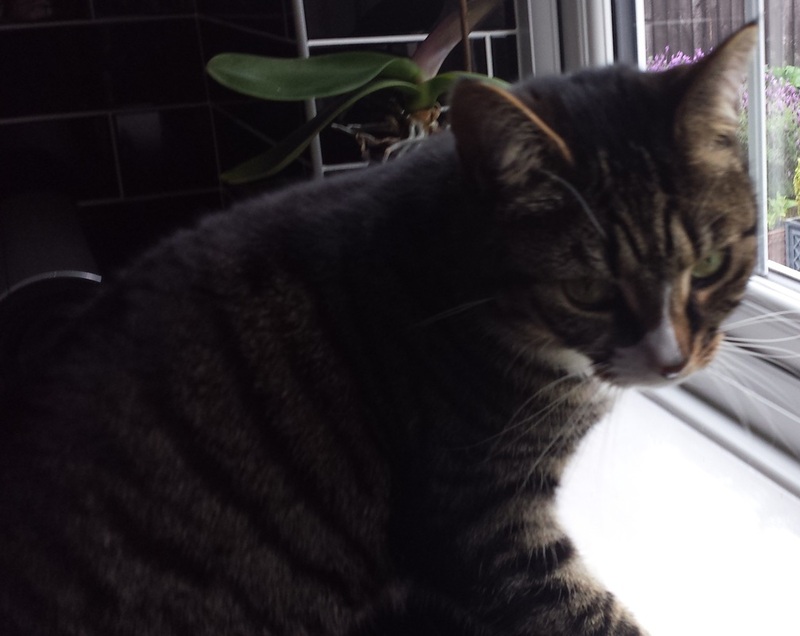 ​7th Dec. Dexter the chipmunk who loved Marmite on toast! 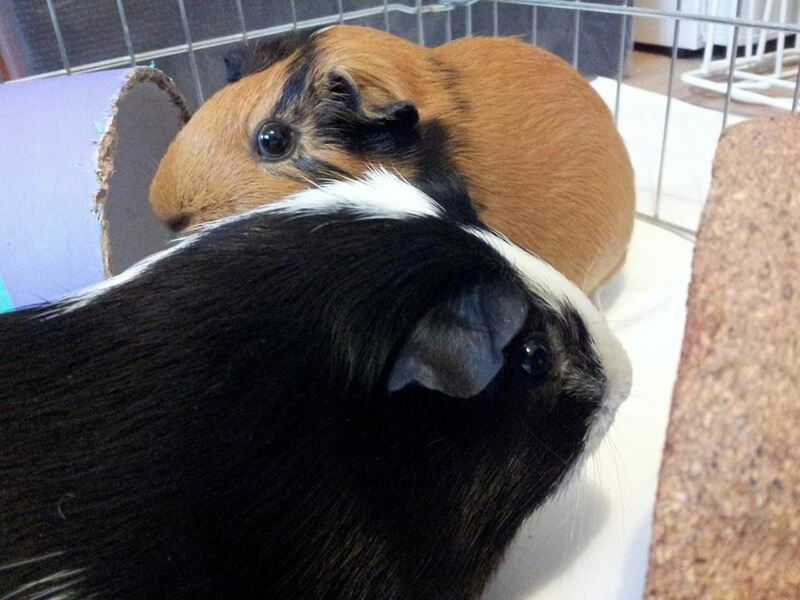 ​6th Dec. Summer action shot of Chilli & Pepper. 5th Dec. The gorgeous galar Candy. 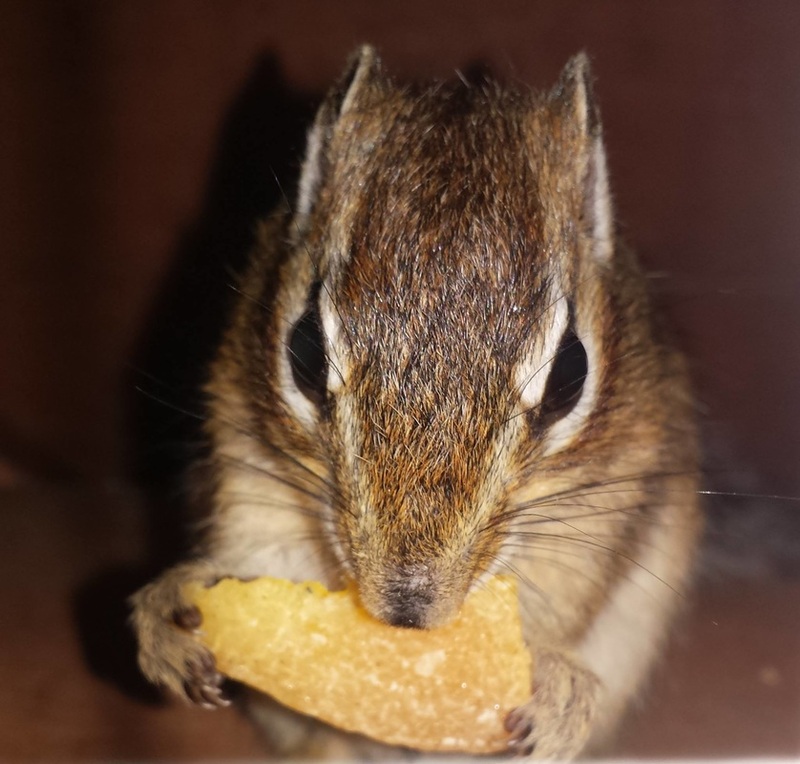 Advent calendar season, 25 adorable pictures of our guests! 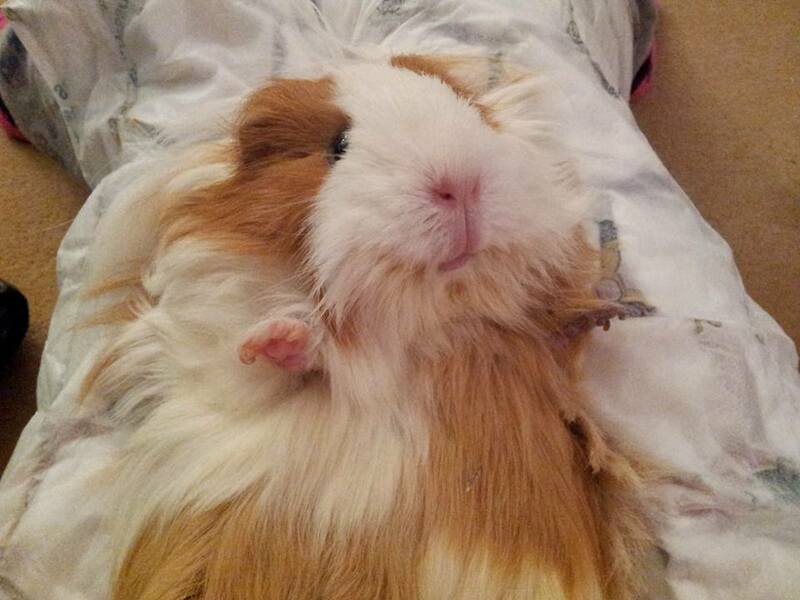 Starting with our very own piggy, Birdie. We have vacancies over the New Year period, so if you are heading away or having friends and family round we can look after your small furries. Drop offs from December 27th, 9 till 12. pick ups from January 4th normal times apply. 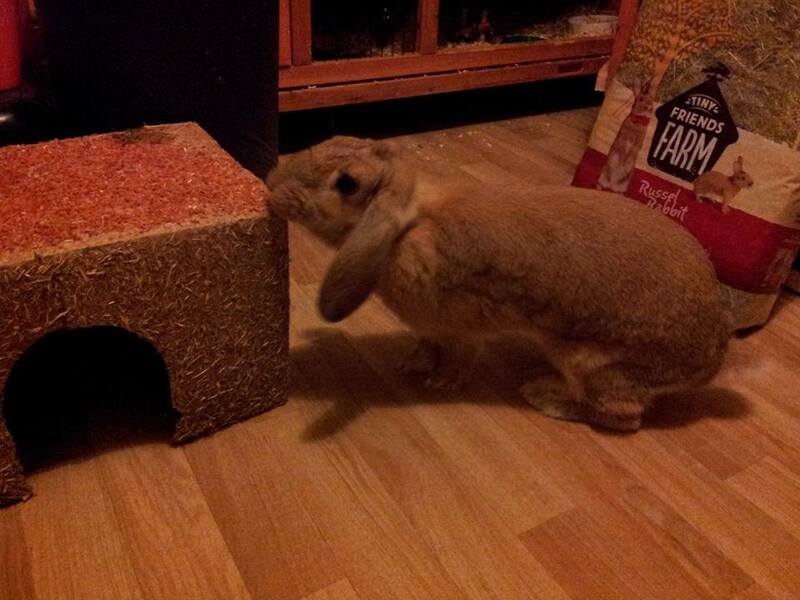 Big thank you to Mr & Master Skittering Pig for building the new accommodation I hope the bunnies will be very happy! 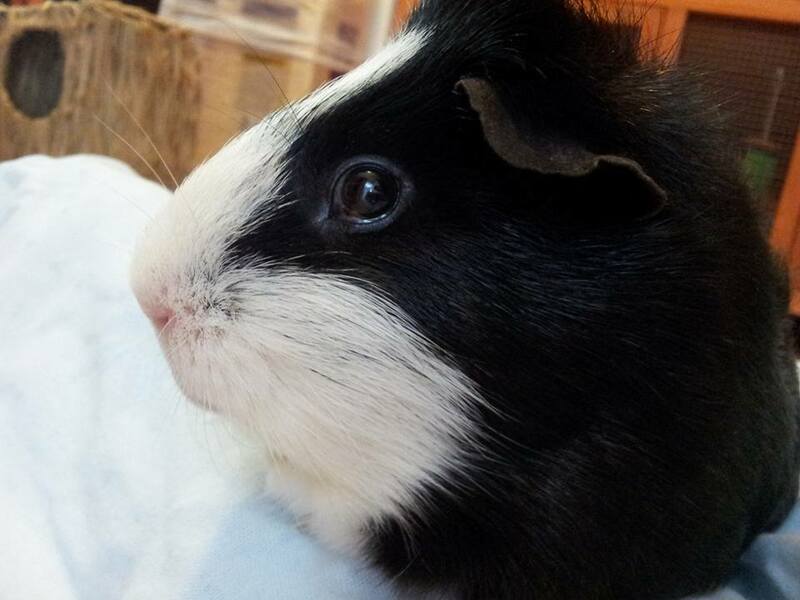 New boy Albert has totally settled here at Skittering Pig! 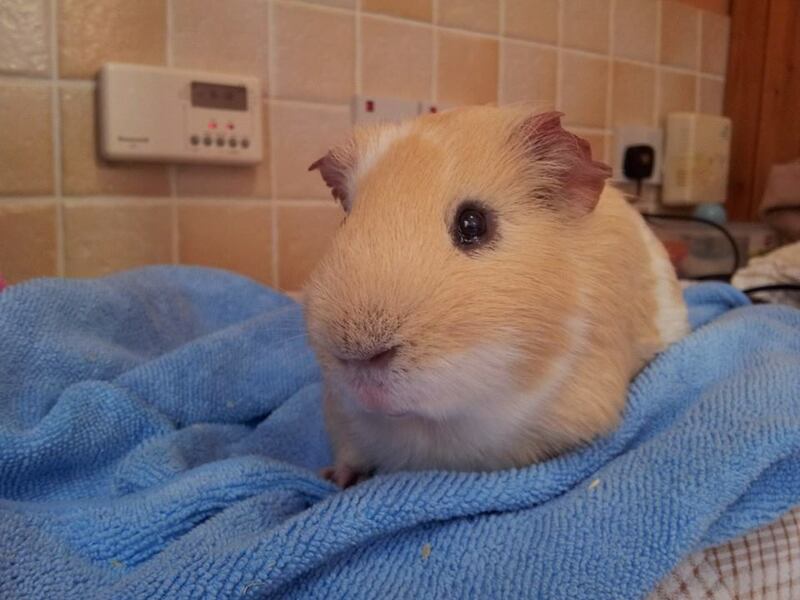 Albert has now gone home we really hope he enjoyed his stay and that he will come back for more cuddles. New guest day today, starting to get ready now for all our Christmas and New Year boarders. 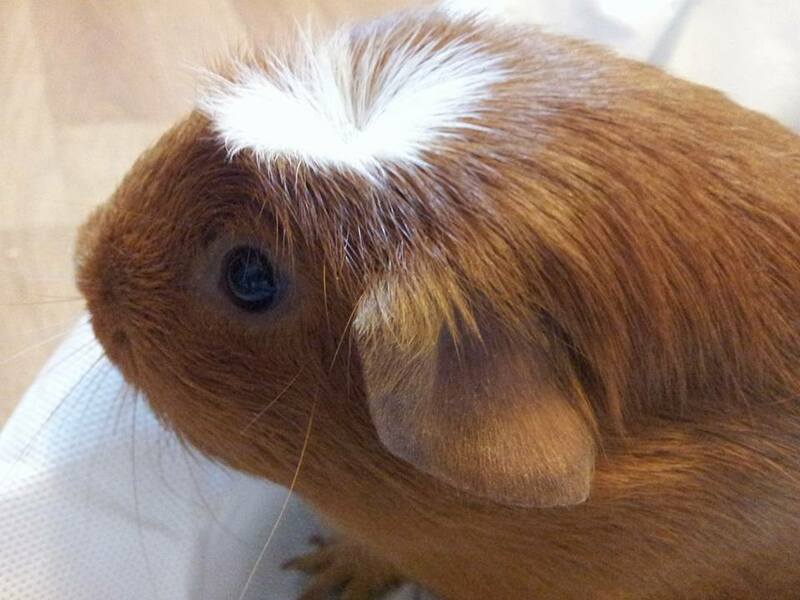 Pippin & Fudge called in this week for a pamper session they are only 6 months old and very cute. We also had another Fudge and Black Jack stop by for a second visit these two sweeties also had nice baths while with us. Getting ready today for some new guests. We still have some vacancies for over the New Year period. Running from 30th December till 4th December. We will not be accepting drop off or pick ups on December 31st, 1st, 2nd or 3rd January. Celebrations here this week Master Skittering pig had his birthday! All guests shared in the celebration with extra treats. 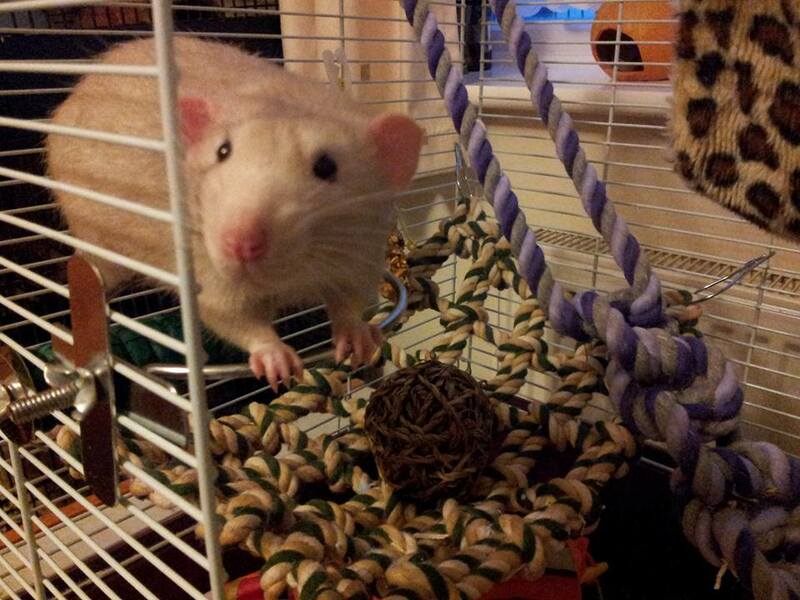 Cream & Benga two dumbo rat brothers were most pleased with their treat balls. 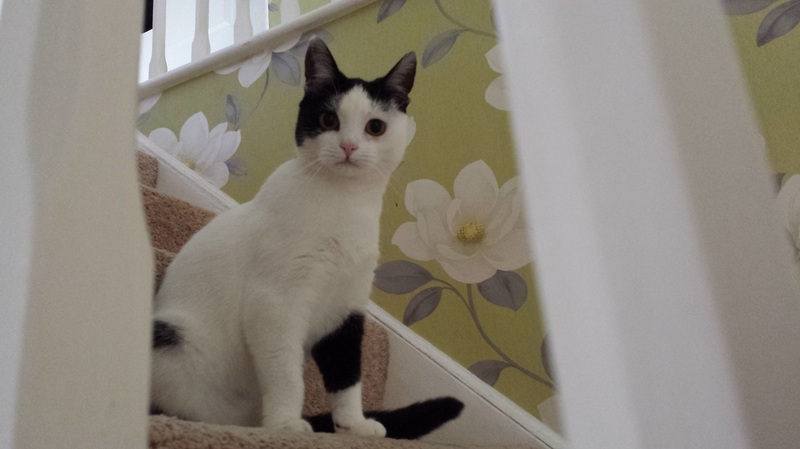 Marble & Blu mum has been very happy with our home visit service, we are glad she was happy with our services. 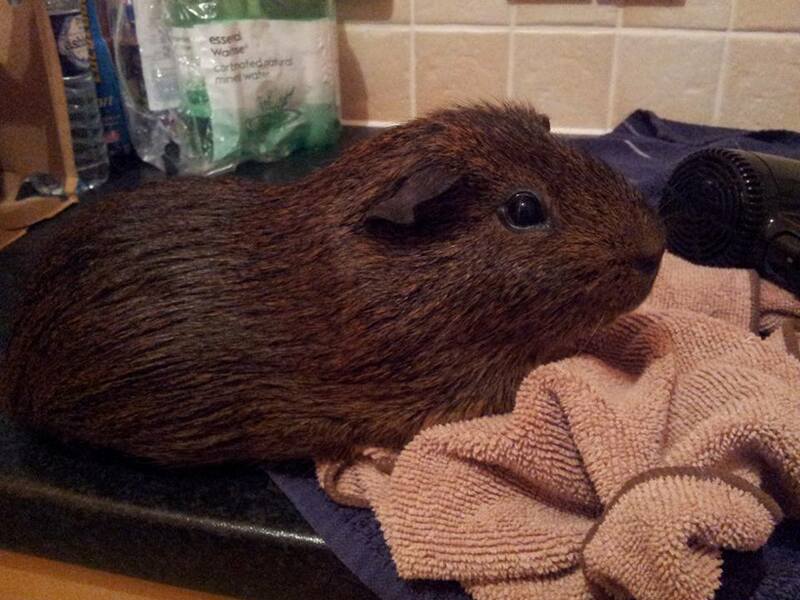 The 6 Piggyteers have arrived for a few days, Snowy has had a pamper with bath time tomorrow. Fizz has been a very good girl taking her medicine with no fuss. The Furry Trio have now gone home loved those boys! Bella & Patch have arrived today looked on by Alfie & Daisy. 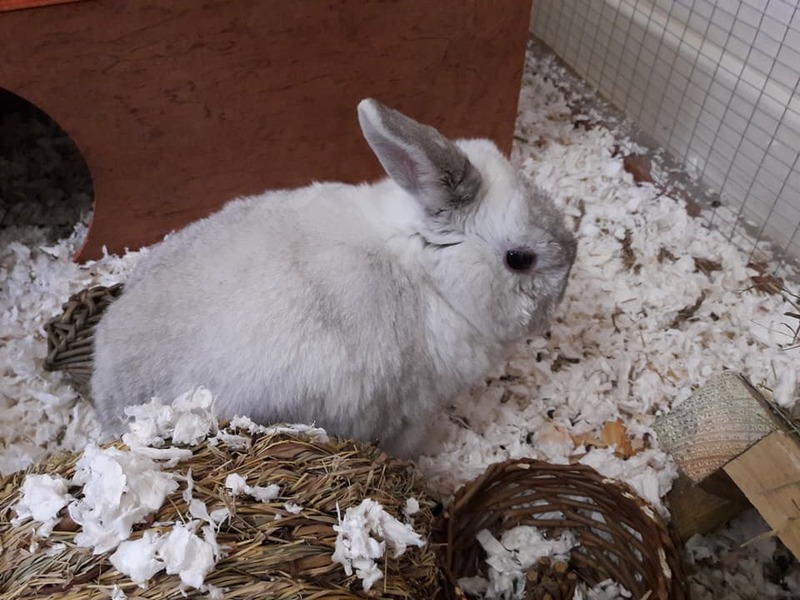 The Furry Trio have been joined by lovely fluffy bunny Alfie, cute ladies Honey & Daisy and the 6 Piggyteeers of Snowy, Charlie, Harry, Teddy, Bubble & Squeak. 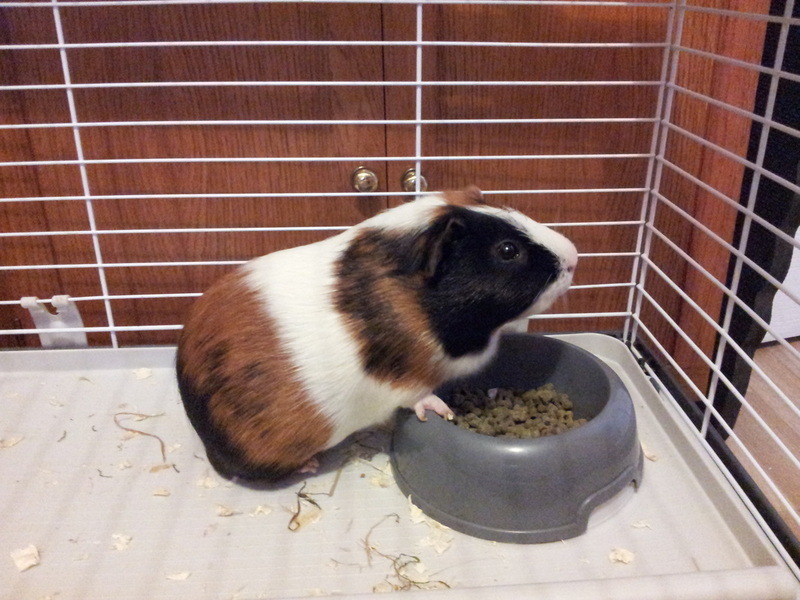 Bailey the bunny, Mack & Jack the piggies have joined us today all three are settling in. Barley & Buttons have had a great time these 2 girls loved making a lovely mess! 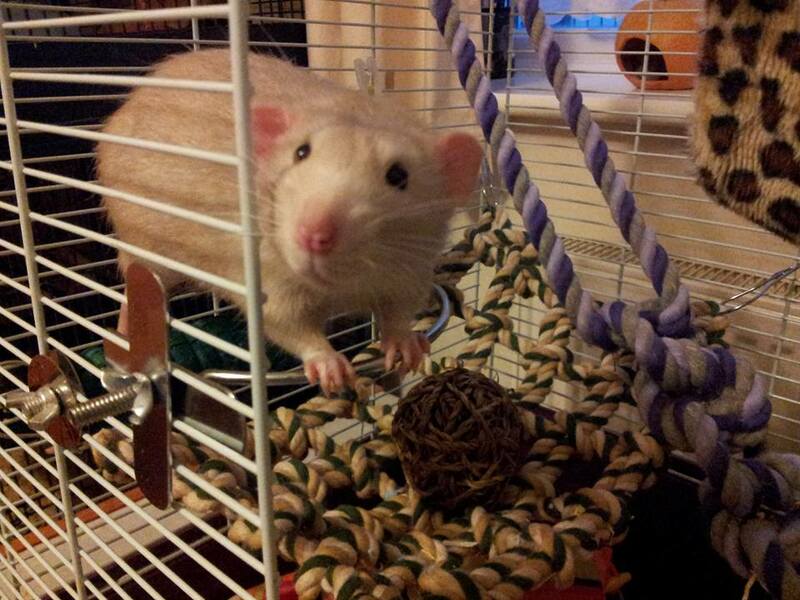 More new guests this week, Cream & Benga 2 rat brothers have been settling in. All guest were loving their new toys this week lovely to see them all so excited! 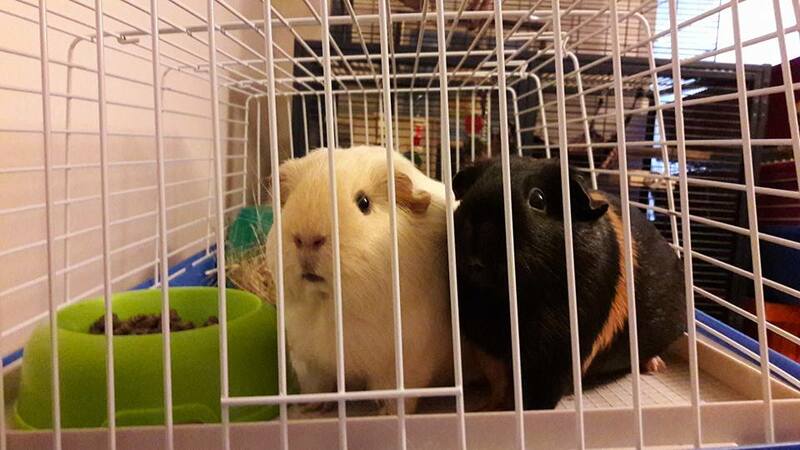 New guests Darcy and Louis settling in! Thinking about a Half term break? 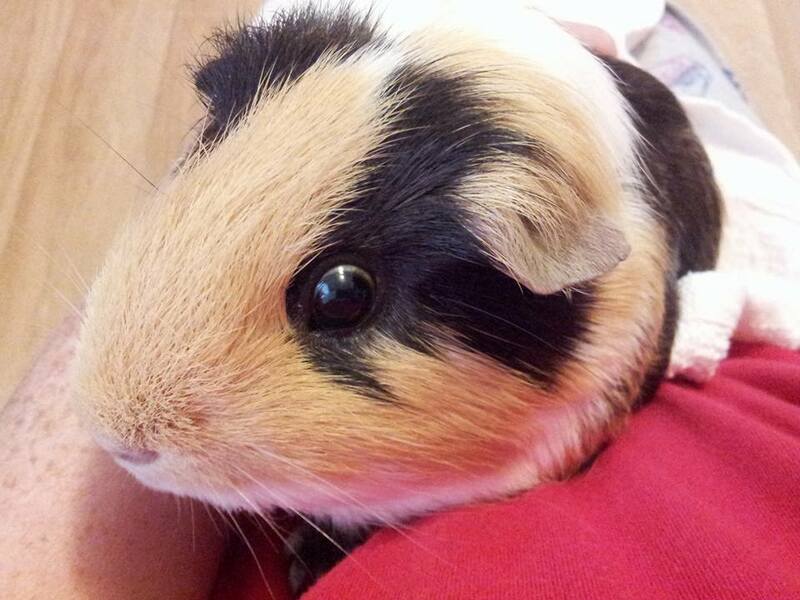 Dont forget your small furries, let us here at Skittering Pig pamper them and spoil them while you relax. 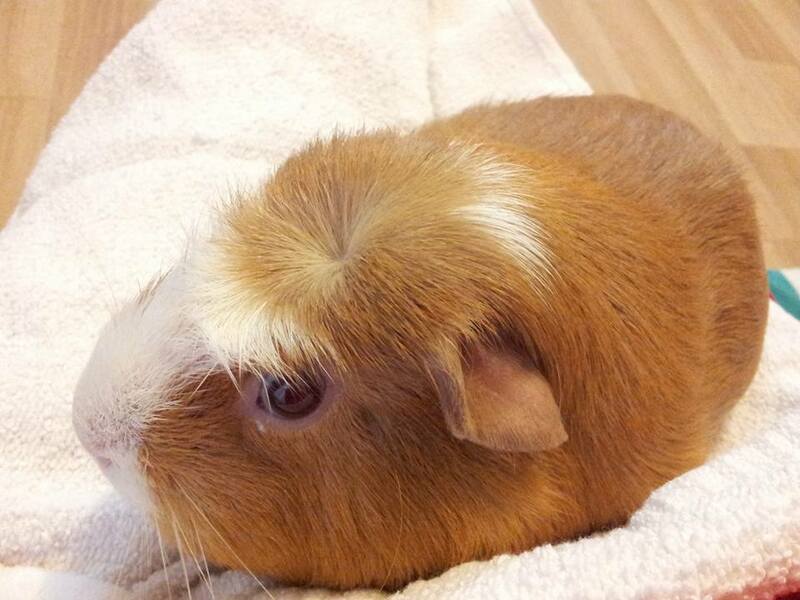 You can also book them in for a lovely bath and nail trim only £5 extra per booking! BIG NEWS! 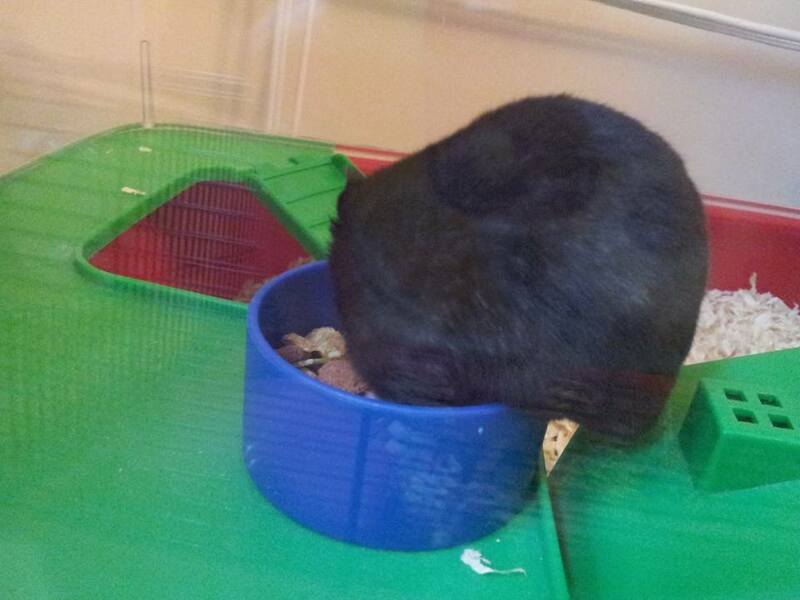 due to a demand by our clients Skittering Pig are now offering a cat feeding service, we will visit your home and feed your feline as well as looking after your small furry in the comfort of our animal hotel. Rocky & Crunch, Natchy & Mimi are back for the weekend! being joined by Barney & Lola two snuggly bunnies. Lots of coming and going over the past week. In for a few days on holiday from Hogwarts was Harry Potter & Ron Weasley, Pixie & Coco made another visit too. 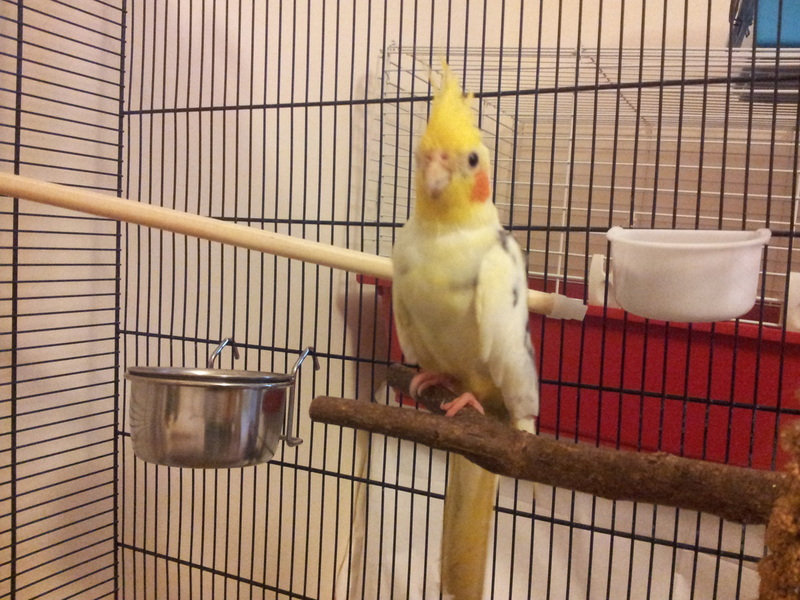 We have also been joined by these handsome feathered friends, Mango, Chutney, Eli & Leah. Blossom & Bubbles have also arrived for the weekend. All guests smelling sweet and looking beautiful after their pamper day. 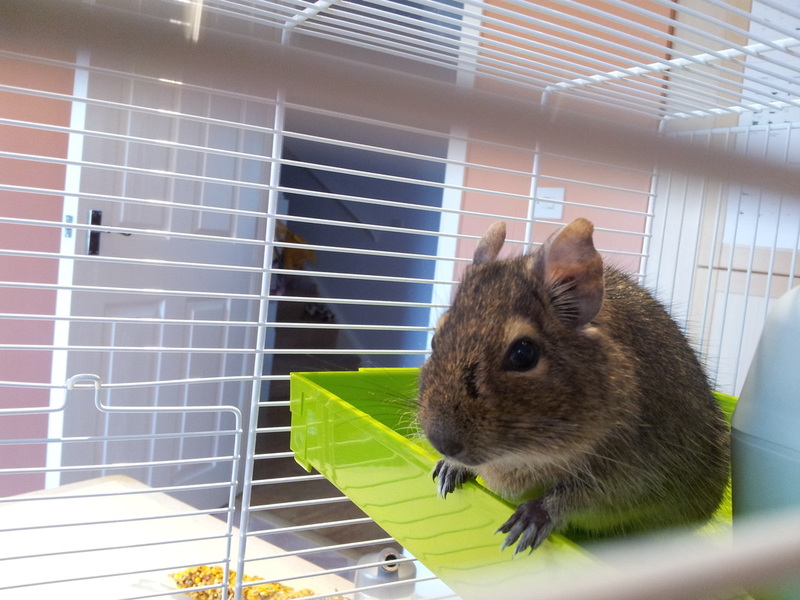 This cute little fellow is Diego the degu he is very cute and very vocal. Wow busy days here a Skittering Pig. 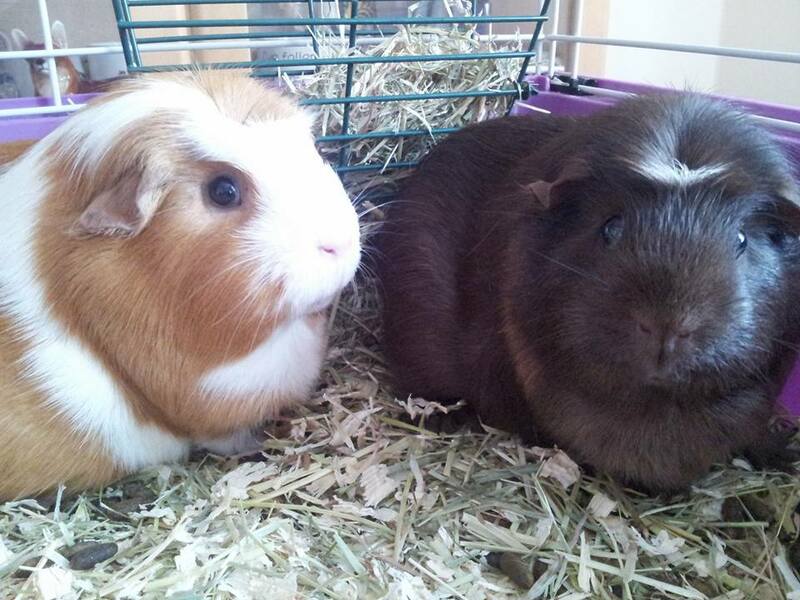 Gorgeous Callie and handsome Hammy have departed we hope they enjoyed their holiday with us. 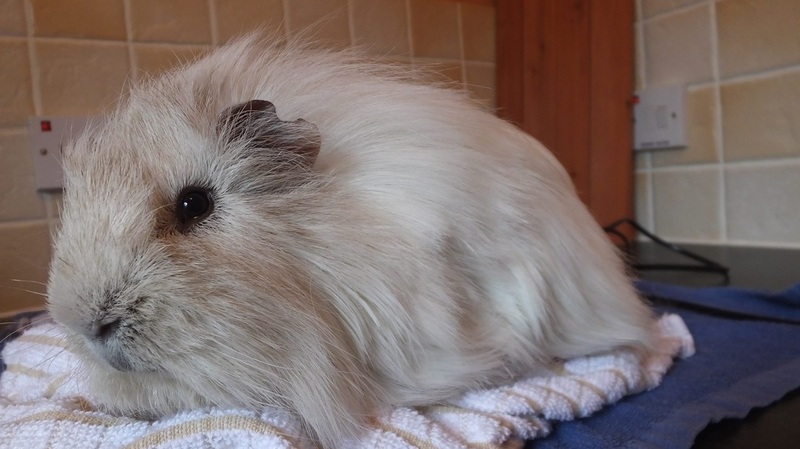 Pictures to come of Alfie & Archie two guinea pig boys, Diego a handsome, funny and super cute Degu and back for another visit the very pretty lady piggy called Lola who is a sibling of our very own Birdie. 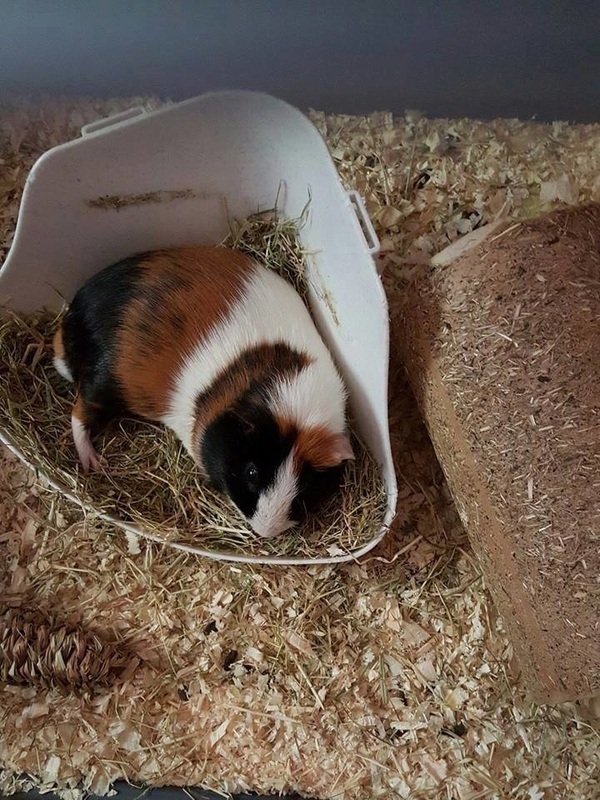 Rocky, Crunch, Chilli & Pepper are having great fun with the compost box and foraging in the big run, had grumpy faces yesterday as they had to have indoor play, Bubble,Squeak,Fizz,Lily,Scully and Biscuit all had playpen time, new boys Alfie & Archie had a pamper and nail trim. 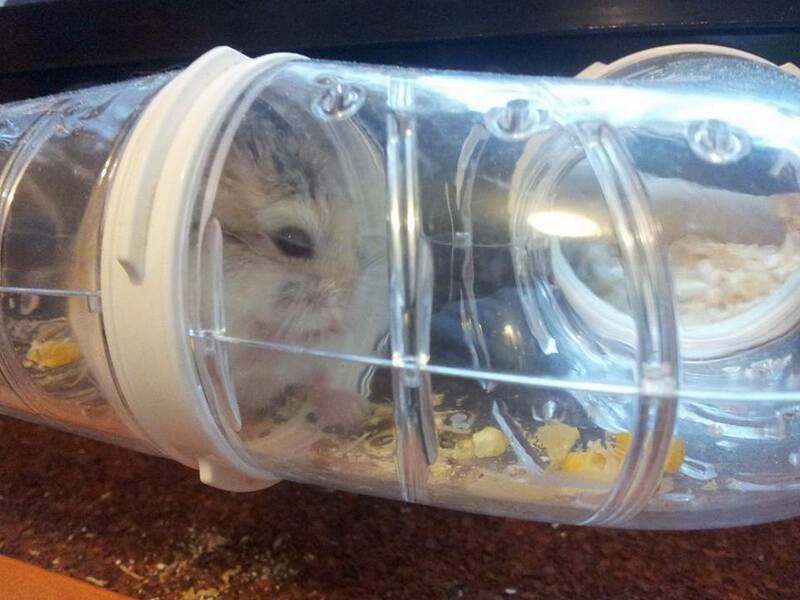 For Fudge & Daisy the hamsters it was all too much and they slept most of the day. Lots of guest have now departed, so its a big wash up and clean down day watched and inspected by our 'Girls' Lulu & Ruby. Garden time for Bubble & Squeak and later it will be pamper time for Heidi & Pippin, Hammy and Daisy are of course still in bed! 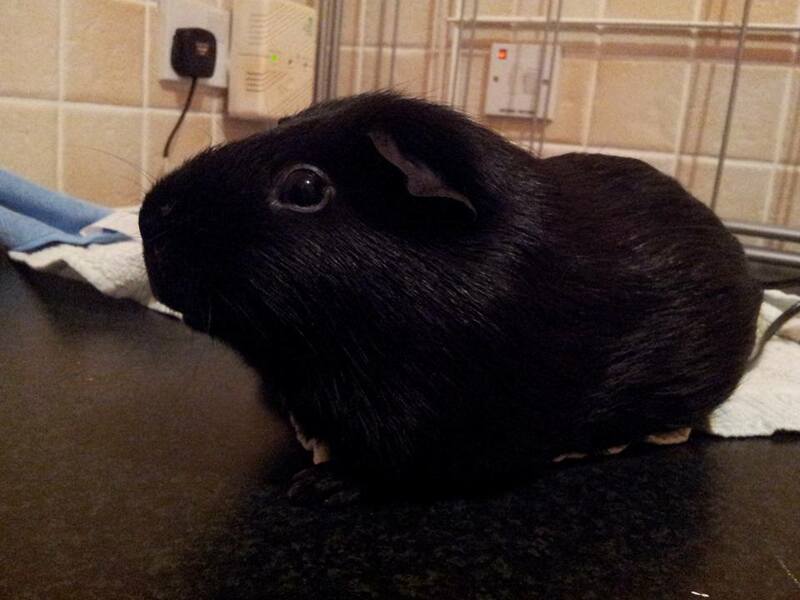 Some pictures of guests first up is Fudge & Black Jack, then super speedy Daisy she is so fast! 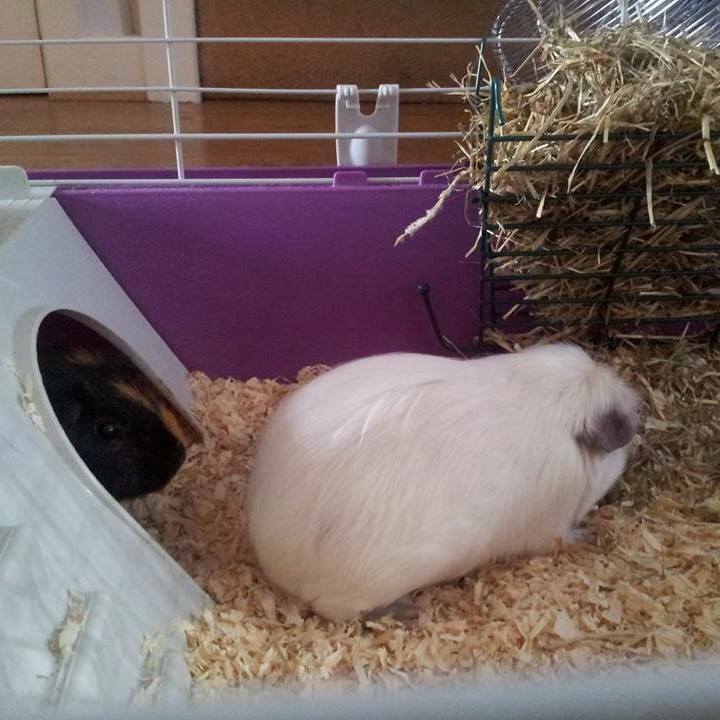 and always so busy :) Two cute piggys in the form of Heidi & Pippin they are quite young and skitty but have settled in well. 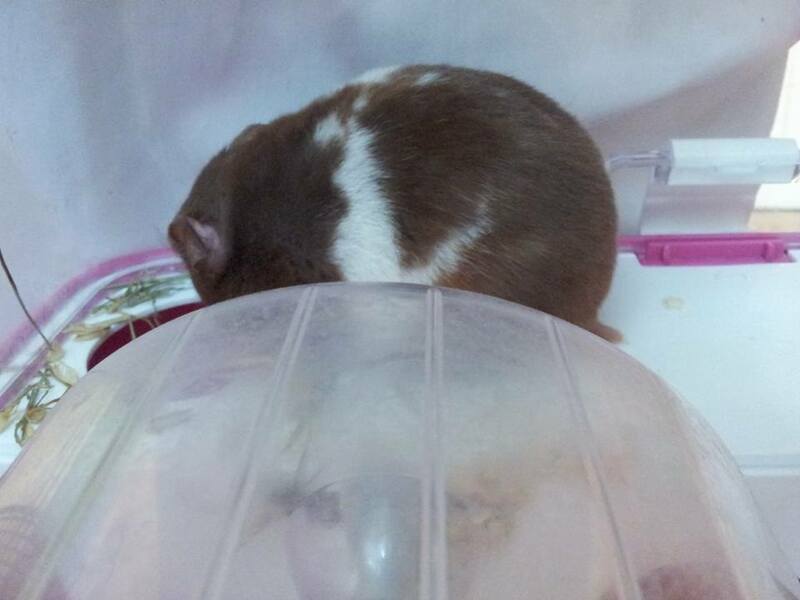 Managed to get the other hamsters, the brown and white is Ziggy and the black one is Hammy. 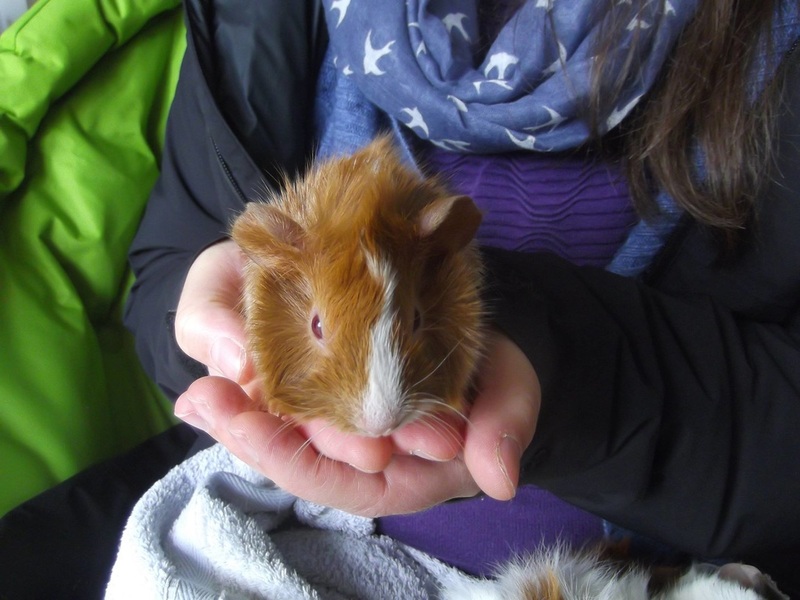 Busy day guest departing and guests arriving, Dizzy & Bubbles have gone home but we have welcomed, Ziggy, Daisy & Hammy the hamsters and Moon & Star guinea pigs are back with us for a few days. After the horrible wet day yesterday we have managed some run time for Bubble & Squeak and the 4 Piggyteers (Thistle, Dolly, Crumpet & Kiko). Stanley is playing in the playpen, well actually he is currently asleep. Pamper time for Fudge & Black Jack. Holiday Time! Lots of piggys coming for their holidays. 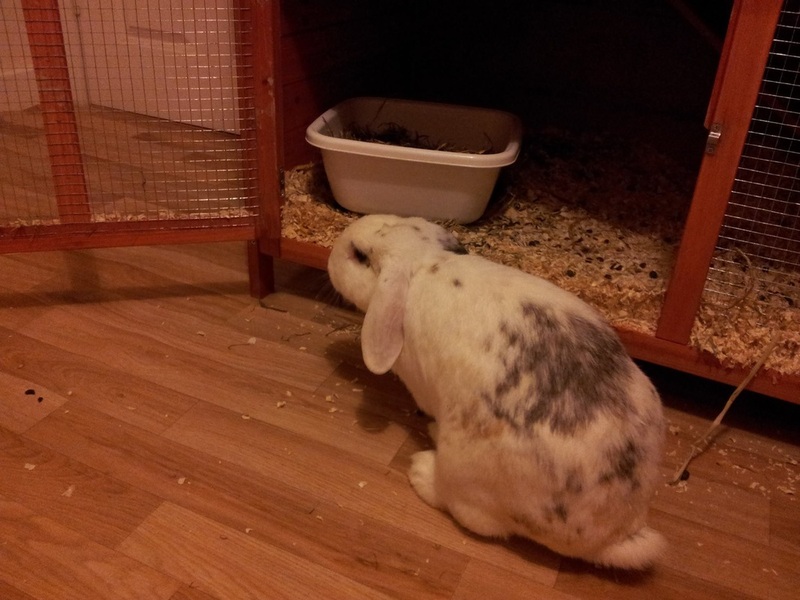 Some pictures of our new arrivals, Thistle, Dolly, Crumpet, Kiko, Bubble & Squeak. 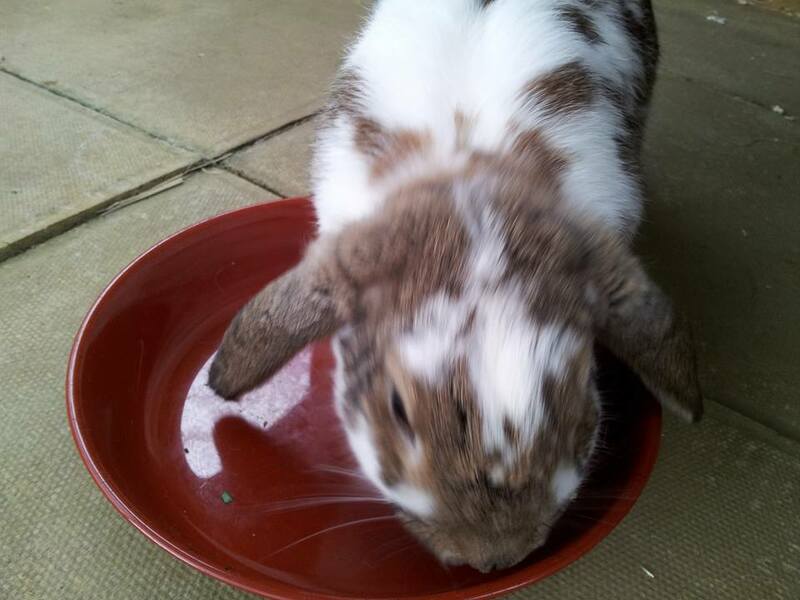 We sadly learnt yesterday that one of our regular guests Mabel the rabbit has passed away, our thoughts are with her mum & dad during this difficult time. 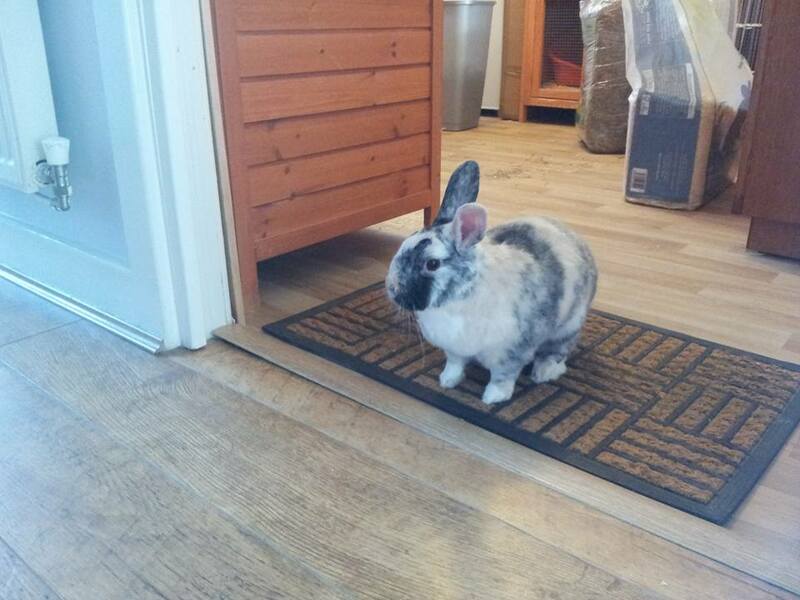 We have a new guest, Stanley the rabbit has joined us for some holiday time! 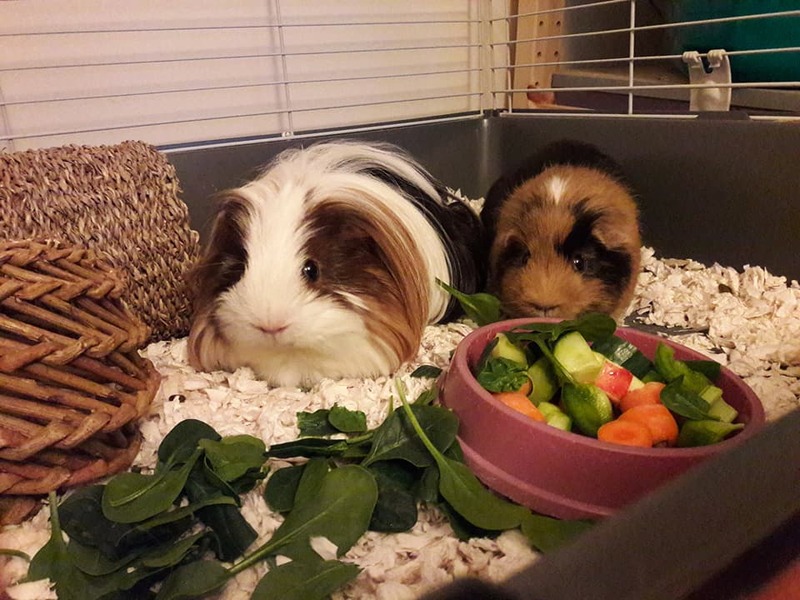 Bubble and Squeak are getting totally spoilt, Bubble has been a little poorly which required a trip to our vet, glad to say after some antibiotics he is back to his busy self. Wow what hot weather, all guest had garden time early this morning but were back in the cool by 10am! Remember to not leave pets in direct sunlight but provide plenty of shade also make sure they have water. Our guests finally managed to have some garden time! 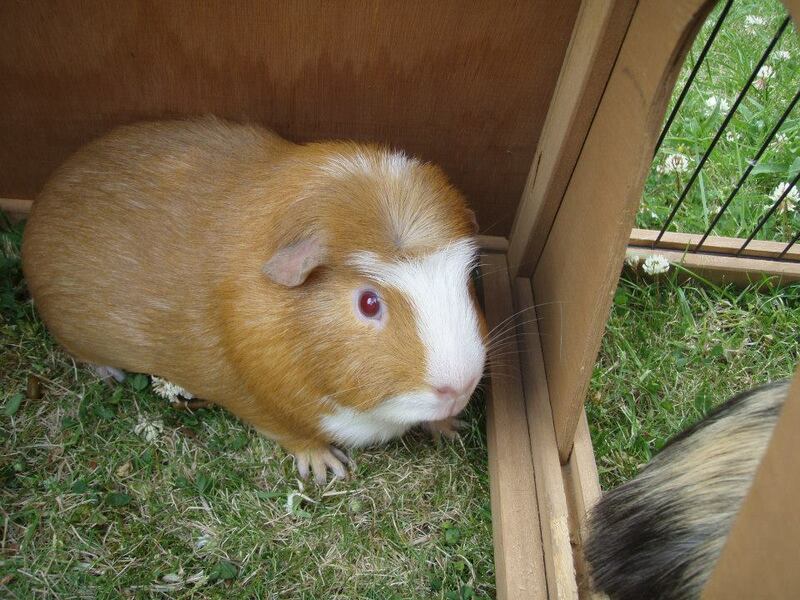 Hoping to put up some pictures later of our latest guests, guinea pigs Moon & Star and Bubble & Squeak. Celebration day! 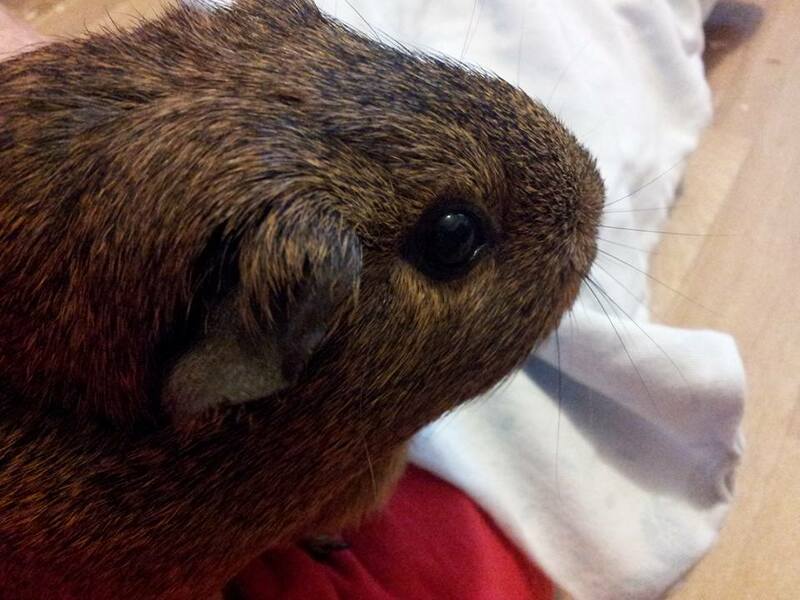 Skittering Pig is 1 Yes we have been running a whole year! A huge thanks to friends and especially my family for supporting me and of course massive thanks and appreciation to all my clients who have trusted me with their precious animals. Here is to many more! 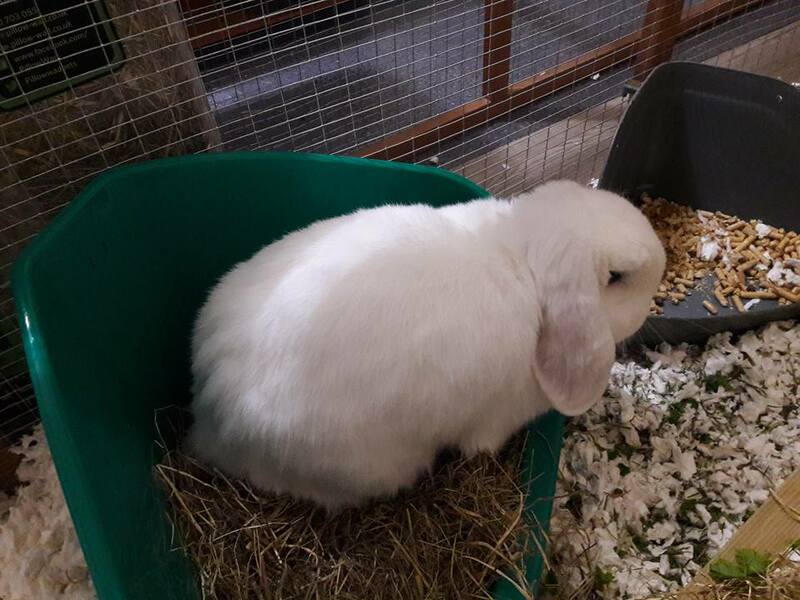 The cute bunny Yin has re joined us for a lovely weekend of fun and games, hope he can try out the sand pit (well compost/ earth pit). 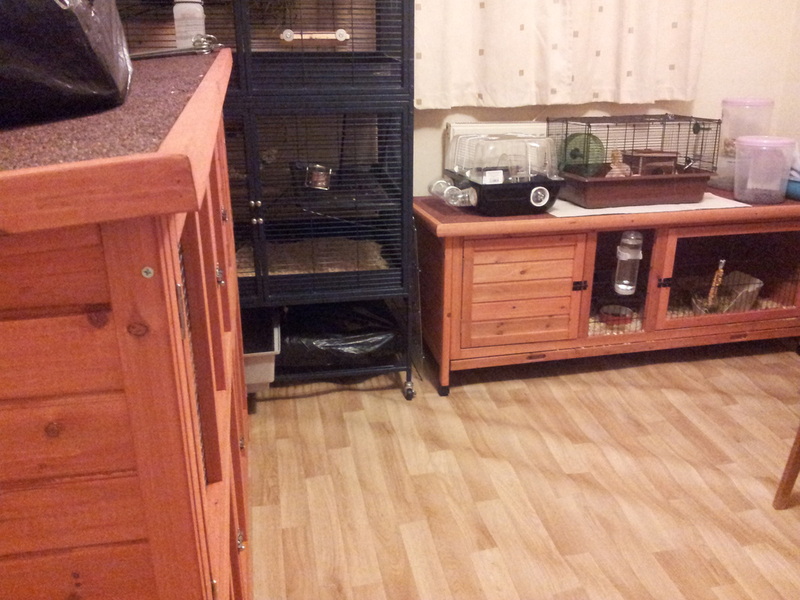 All our hutches and toys have been scrubbed and sterlised all nice and tidy , waiting now for our new guests. 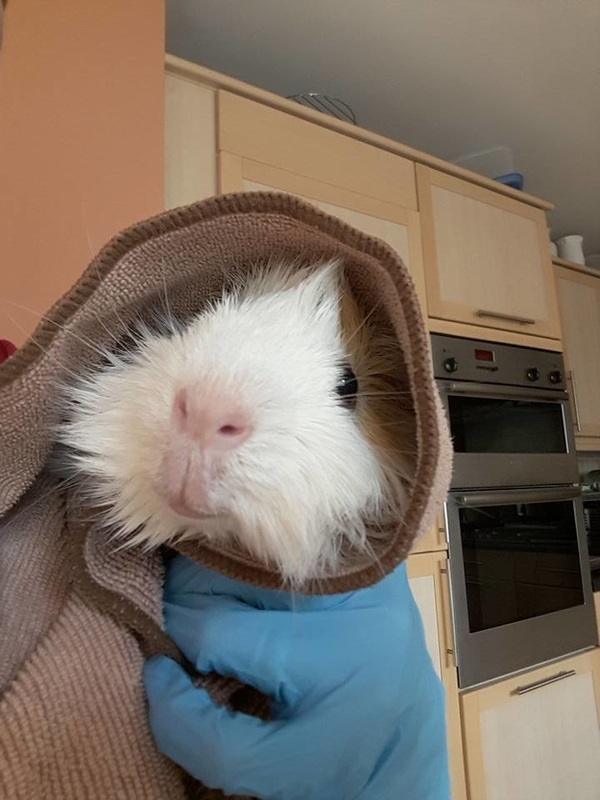 Having a rare quite moment the last of our weekend boarders Yin went home today so its just 'the girls', so tomorrow we are having a huge scrub down and major wash before our new arrivals. Lovely Yin has joined us for another visit, we so love having him. 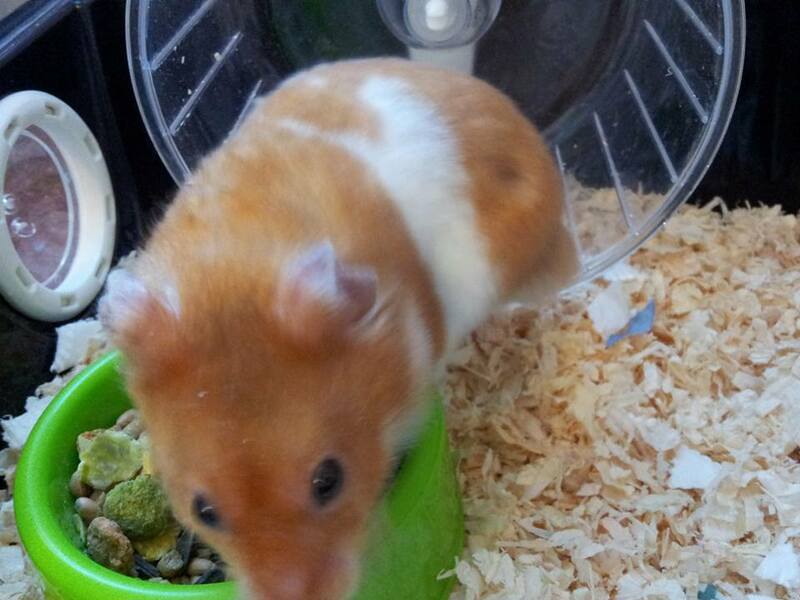 Also we welcome Sookie a very tiny hamster who is super fast! 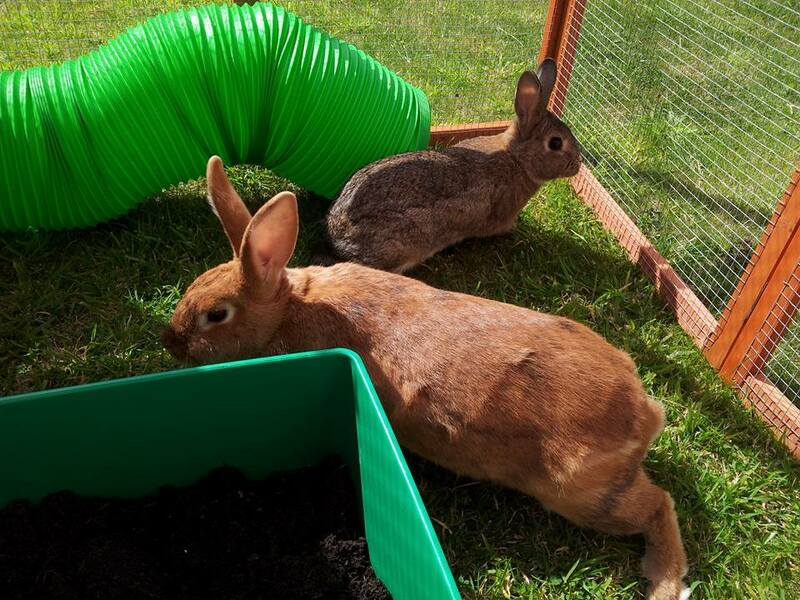 The gorgeous Phil & Ernie have joined us, the lovely bunny boys have had so much fun exploring including the new run and dig pan! Lovely day yesterday with Rocky, Toffee & Birdie. 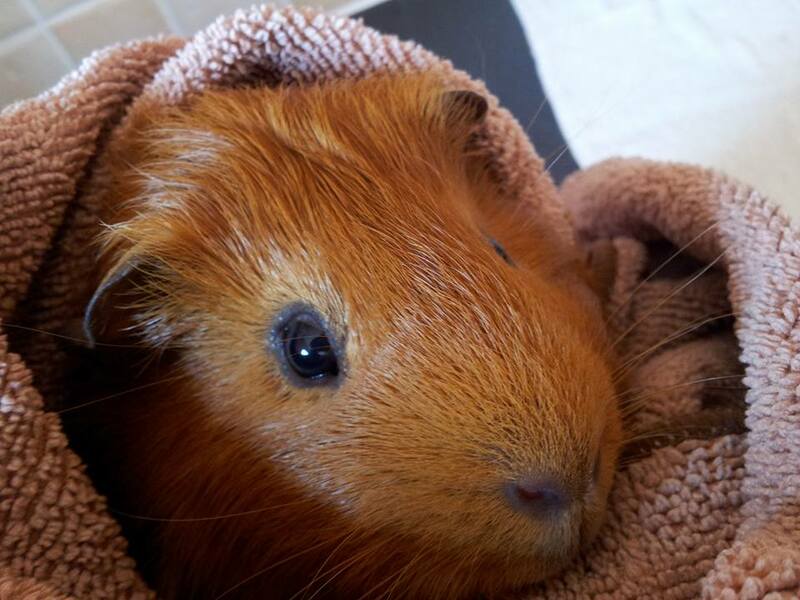 Rocky & Toffee spent the day in the run playing in the grass tubes, then the boys came in and had a lovely bath and dry with the hairdryer. 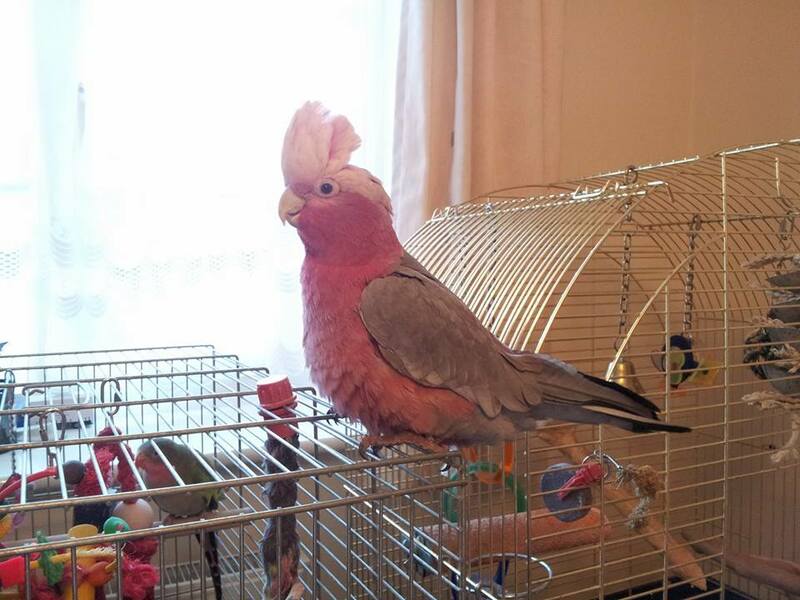 Then had Birdie out in the other run before bringing him in for his bath all three looked very smart and fluffy. Busy day! 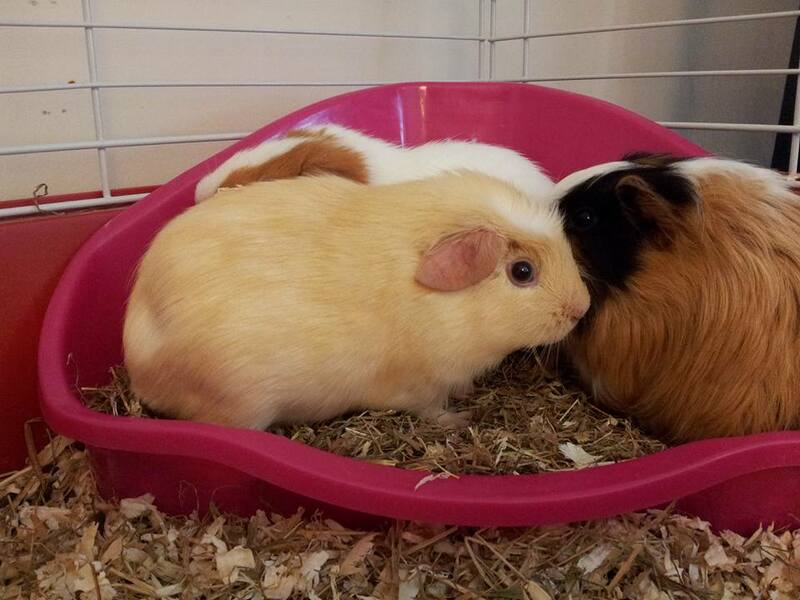 Rocky, Toffee & Toro have settled in well. This is their 3rd visit and were our first boarders, hope to get some pictures soon of the boys. 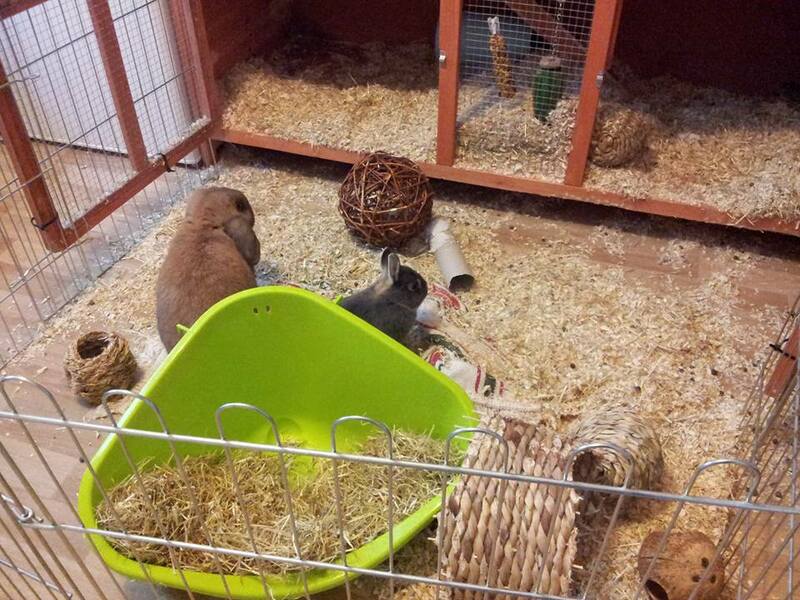 Two very sweet bunnies came for a pamper yesterday the cute Daisy & Poppy they had some time in our new bunny run and loved checking it out, I actually sat in the run with them and groomed them great space to be in and I am sure we will lots of happy bunnies. 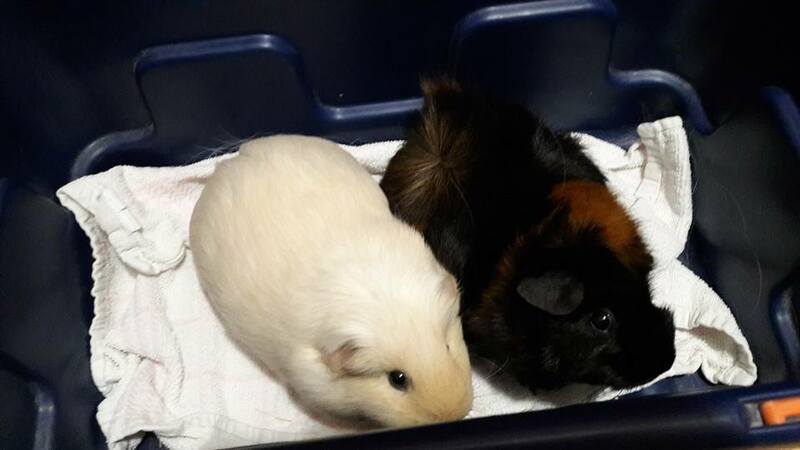 Today we welcomed cute guinea pigs, Dizzy & Bubbles these ladies are settling in well and I promised their owner a very sweet 3 year old that we were going to take great care of his pigs. Had this lovely comment from Candy, Sammy & Charlie's owners. 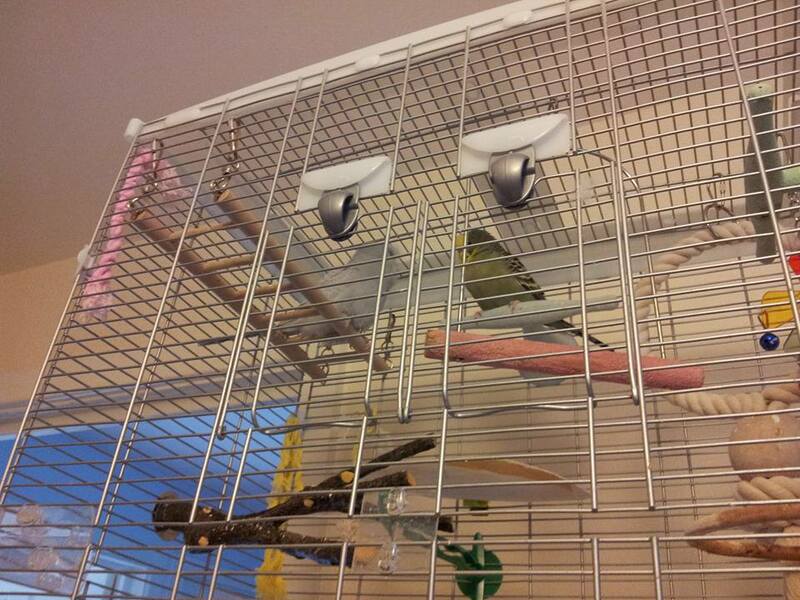 Sad day today as we say goodbye to our feathered friends, Candy, Sammy & Charlie. 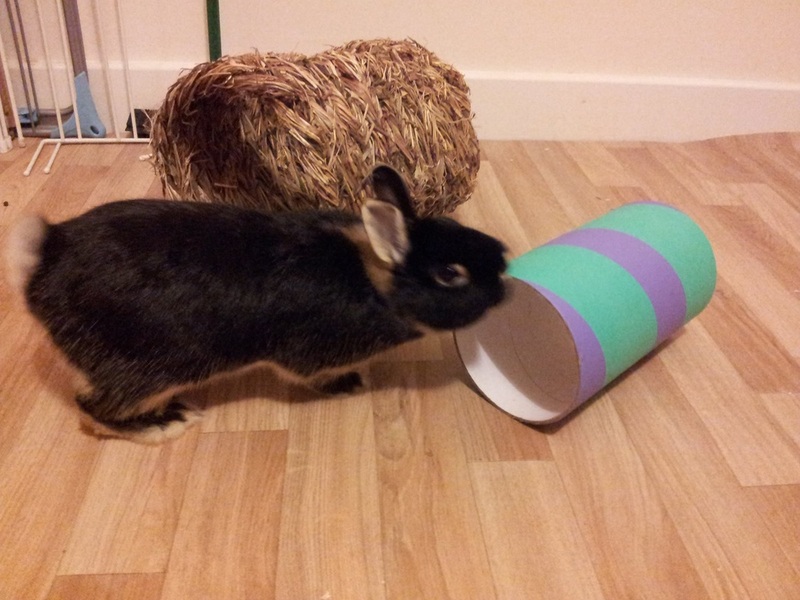 We are now a member of the Rabbit Welfare Association & Fund. 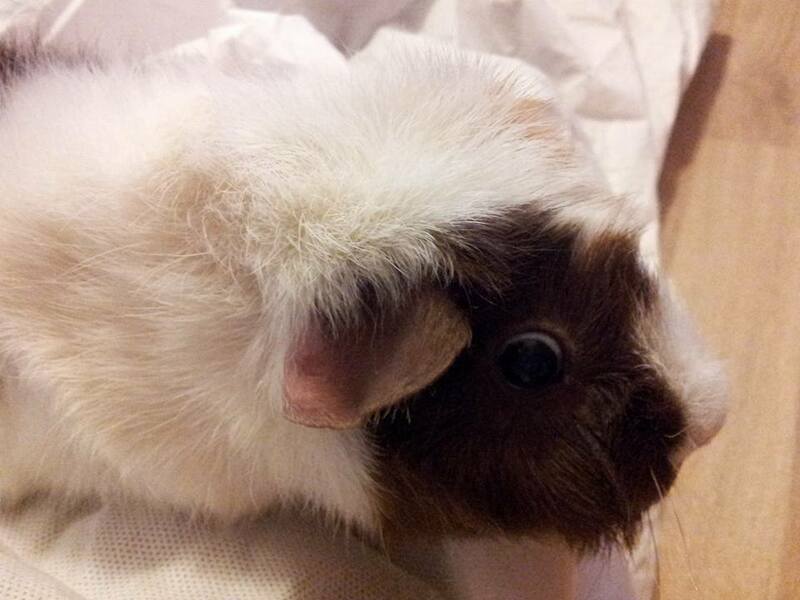 Skittering Pig always encourages owners to neuter and vaccinate their bunnies. 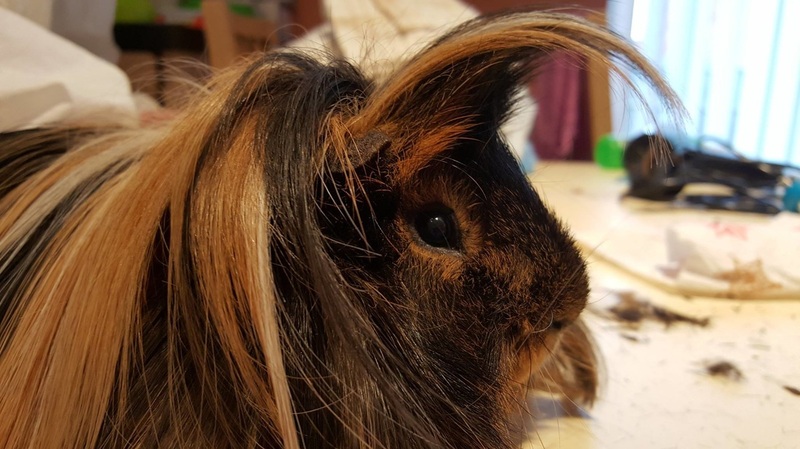 We always put our animals welfare first and try to educate that rabbits are a 10 year commitment while guinea pigs can live up to 7 years. Please consider the time these living creatures will need before buying a pet. 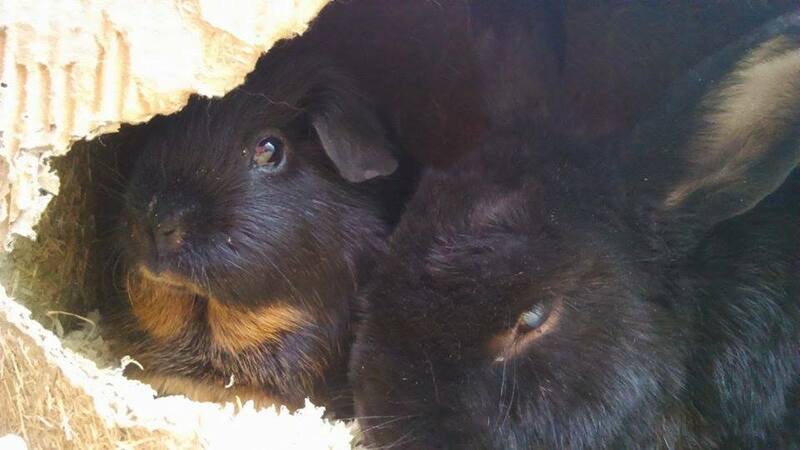 Harry & Teddy were bought to us by one of our regular clients, her husband had rescued them for awful conditions so they came here for some tlc and pampering, we had the boys for 4 days to make sure they were ok. 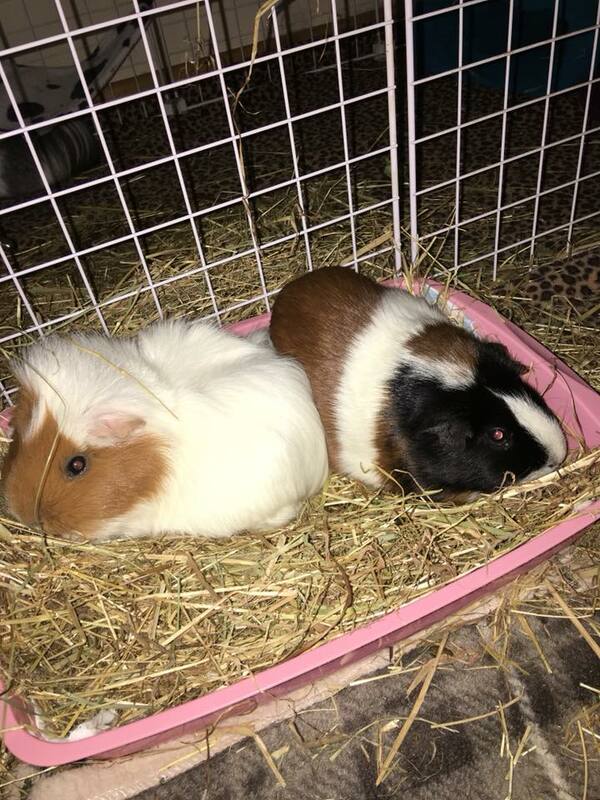 Happy to say both pigs are healthy and were taken to their new home today, they are going to be spoilt and have a much better life than where they were. 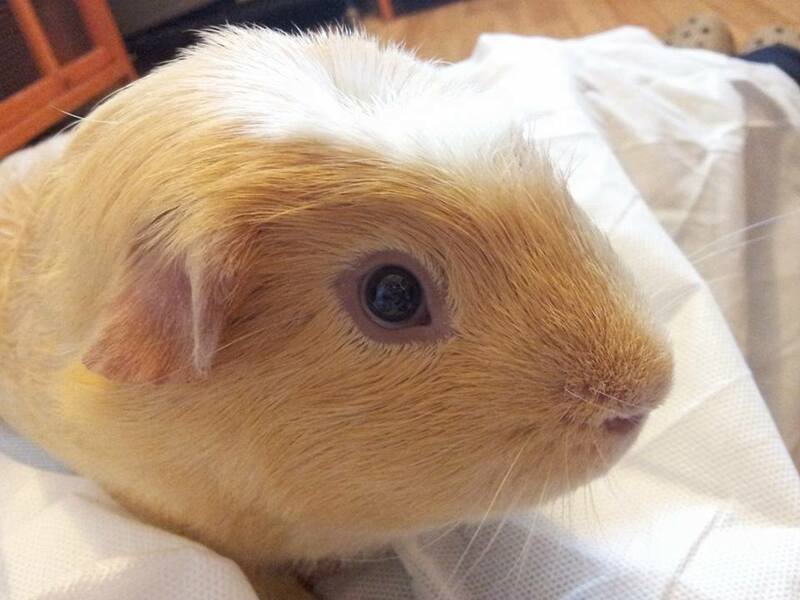 Sending get well wishes to one of our regular guests, the lovely guinea pig Snowy, we hope he is up and about soon. 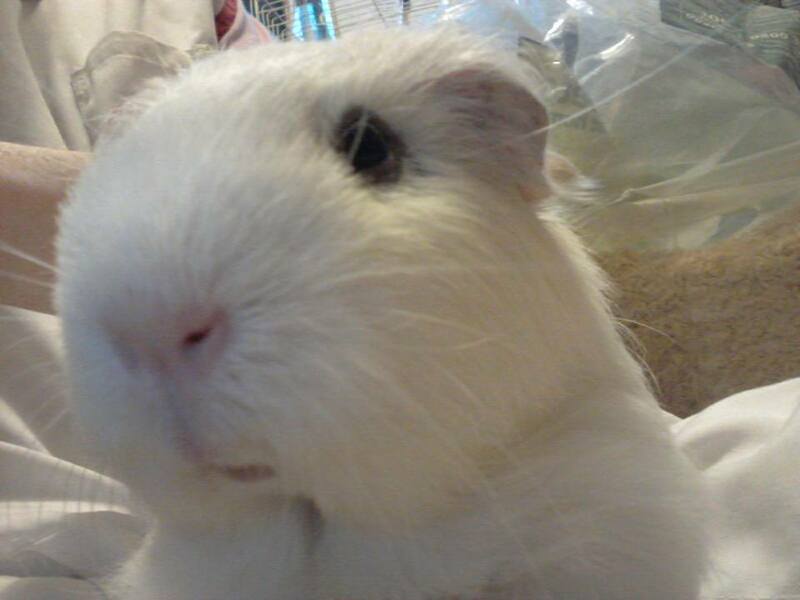 Glad to report that Snowy has an ear infection and is responding well to his medication. We all know the feeling just got back from holiday managed to pick up some milk on the way, go to feed the small furry and find you have not picked up anything for them! 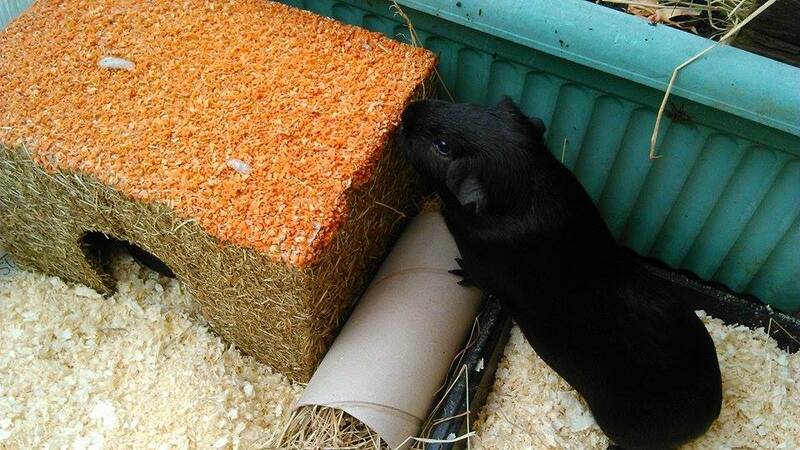 Skittering Pig can help, just give us a list of dry food, hay, sawdust and we can have it ready for your return. 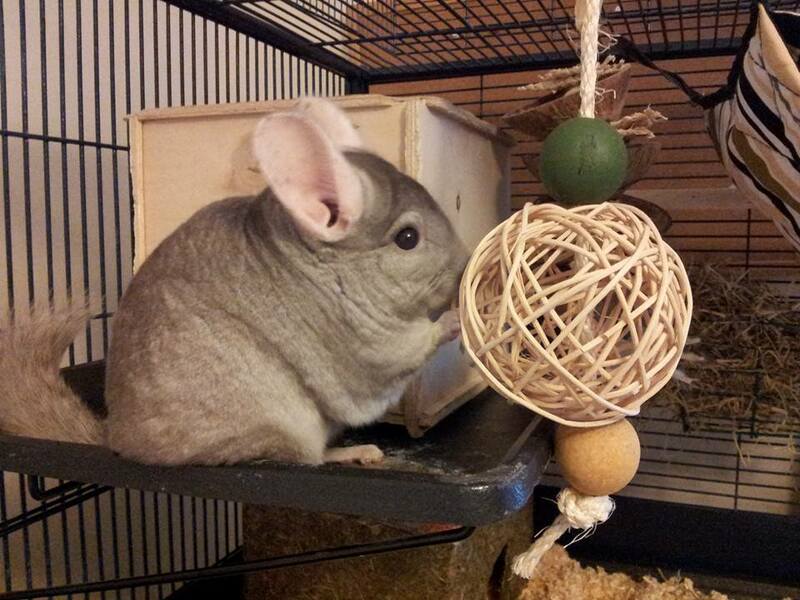 Sweetie Yin has gone home but Chilli & Pepper are back for another weekend of being pampered and spoilt. Clean out and pamper day ready for the weekend! Here is hoping the weather holds so we can get guest out into the garden. Wow busy busy! 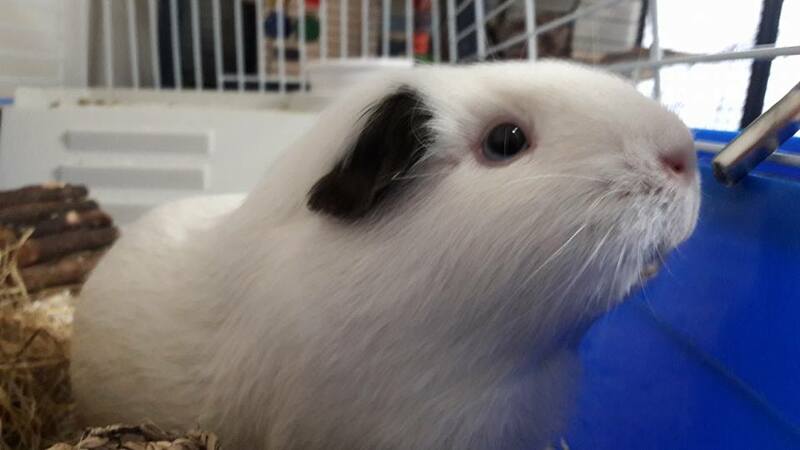 Yin has settled into the routine and is enjoying all our new guests! 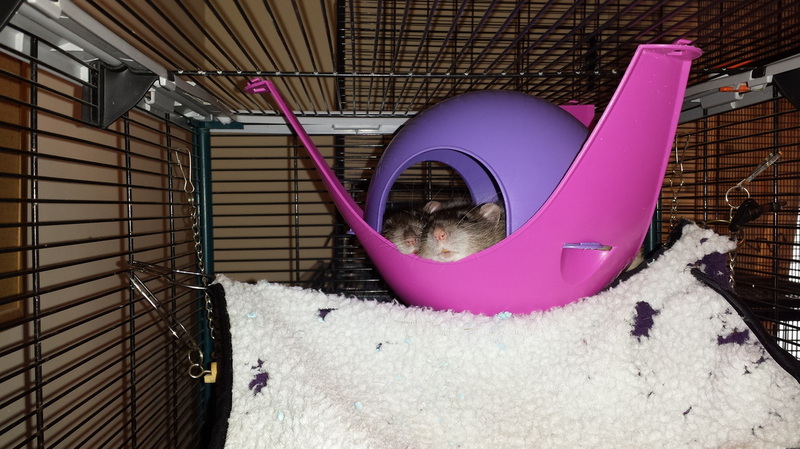 First up are Bindi & Rembrandt two cheeky rats who love to hide in their bed pod, Cookie the hamster is super cute and love to tuck into his fruit sticks and guinea pig boys Patchy & Wizz. 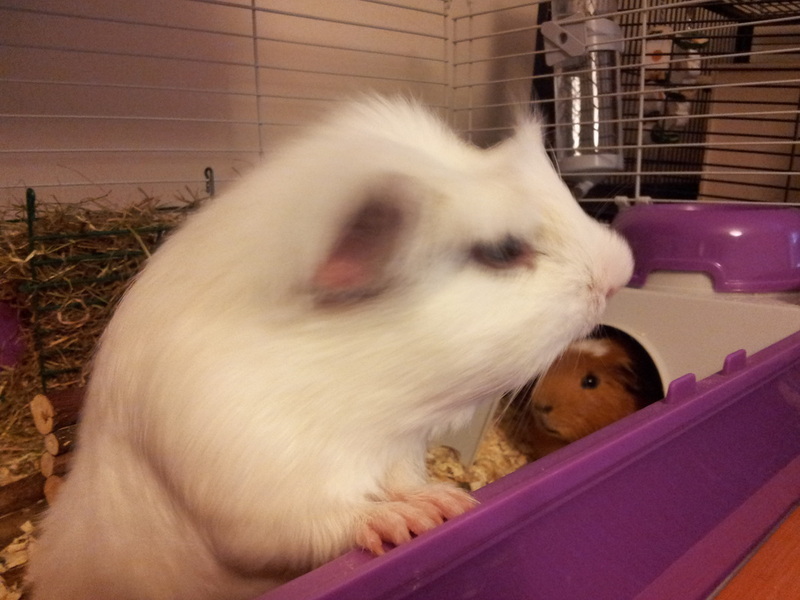 We have also had Snowy the guinea pig for a pamper day. Yin the bunny is back with us from tomorrow he is very sweet and no doubt will be looking for his coriander first thing in the morning. 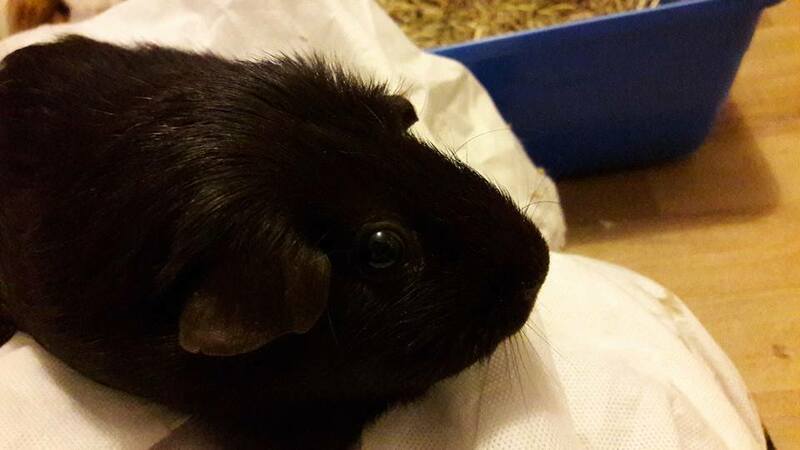 Dexter and Niklaus were great to have, Dexter was so cute and super fast! He loved his cup of tea in the afternoon and Marmite on toast! 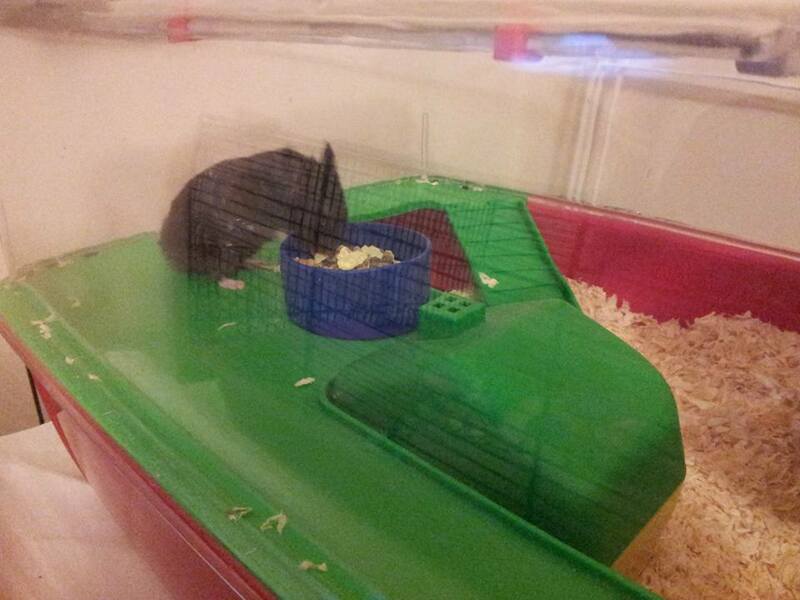 we did finally get a picture of Niklaus. 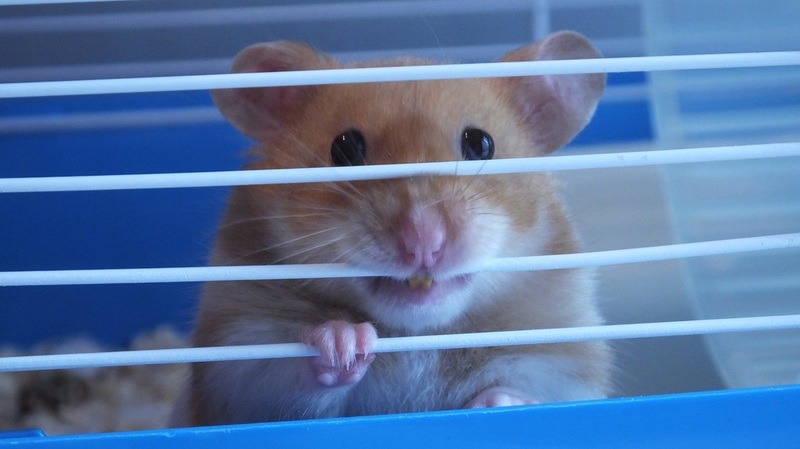 Smokey the cute hamster has gone home, tomorrow we are welcoming new guests, Dexter the chipmunk and Nikalaus the Pygmy hedgehog, hope to get some lovely pictures. 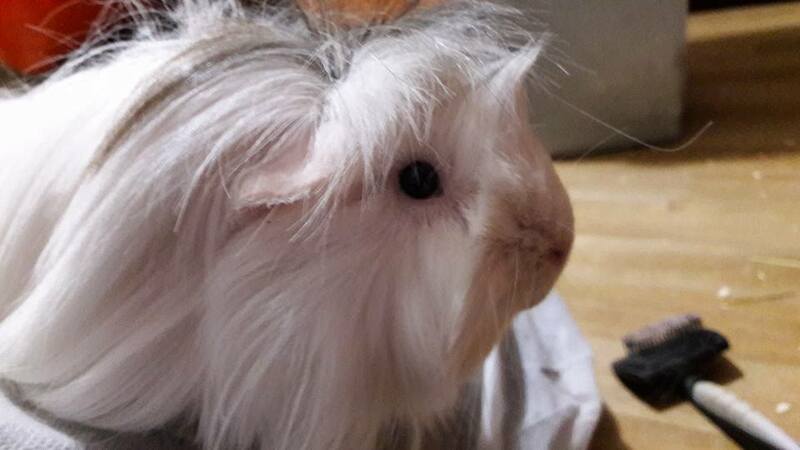 Rufus sporting his new hairstyle, Nelson was being camera shy. 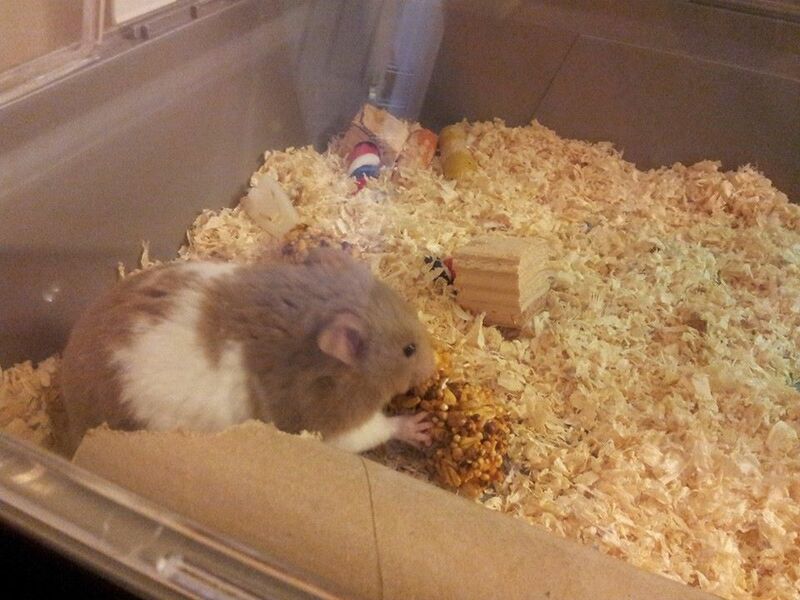 Busy week, we welcome the very cute Smokey the hamster and Rufus and Nelson have come today for a pamper day. 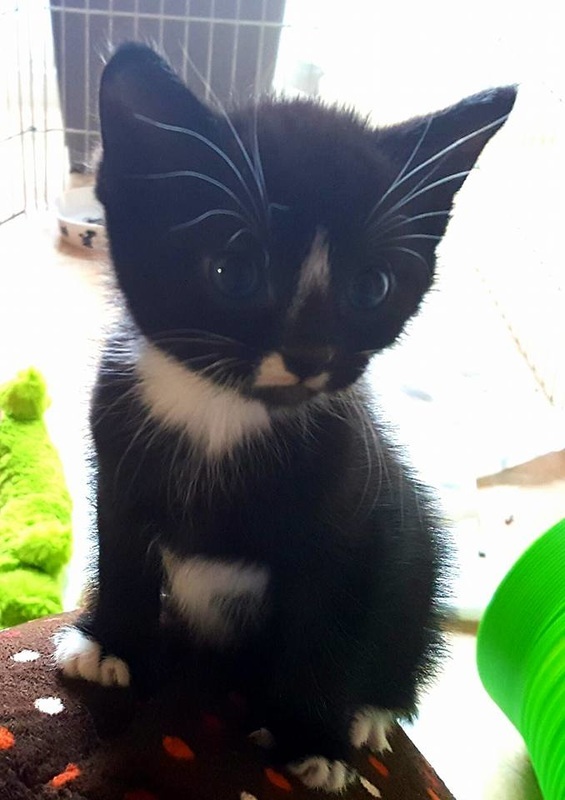 Cute little Yin has gone home, he was fine after his operation and his owner was very grateful for the service we offered. 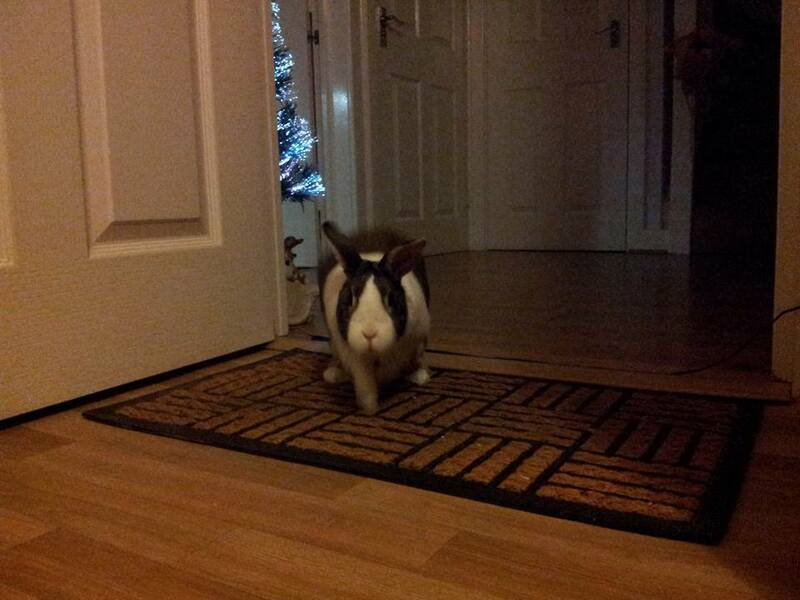 We hope he 'hops' back to see us soon. Our 'birdies' are doing well they have settled in and are enjoying the attention especially Candy who has free range most of the day. 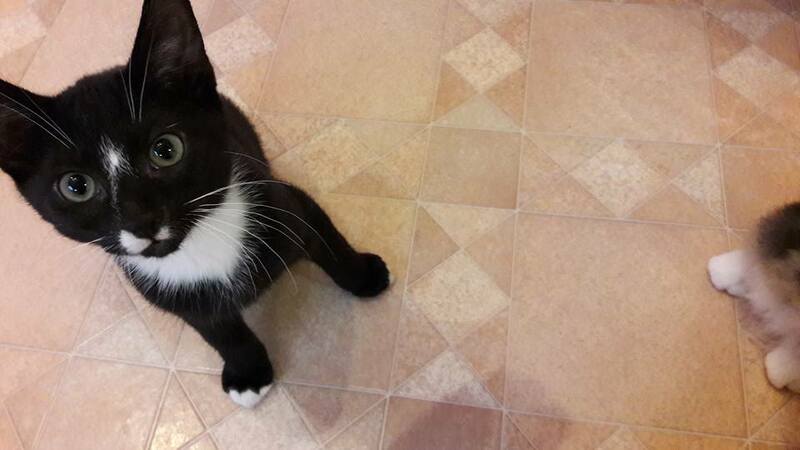 She is lovely and very affectionate. 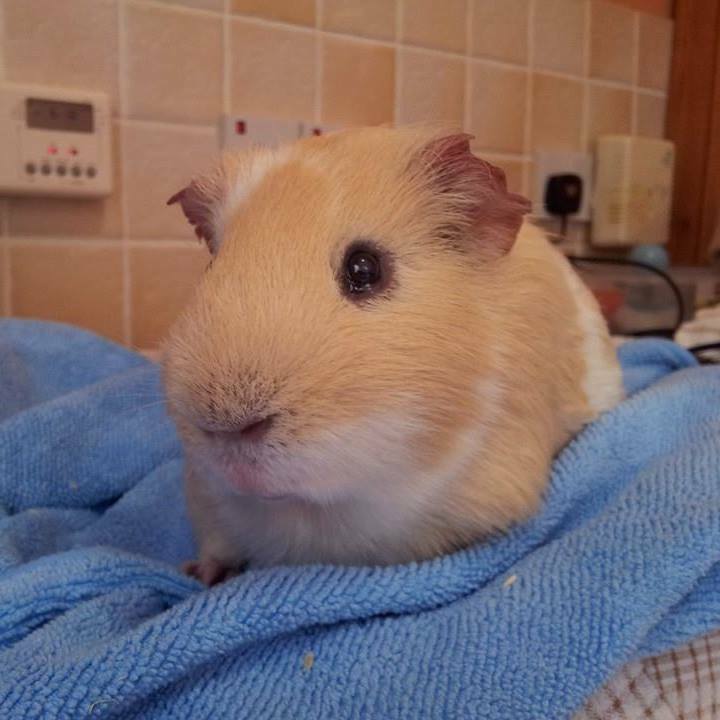 Yin has had taken advantage of our neutering service, he is doing very well after his operation, eating and playing, being very happy. We still have vacancies for this half term term! Yin is coming back to us this week, looking forward to having him back. Phew! what a busy week! 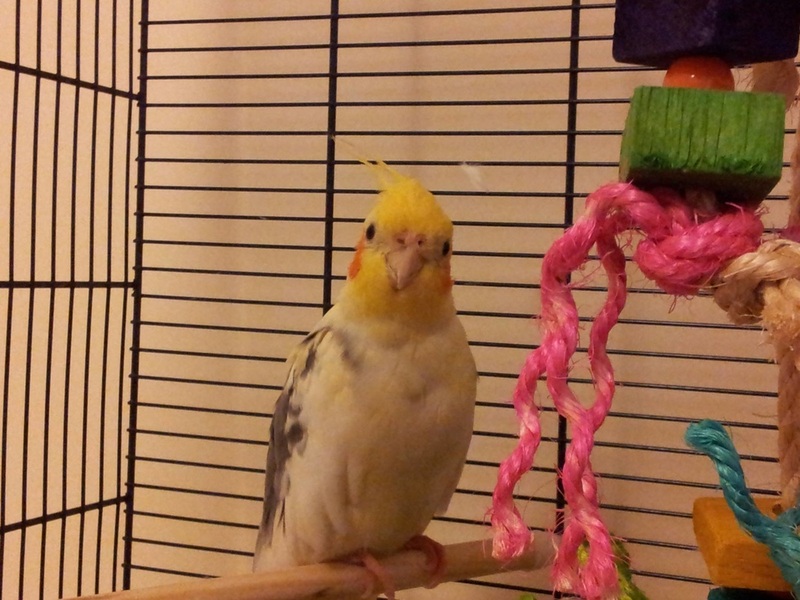 we have had some lovely new arrivals this week in the form of Candy who is a Galar, Sammy the cockatiel and Charlie the parakeet. 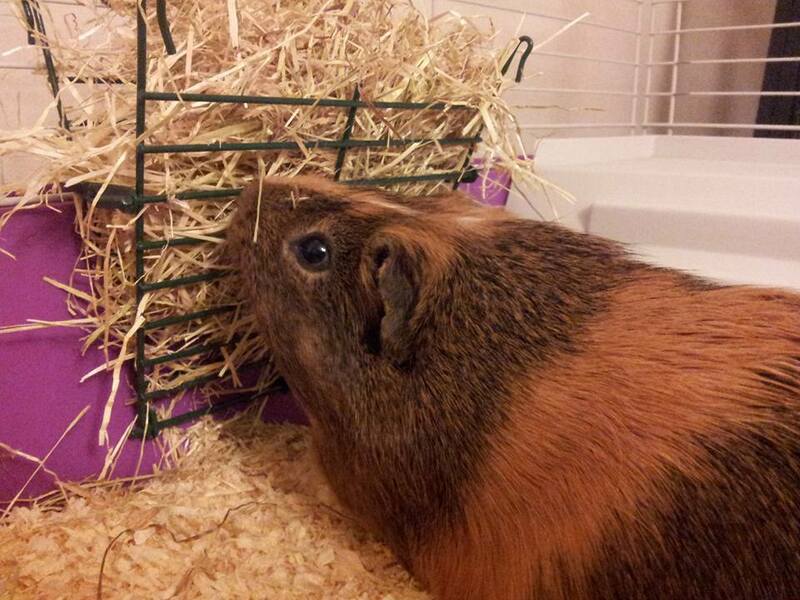 All have settled in well and enjoying being with us especially Candy who seems to love Mr Skittering Pig! Check out our new neutering service! If you have no time to take your pets to the vets we can help! See our prices and how it all works on our new header. Our first clients are Chilli & Pepper both are well and sporting the latest Medical Shirts to stop stitches being pulled, much better than those plastic collars! The bunnies sure do love their coriander! 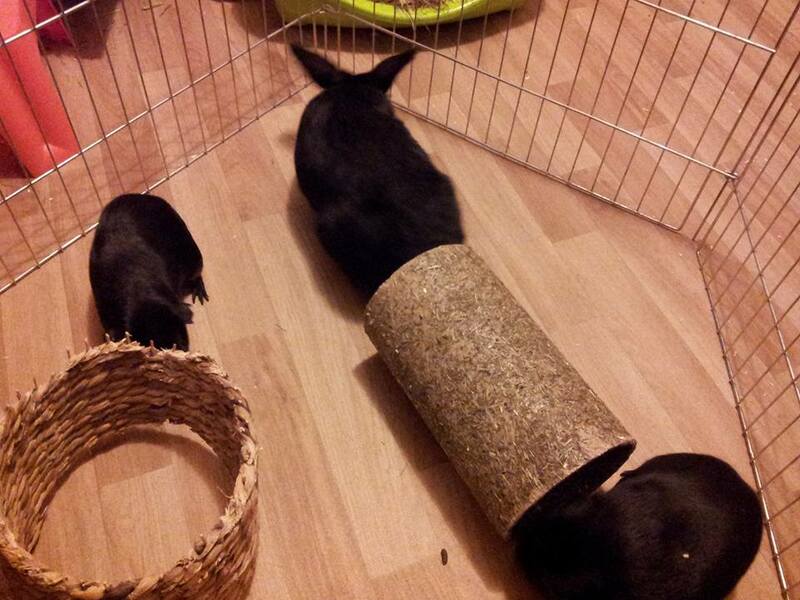 filled in a kitchen roll tube it gives them some forage play before destroying the tube completely. 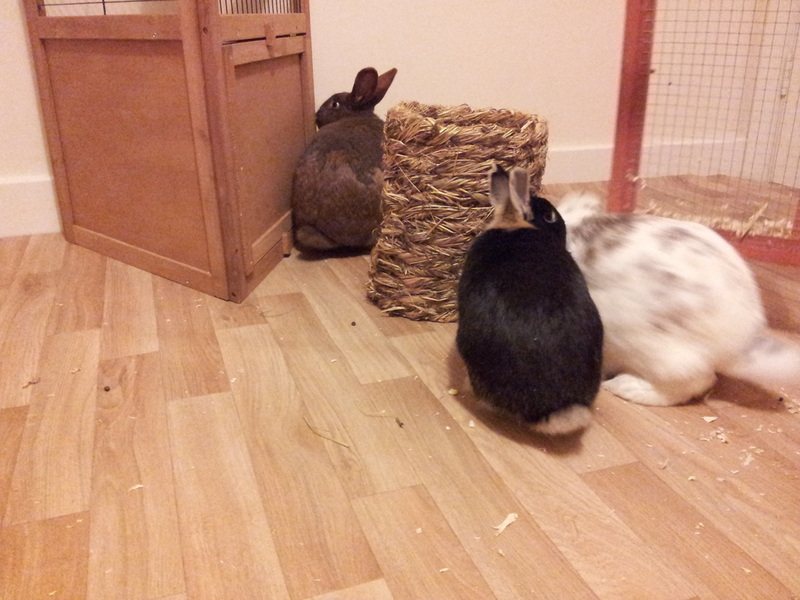 Fully clean out day today the buns loved having lots of free play at 6am! Heading out for the school halfterm? Lots on over the Easter break, book your pet into us for a nice comfortable relaxing holiday as well. Its birthday day here at Skittering Pig! extra munchables all around later. 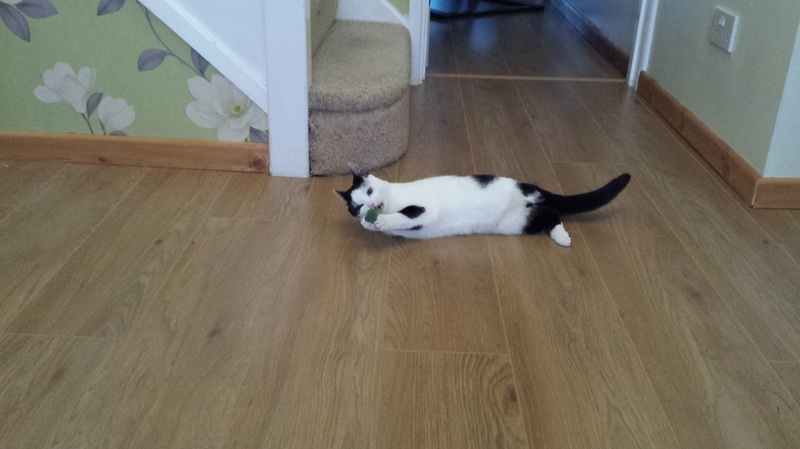 The adorable Yin, he follows me everywhere, I let him out in the morning and he hops about between the board room and the kitchen while I see to our other guests, here he is at 6am! with morning treat of coriander. 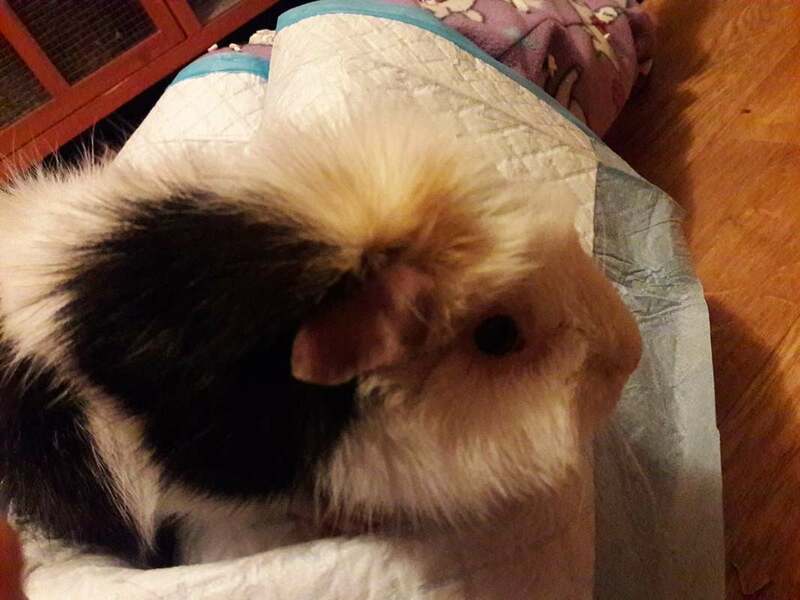 Here is the cuddly Munchie and the beautiful very cuddly Daisy coming out to play also at 6am, it was clean out morning they hopped around and played in the tunnels. Daffy was still in bed! she did come out but was sooo quick today I did not get a good picture. 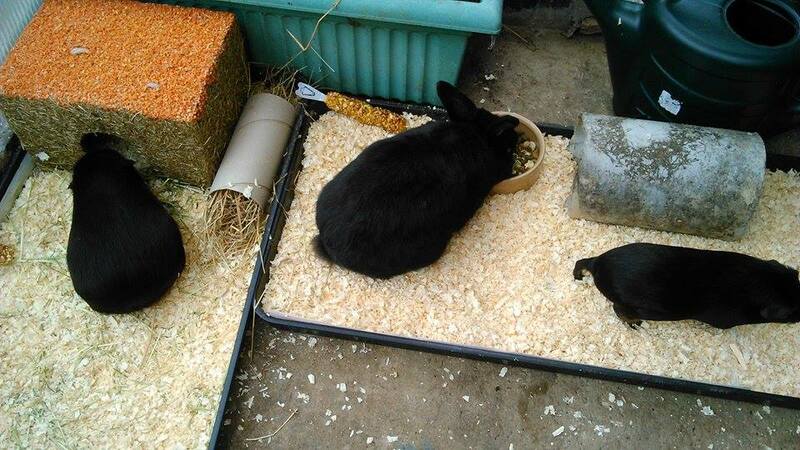 They love their bunny pan and are happily eating the straw and hay! 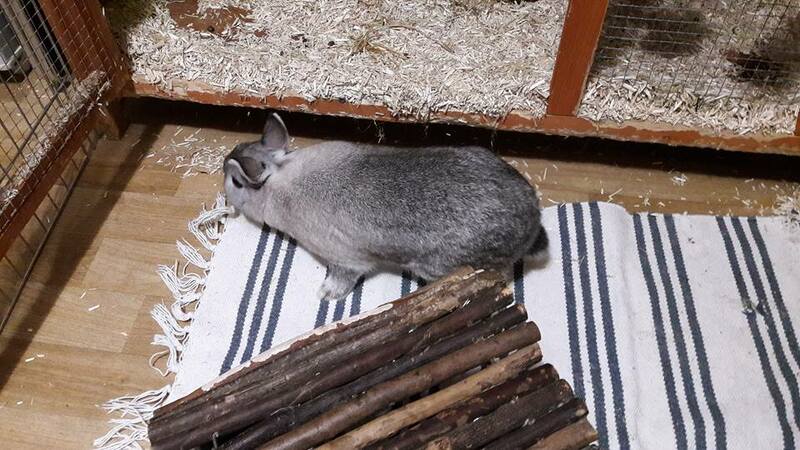 Wow we have had a busy few days, we have changed our board room and accommodation, we now have some smart new flooring that is easy to clean and a large bunny hutch with run attached. We welcome bunnies Daisy, Daffodil & Munchie, also bunnies Cinnamon & Nibbles plus the cute Yin is with us too he has taken to following me around; so sweet. 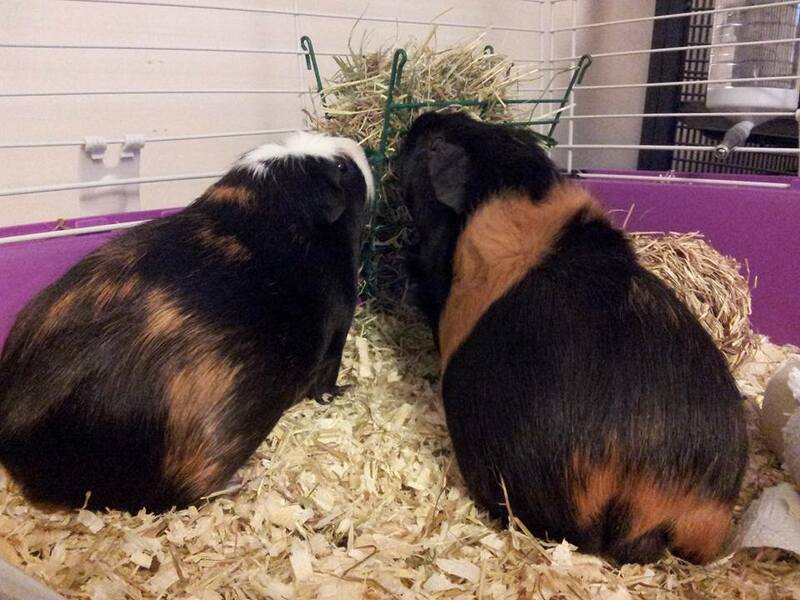 Ruby & Lulu are still in charge and are keeping a very careful watch on the newcomers. 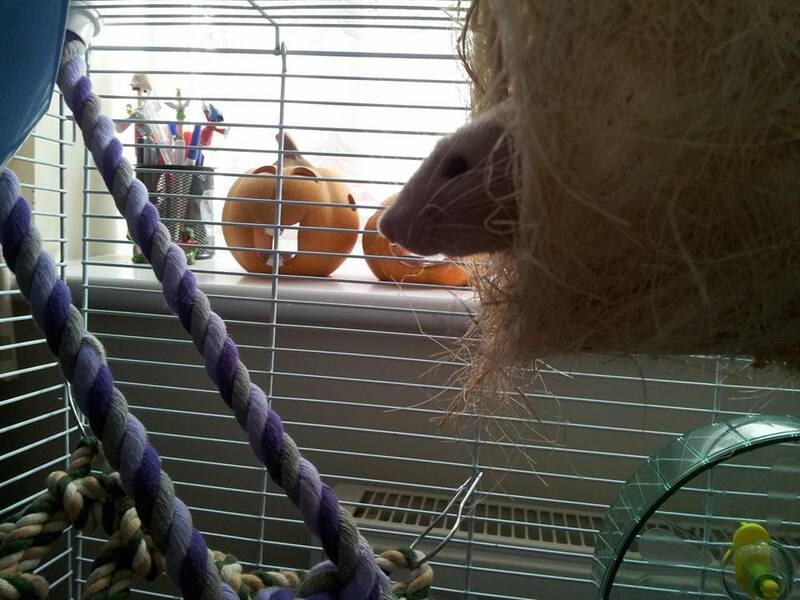 Sybil is taking it all in her stride and just likes to wizz around in her ball. Pictures to come. 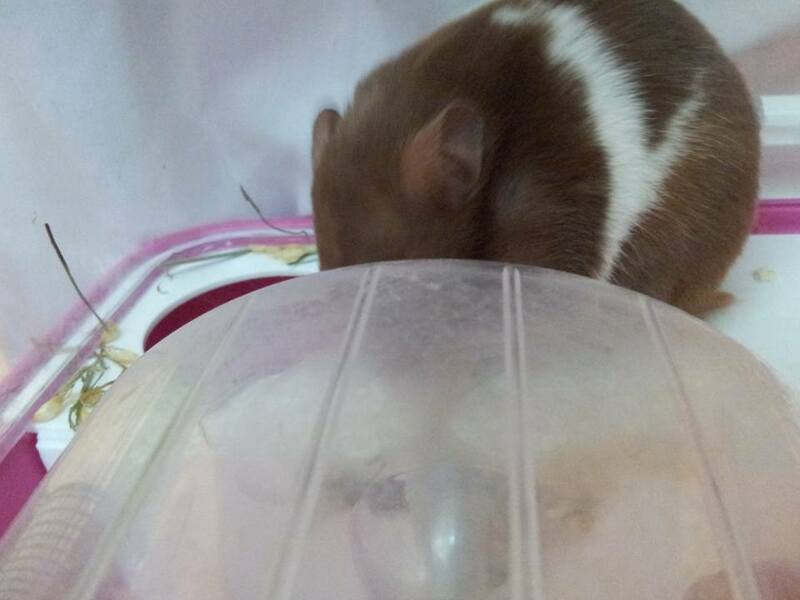 Hot off the press pictures of cute hamster Sybil just about to go into her ball. 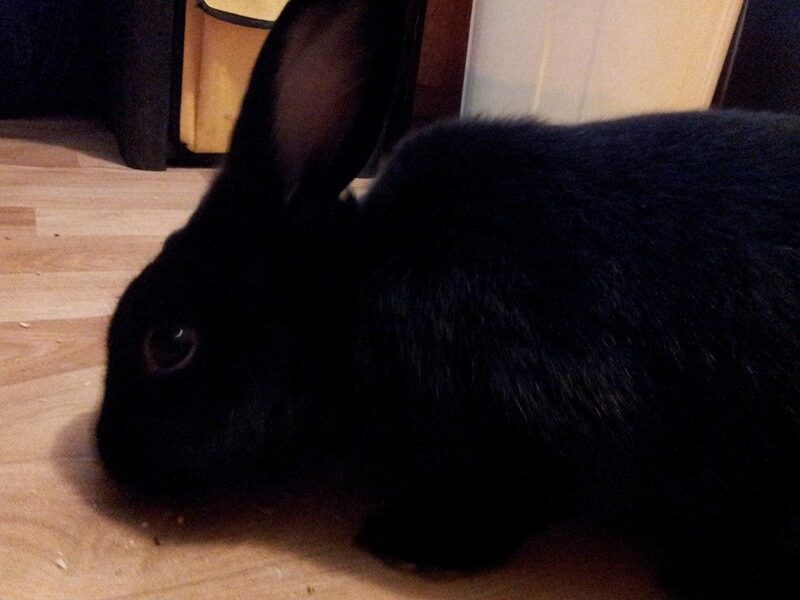 Pictures of the adorable bunny Yin, he is very cute and friendly. 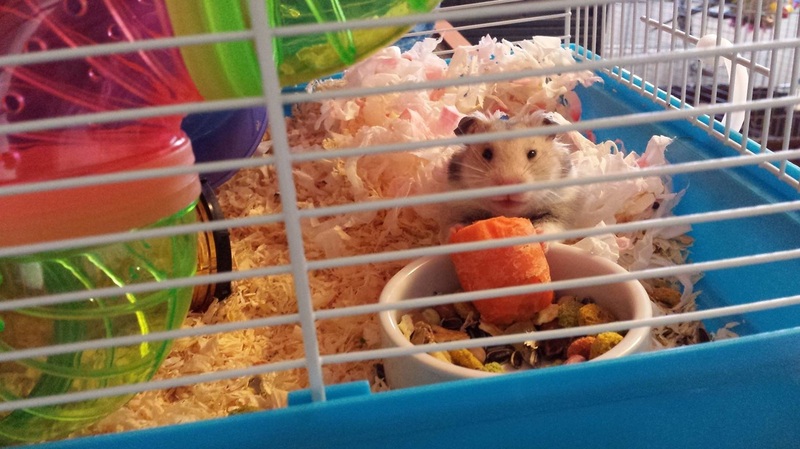 Today we welcomed Sybil a very active cute hamster. Our guests and pets were very appreciative of their gifts. 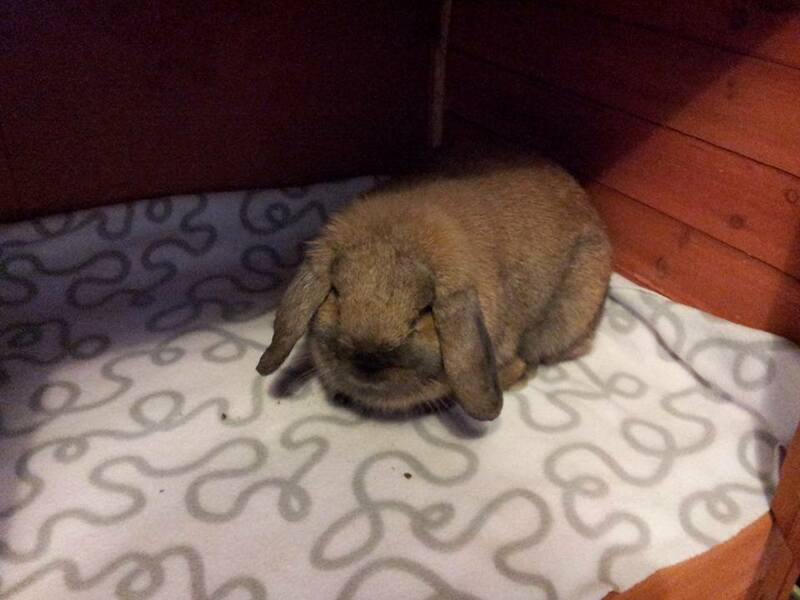 We welcomed today Yin a gorgeous young bunny. Merry Christmas, thank you for making our first 6 months a success! 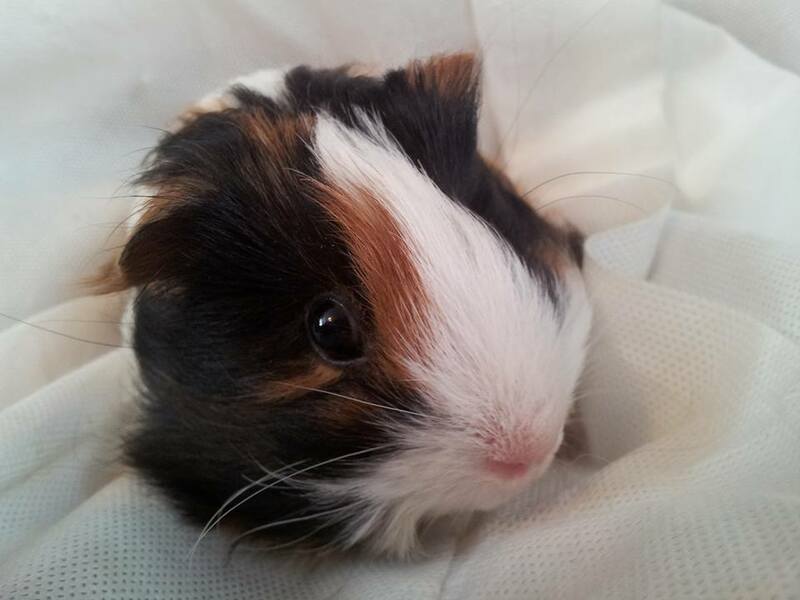 We hope you are enjoying our pictures of our very cute guests. Ruby & Lulu, Have hung up their stocking ready for Santa! Connor, Here is Szarik's playmate, he is a big teddy bear and so cuddly. 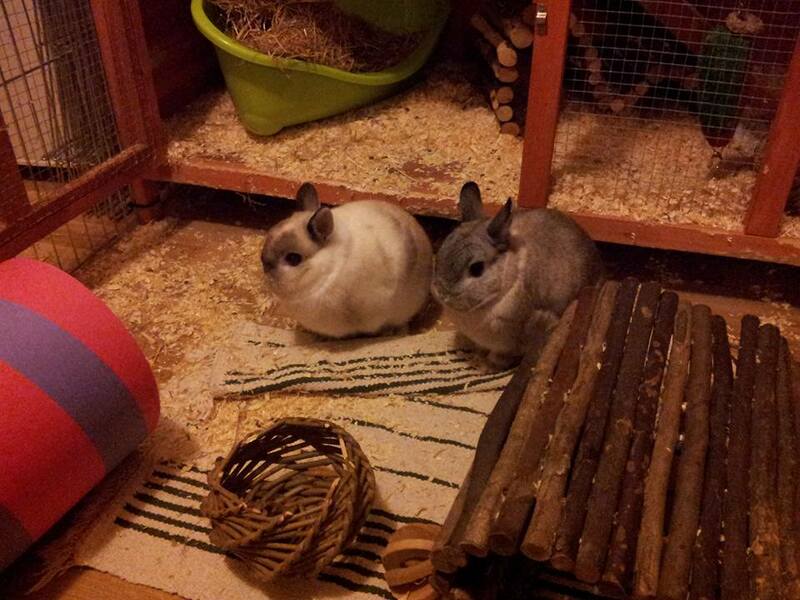 Chilli & Pepper, completely bonkers bunnies! Jake & Szarik, adorable little bird and snuggly piggy. 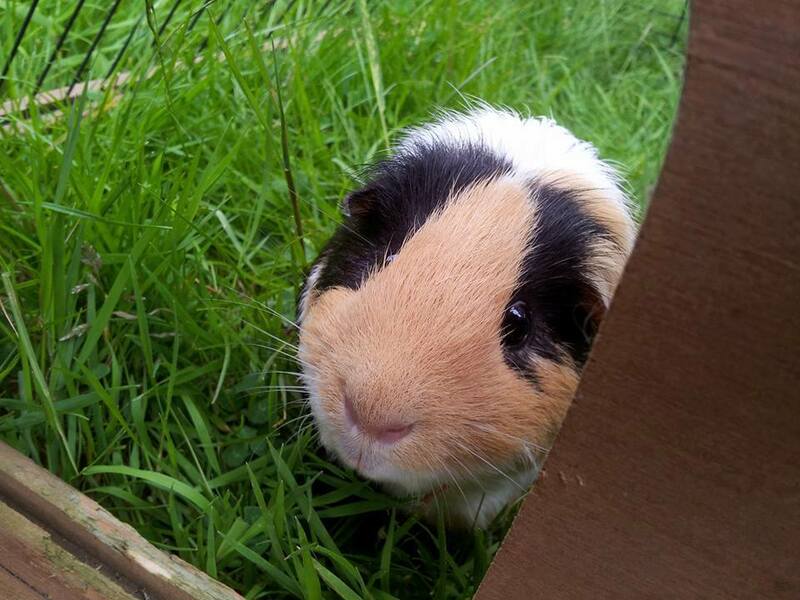 Toffee, Playing in the lush grass. 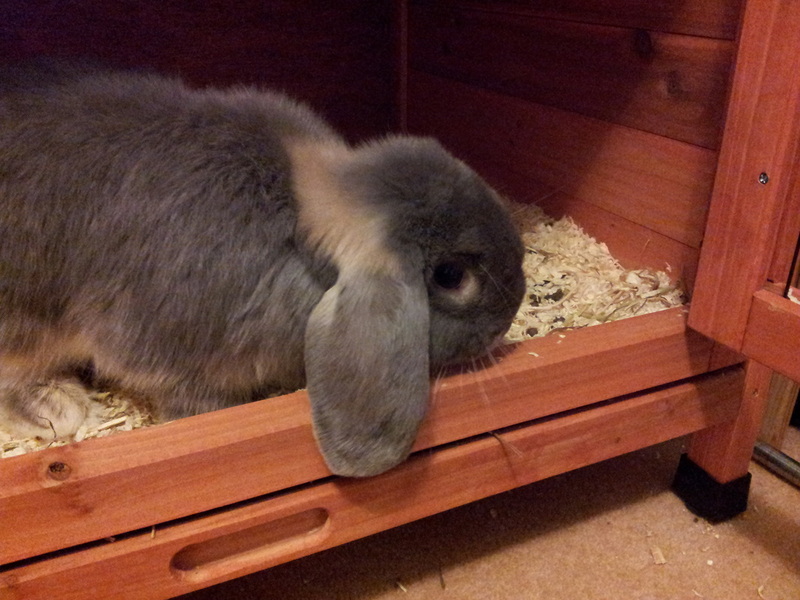 Milo, some more cute bunny pictures. 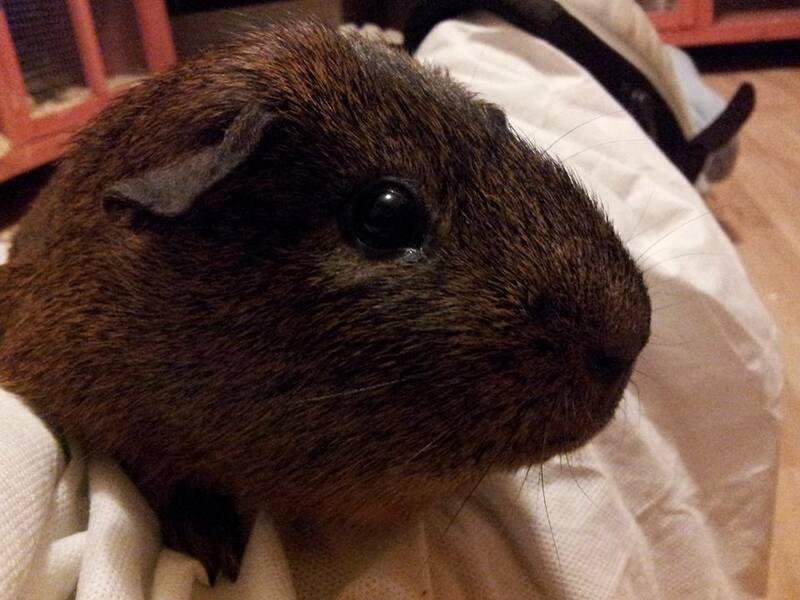 Sputnick, Our piggy before Birdie, he was so cute and very lazy! Our Birdie helping with the Seasonal wrapping. Ruby & Lulu, As the girls are staying for Christmas, another picture of them being adorable. 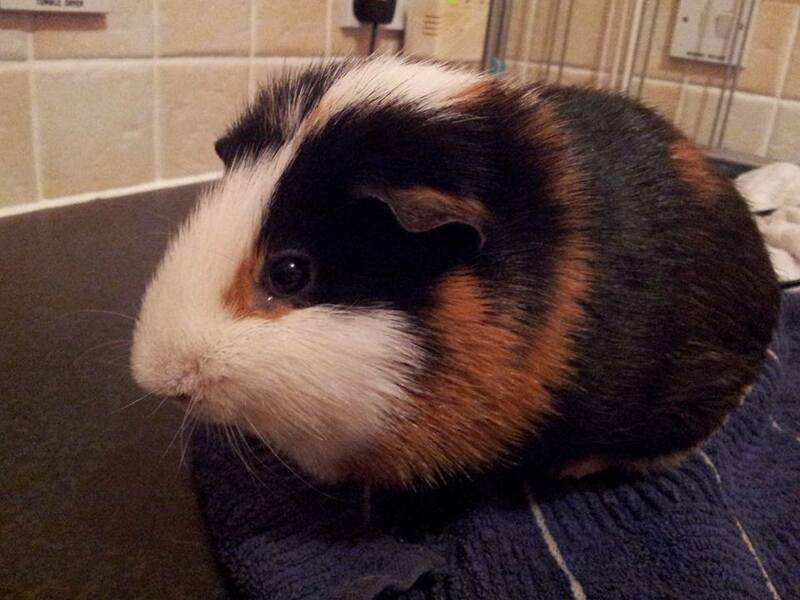 Torro, this little chap comes with Rocky & Toffee, he is very sweet and very friendly. 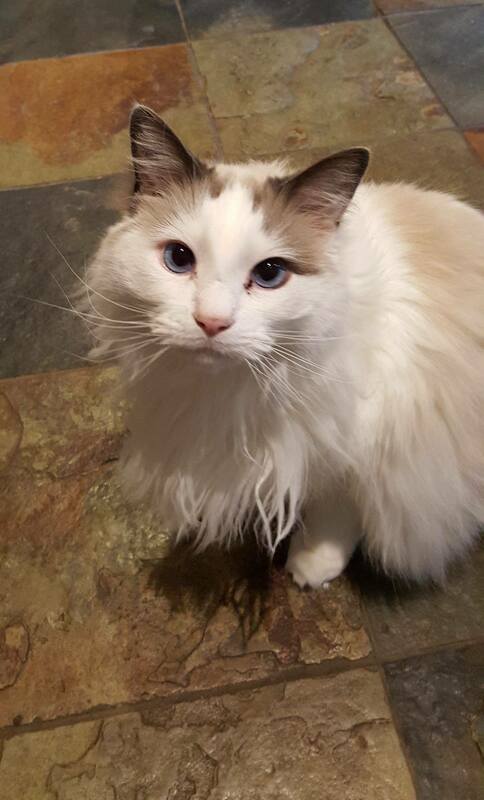 Angel, our very own cat. 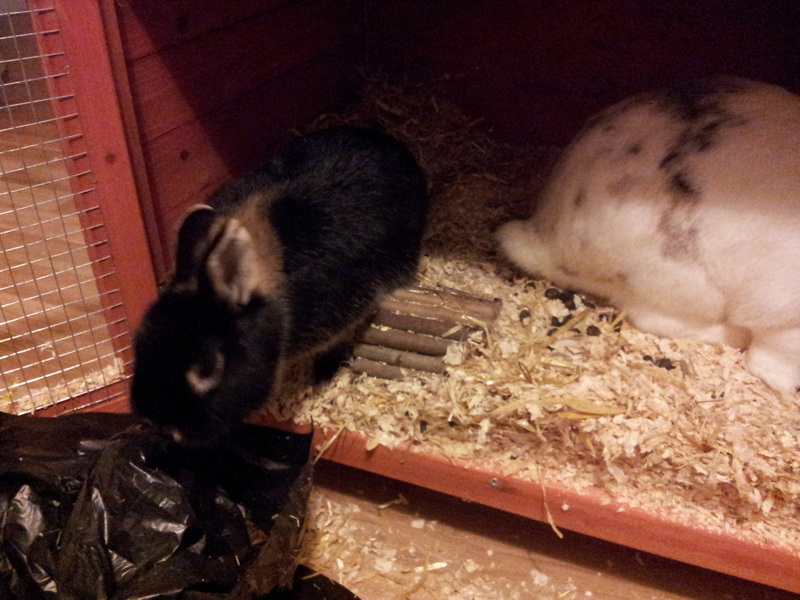 Jake & Ellwood (Ellie), Our friends house bunnies. Happy Feet Pets looked after our Birdie while we were on vacation. Dandelion & Milo, we had had Dandelion previous, this time she came with her new playmate Milo. 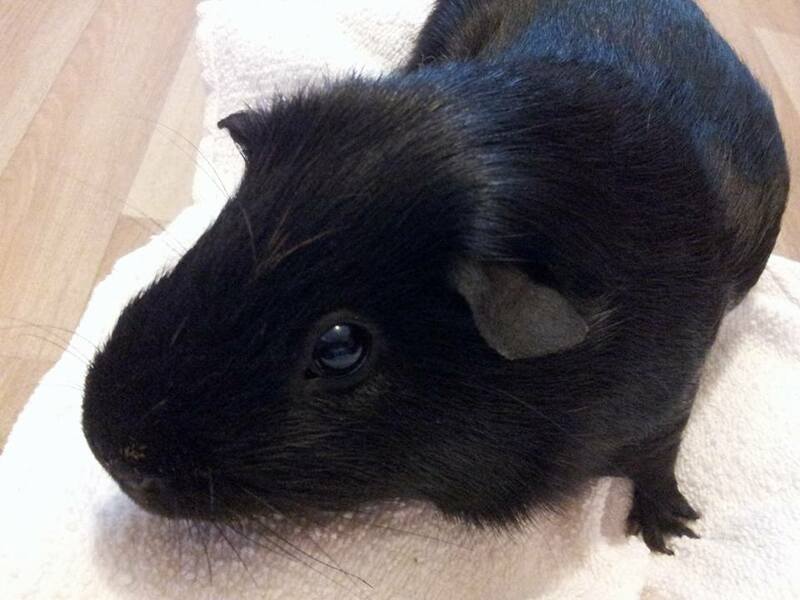 Milky Way, this little chap and his friend Smokey came for a nail trim and brush. Lola, on speaking to her owners this lovely lady is possibly a relation of our own Birdie. 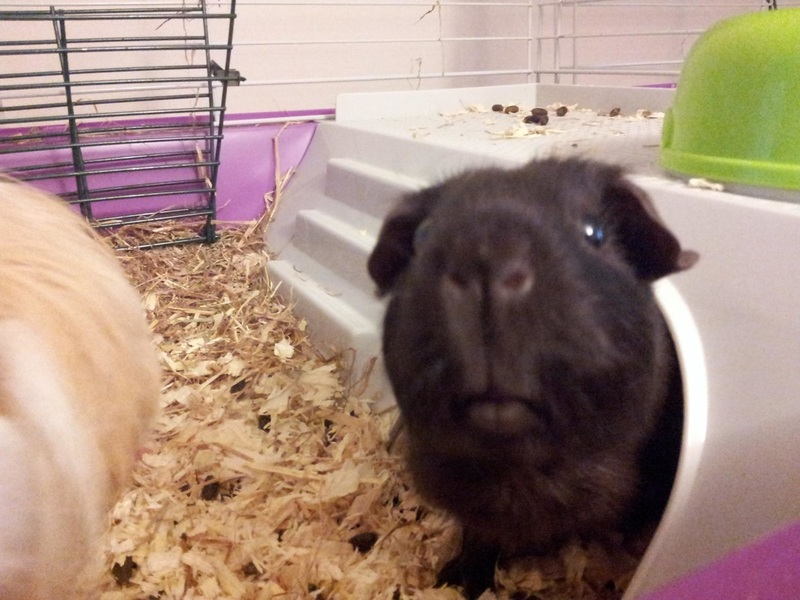 Connor & Szarik, these guys have stayed a few times with us now and are always adorable and so cuddly. Lulu & Ruby, the gorgeous girls. 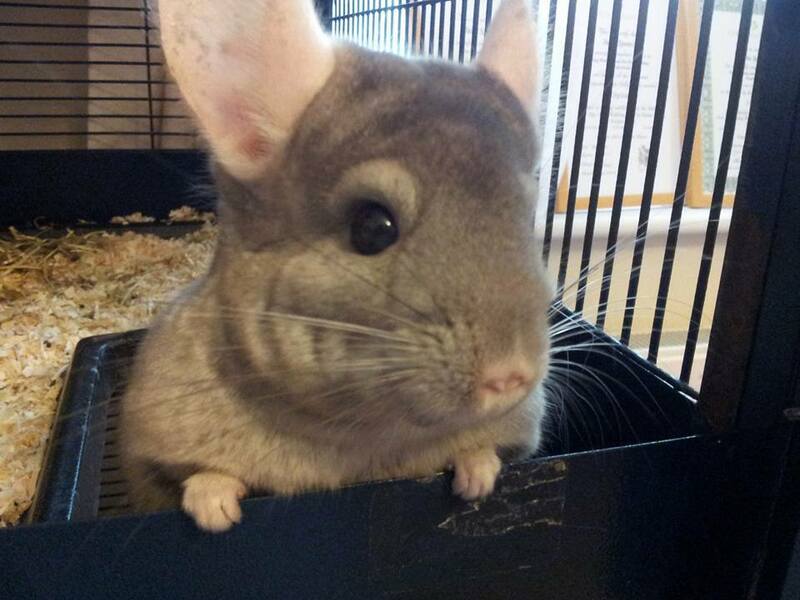 These beautiful chinchillas are currently staying with us and are very adorable. The girls are also about 2 years old. 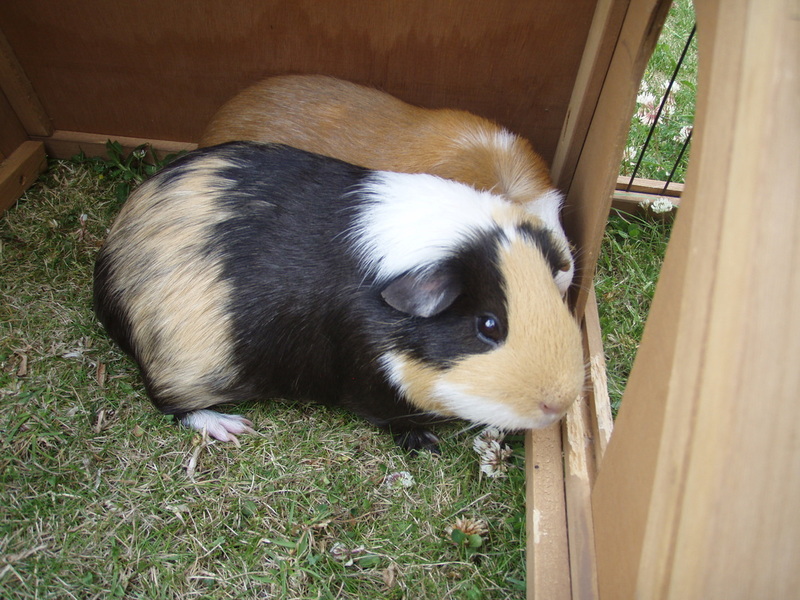 Rocky & Toffee, these two boys were our first boarders, they have been back to us several times and are delightful to have they are about 2 years old. 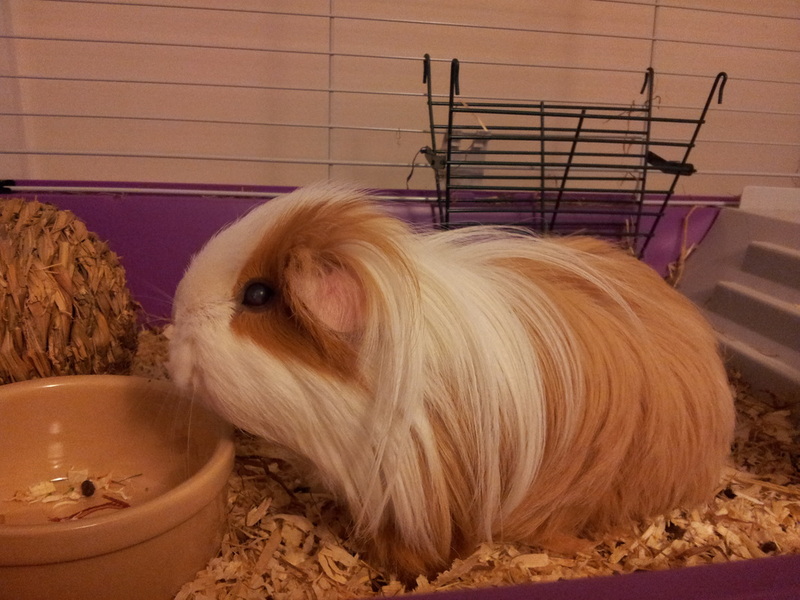 First picture is of our own gorgeous guinea pig Birdie. 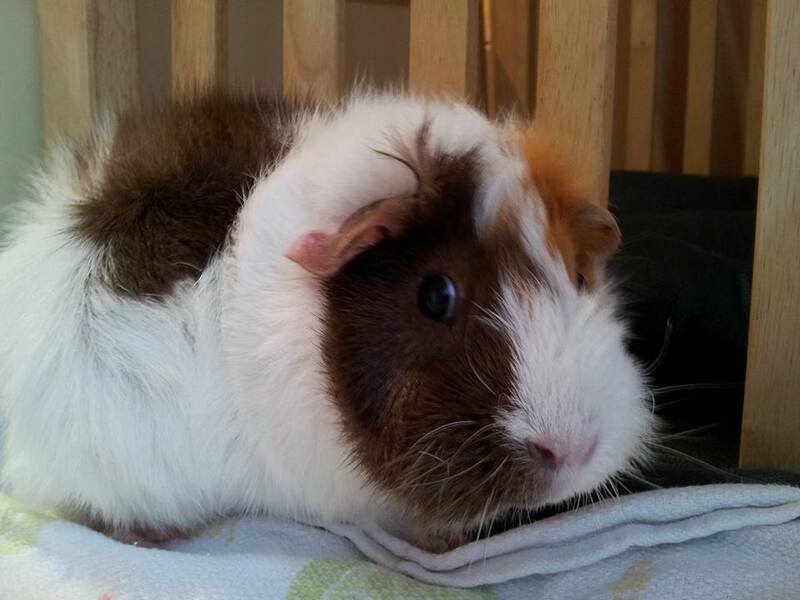 Birdie is a 2 year old little boy piggy. Today we are getting into the festive spirit! Our decorations start to go up plus our small tree. 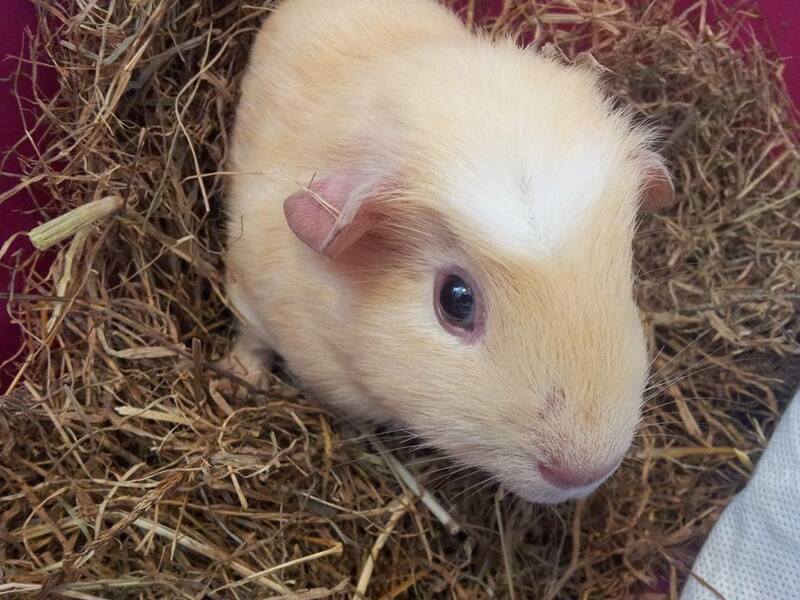 From tomorrow we are going to run a Skittering Pig advent calendar featuring a cute picture a day of our boarders that have come to stay over the last six months. We have been delighted that our guests have been happy with our services and that we have had repeat business too. We would like to wish everyone a very Merry Christmas and a Happy New Year. Well with Christmas just around the corner our residents are looking forward to seeing the pictures on the Advent calendar. We still have vacancies for your pets if you are heading out over the holiday period. 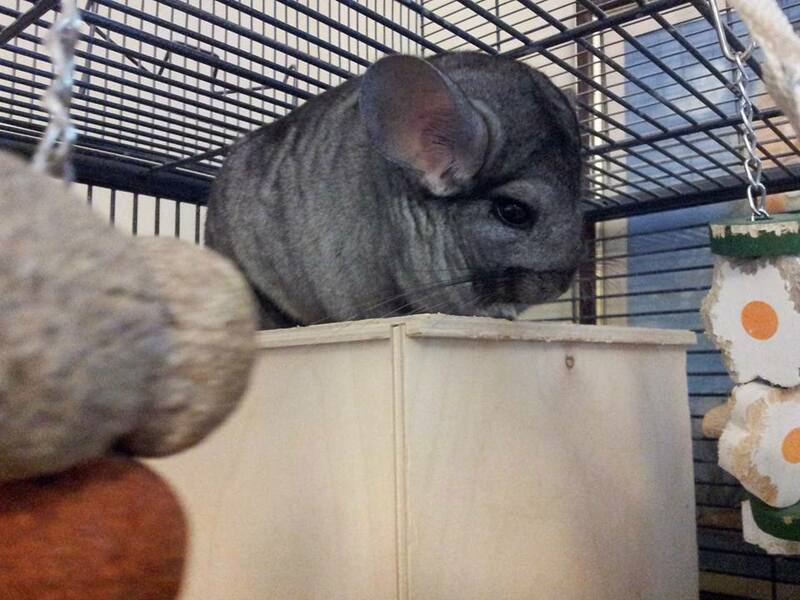 Our beautiful Chinchillas Ruby & Lulu are staying for Christmas! 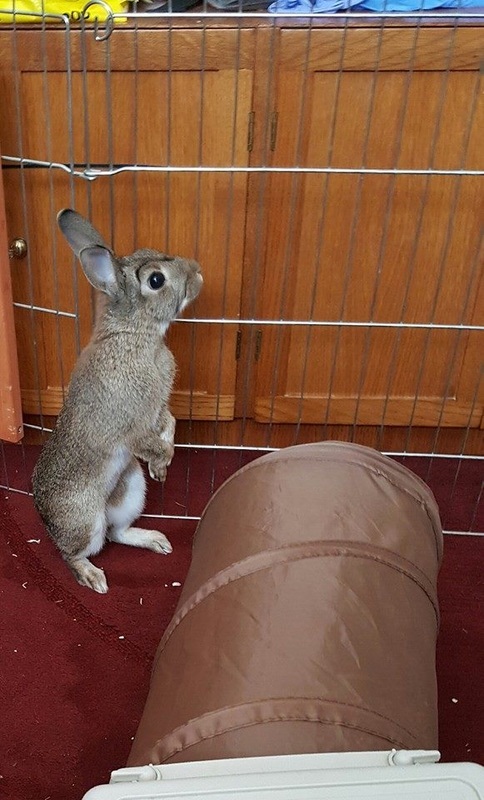 these lovely girls are having more play outside of their cage now and enjoy racing each other up the stairs where Lulu like to leap on top of the laundry basket I think she thinks its a winners podium! 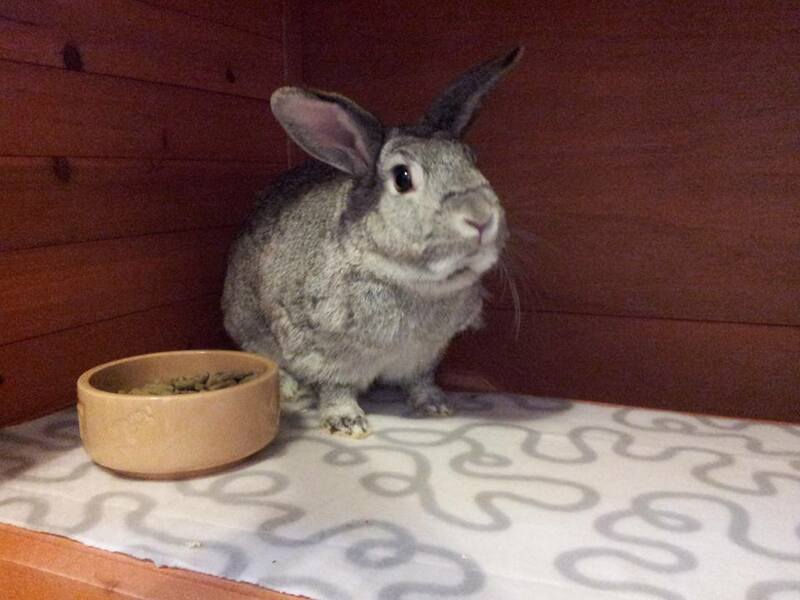 Yesterday we had the lovely Eric the bunny drop in, he looked so smart after his pamper and nail trim. Don't forget we are offering a stress free Christmas for your pet, book your pets in today for a quiet, lazy holiday. All boarders will receive a gift from Santa. More Happy Birthday! 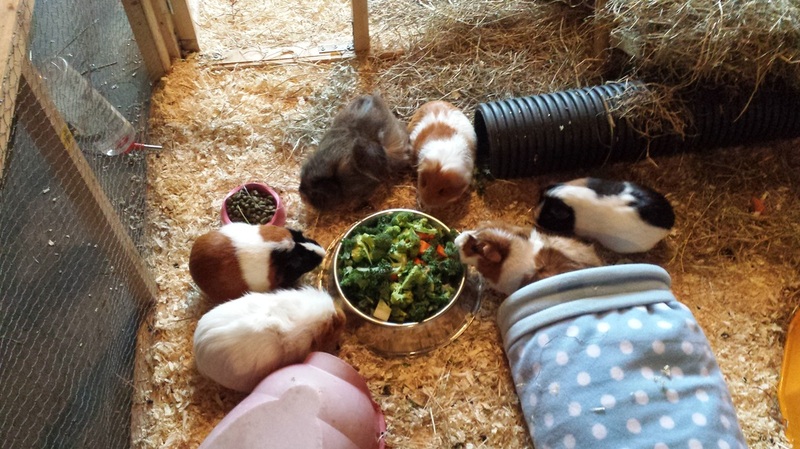 celebrations but in the human form today so everyone gets treats :) Extra greens for Birdie guinea pig, cheesy treats for Angel the cat, extra flake for Fish and a chinchilla treat for Ruby & Lulu. Jingle Bells! Jingle Bells! Christmas is upon us and with relatives and friends staying or yourself staying with relatives why not give your pets a break. We are offering peaceful surroundings with no stress while you can enjoy the festivities. All pets will receive a gift from Santa too! We are open all through the holidays. 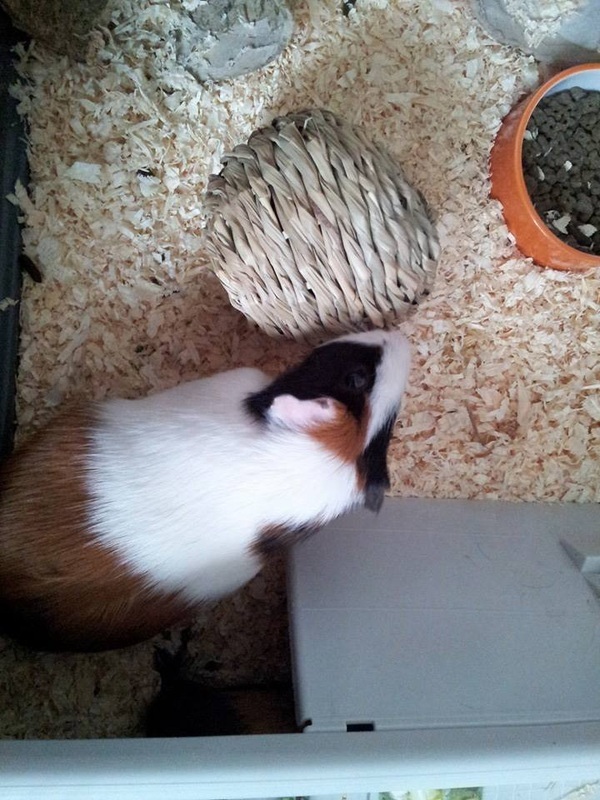 thank you @Skitteringpig for looking after the guinea pigs. they had a fab time, totally spoilt! 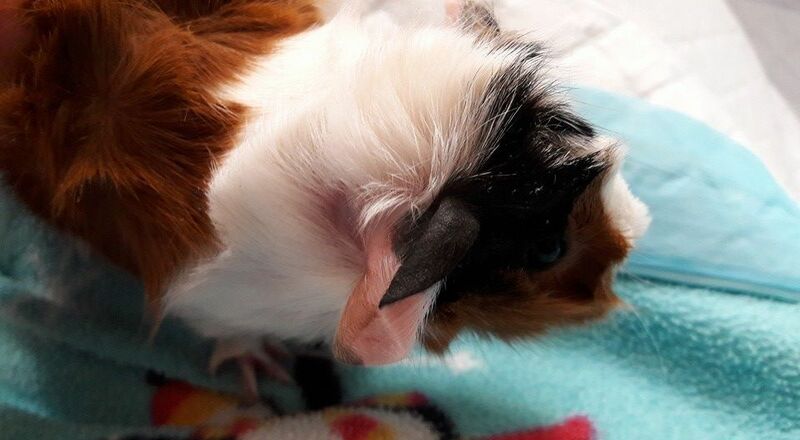 Thank you for the outstanding care and attention given to my daughters guinea pigs. Very highly recommended. After a clean out and brush or dust bath the guys and girls have tucked into breakfast and are now just chillin! Played them all some soothing Andre Rieu music last night to help with the horrors of fireworks, glad to say everyone was fine and no one seemed stressed they liked the music too. What a busy day yesterday! 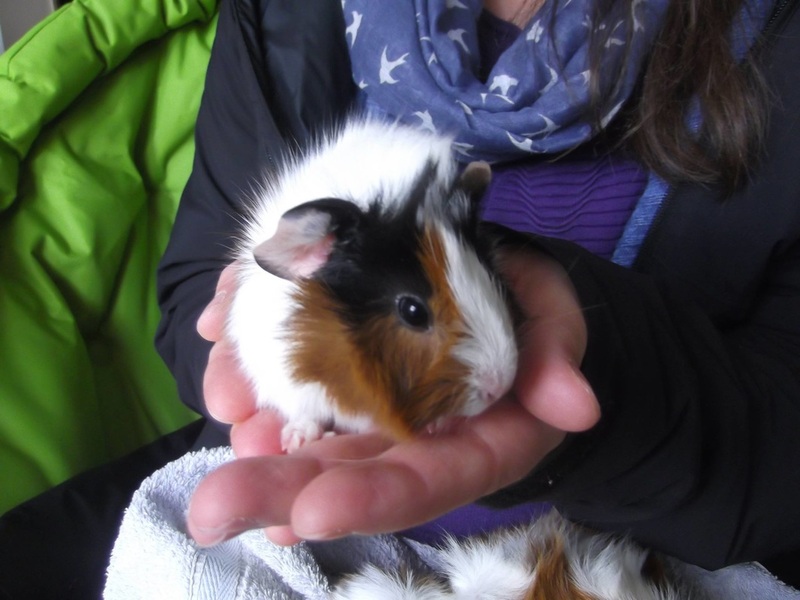 Lots of new guinea pigs, Coco & Pixie are two adorable girls, they are 5 months old and so sweet. 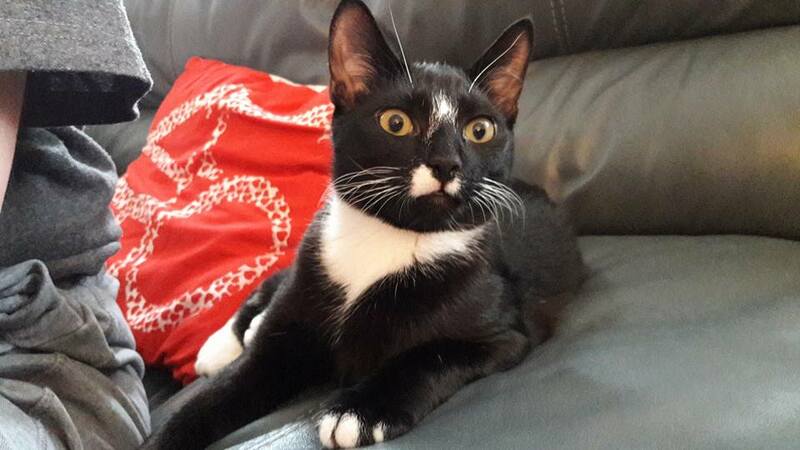 They have been joined by boisterous 6 month old boys, Pippin & Po totally cute. 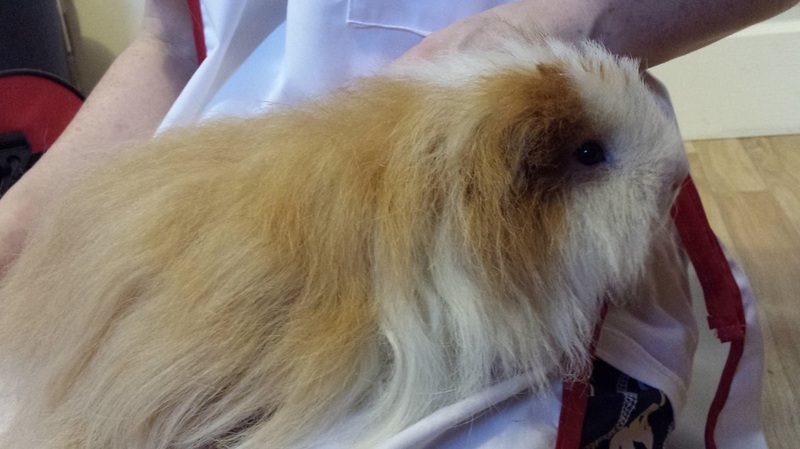 We also had the delightful Scruffy & Dewey who popped in for a pamper session and nail trim. Lulu & Ruby decided to keep watch on all the newcomers, Lulu took to her top perch peering over the edge at the piggys, while Ruby sat on her branch at the bottom to keep an eye on the lads in the hutch. 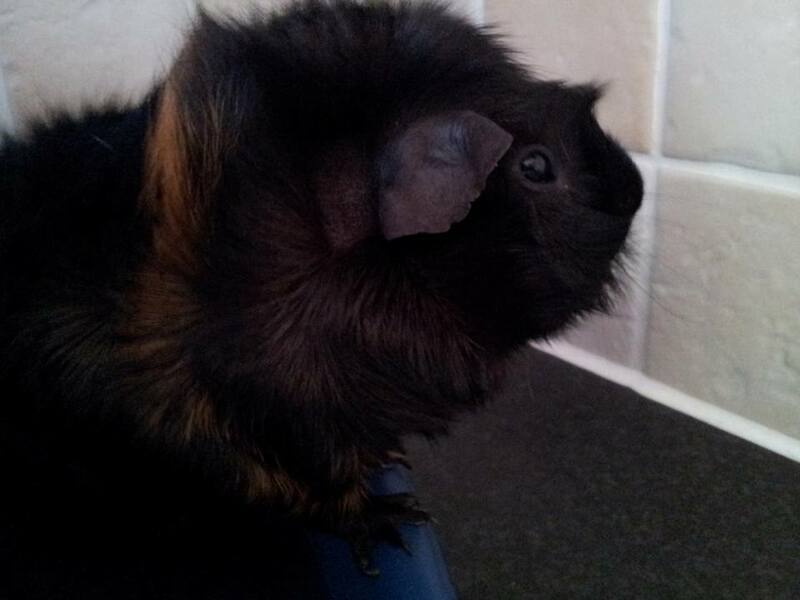 The Princesses have been making lots of squeaks to which the piggys have been squeaking back and chatting away. Sounds like a girlie gossip!